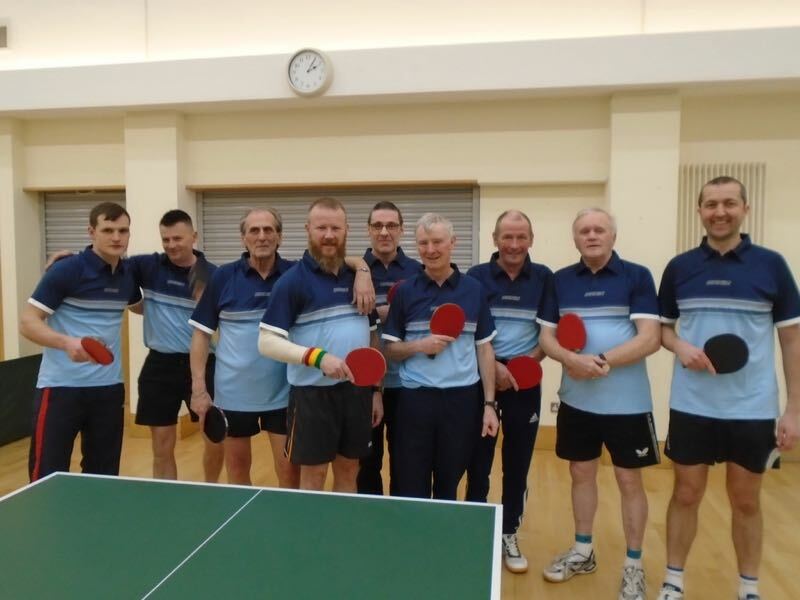 Photos from the Belfast v Leinster League Match 2019. 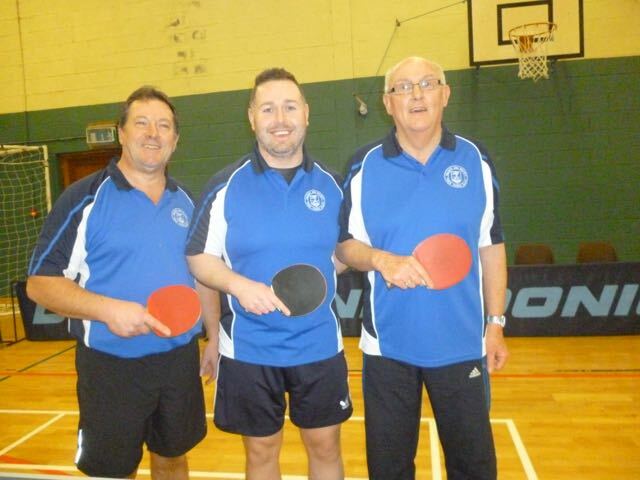 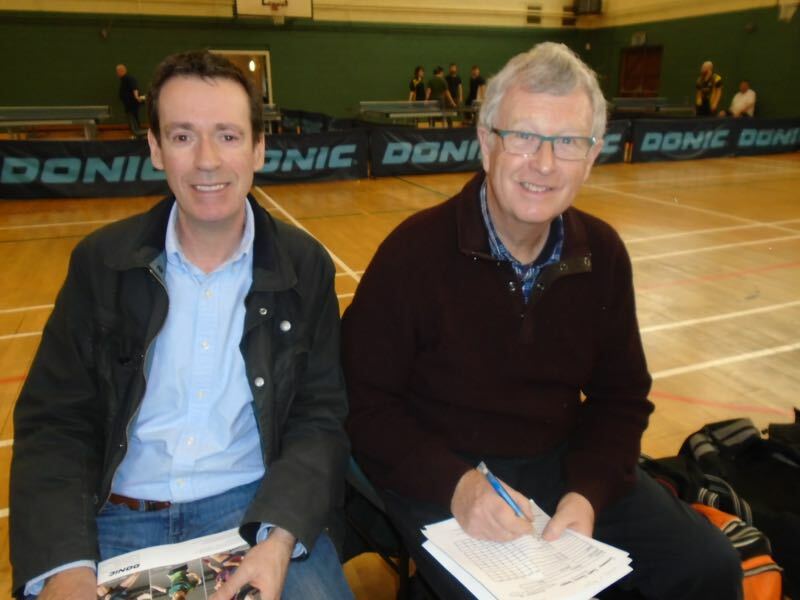 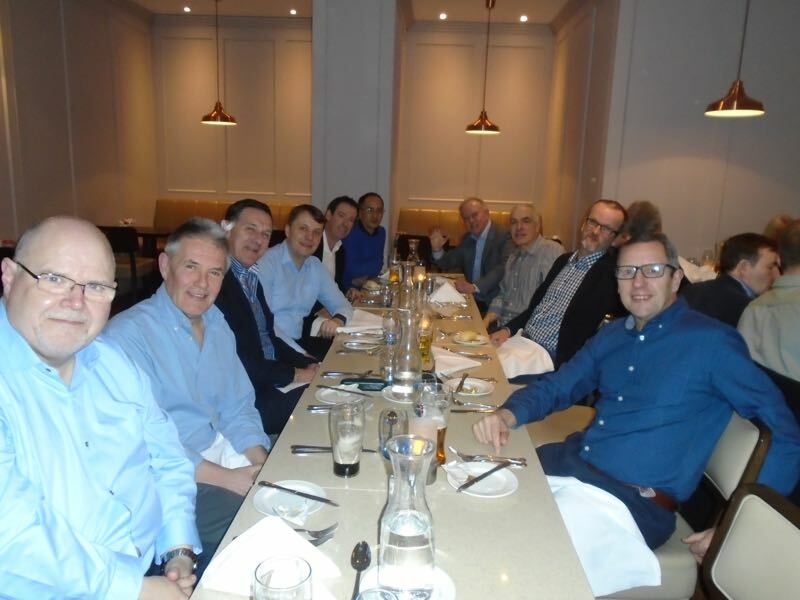 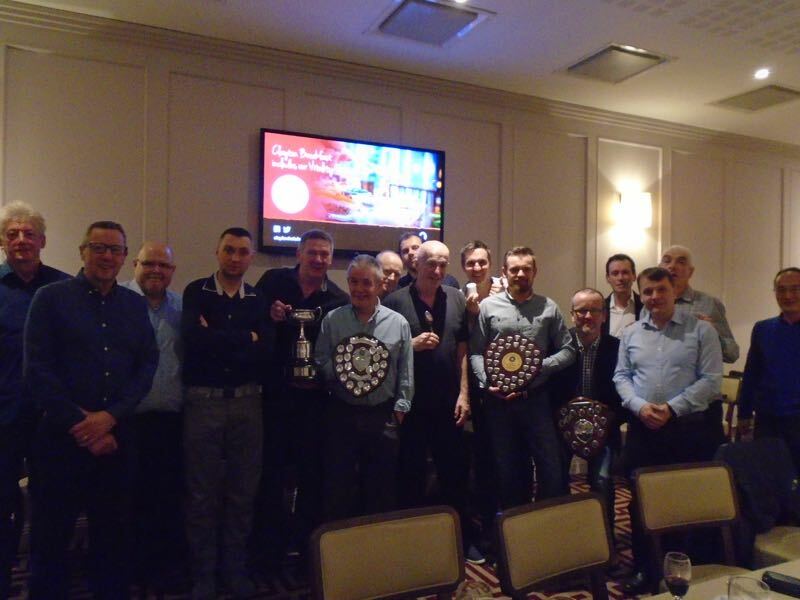 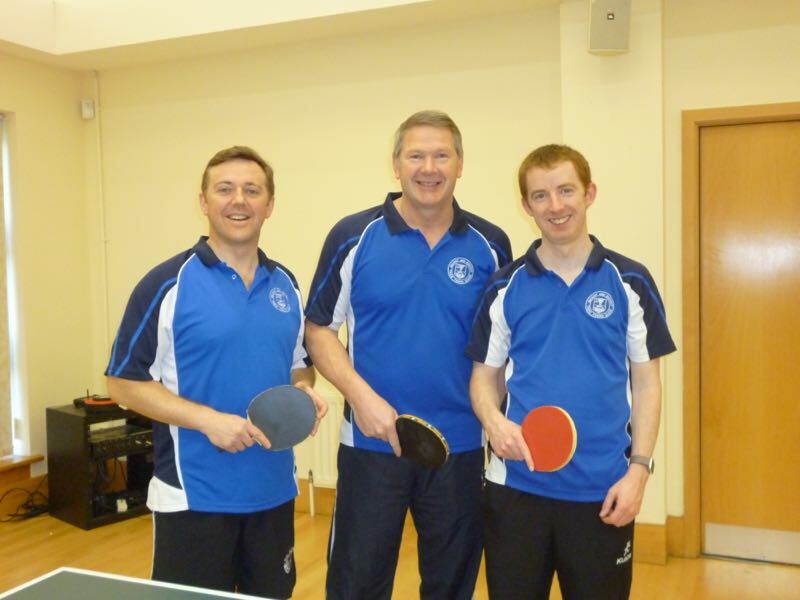 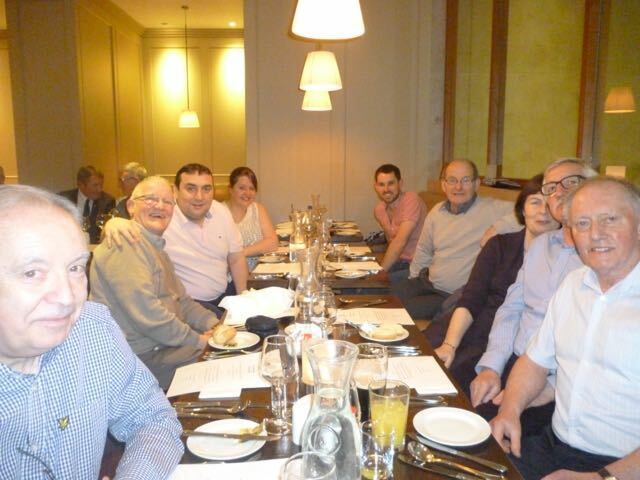 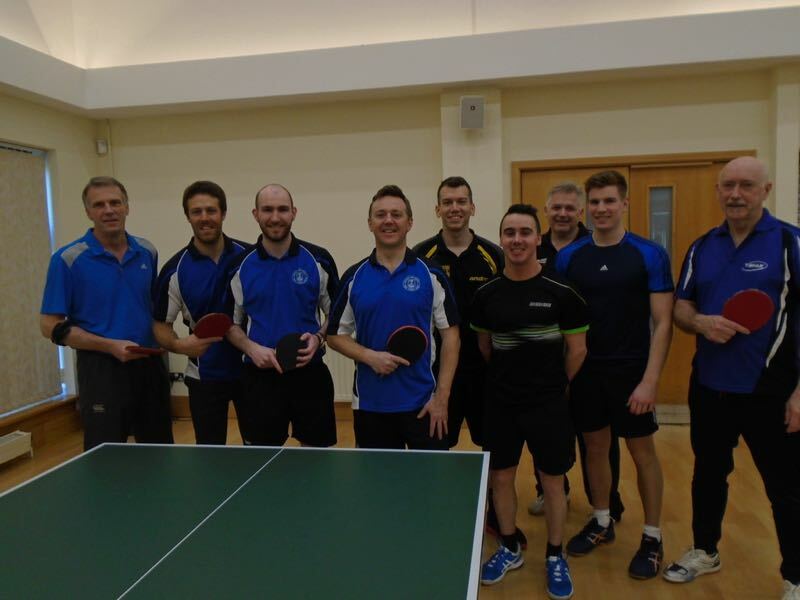 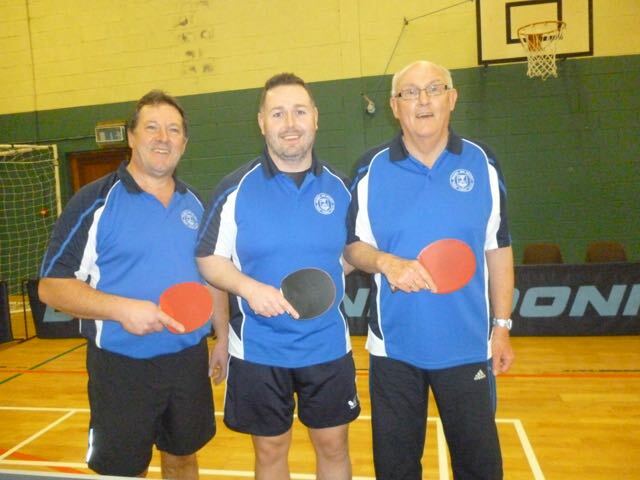 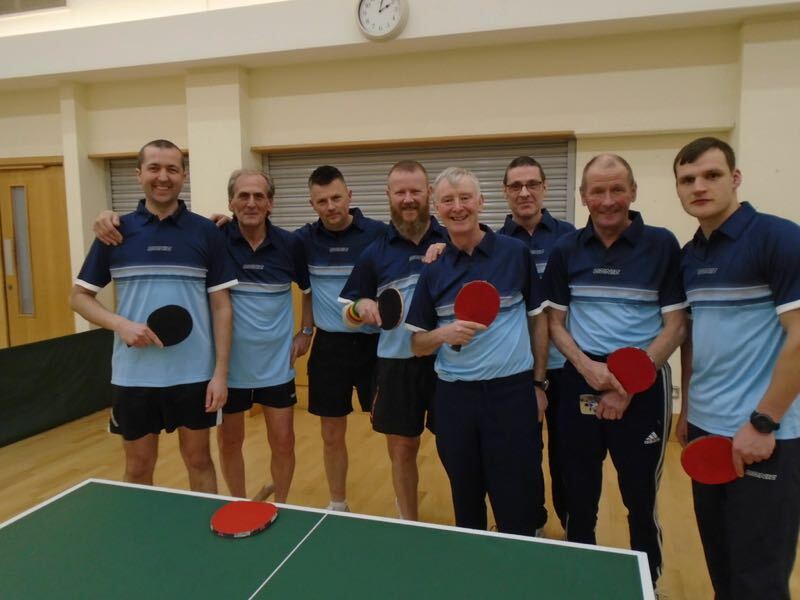 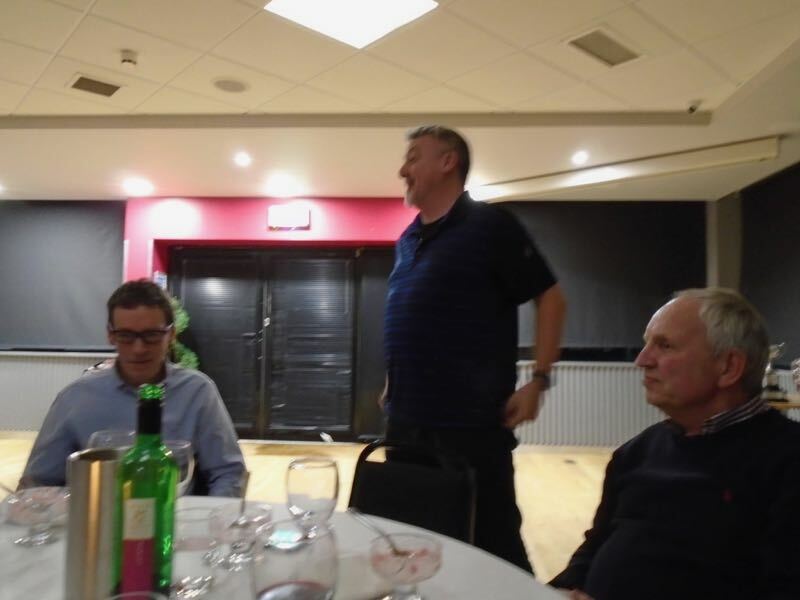 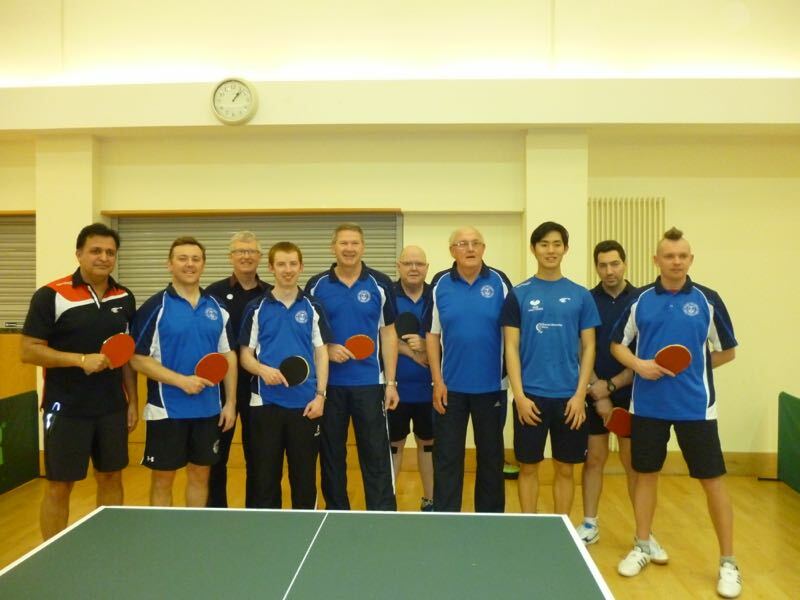 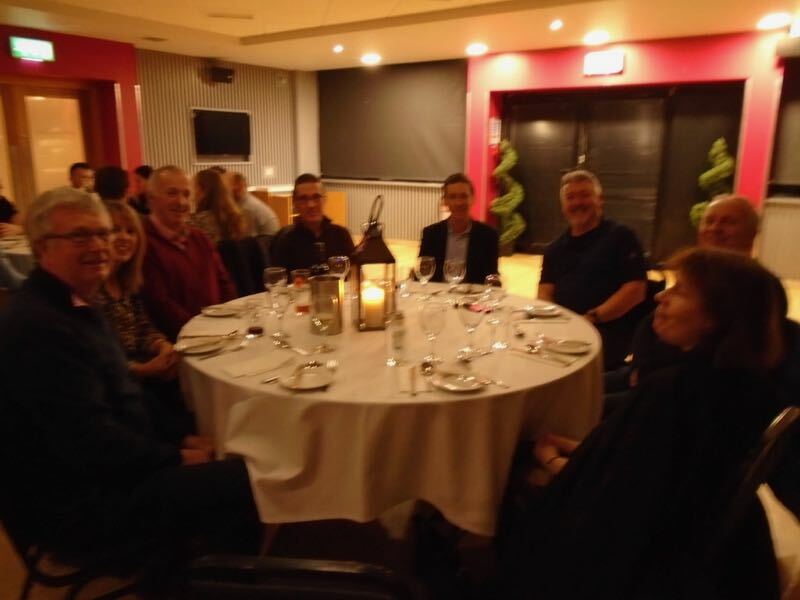 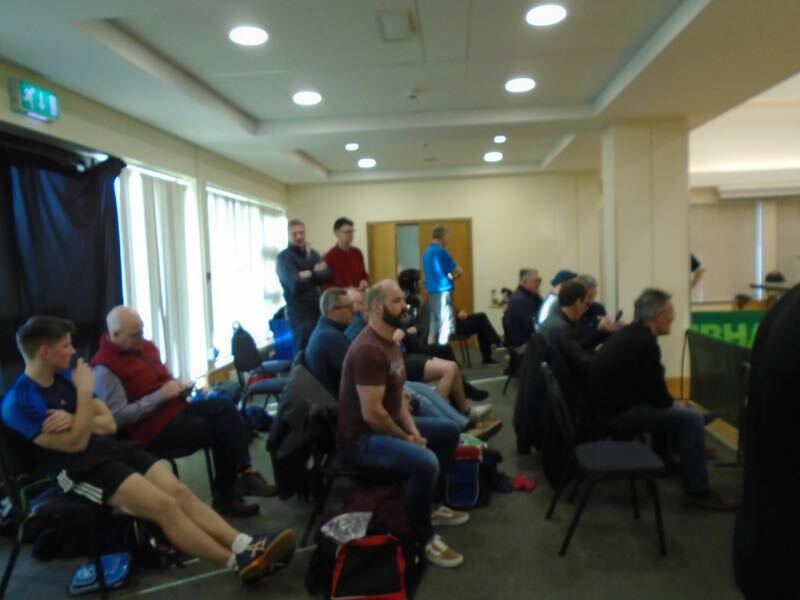 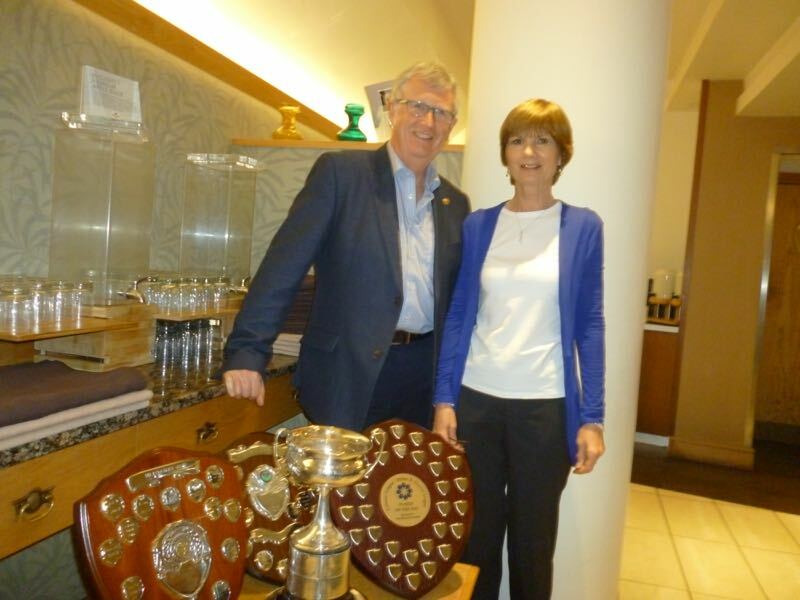 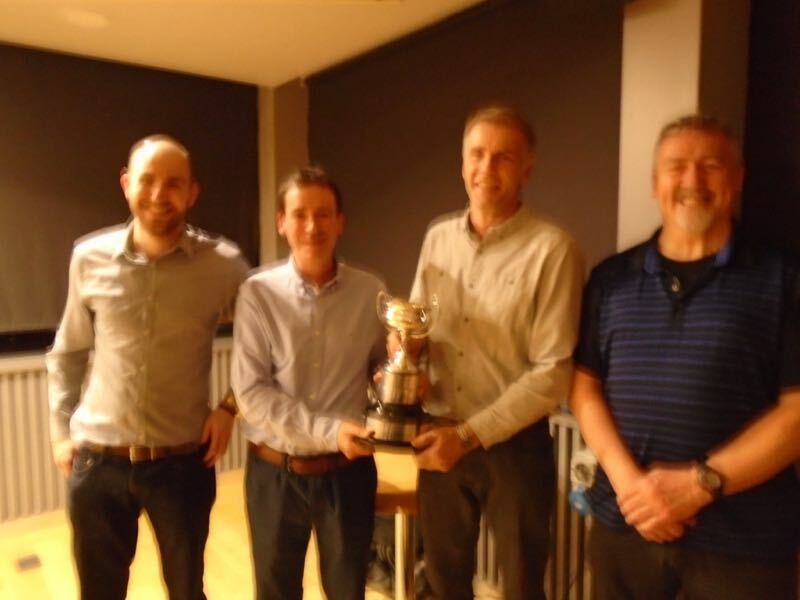 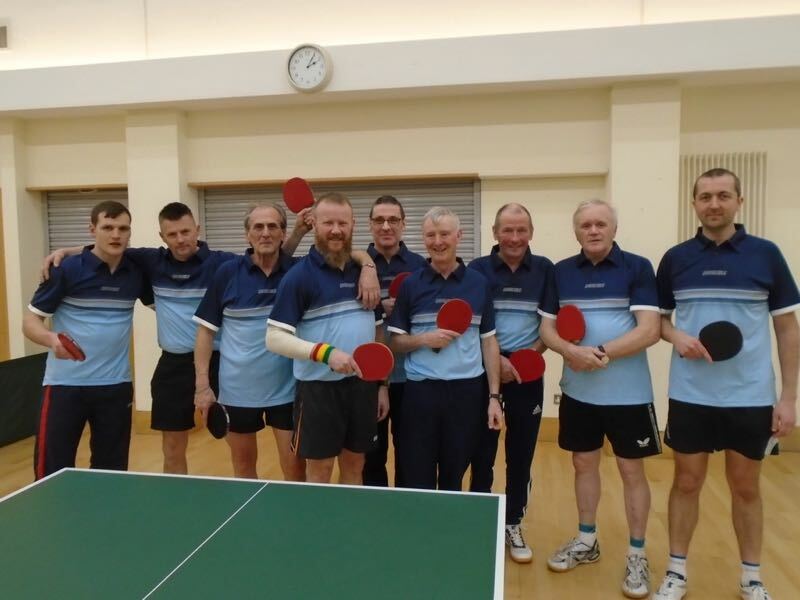 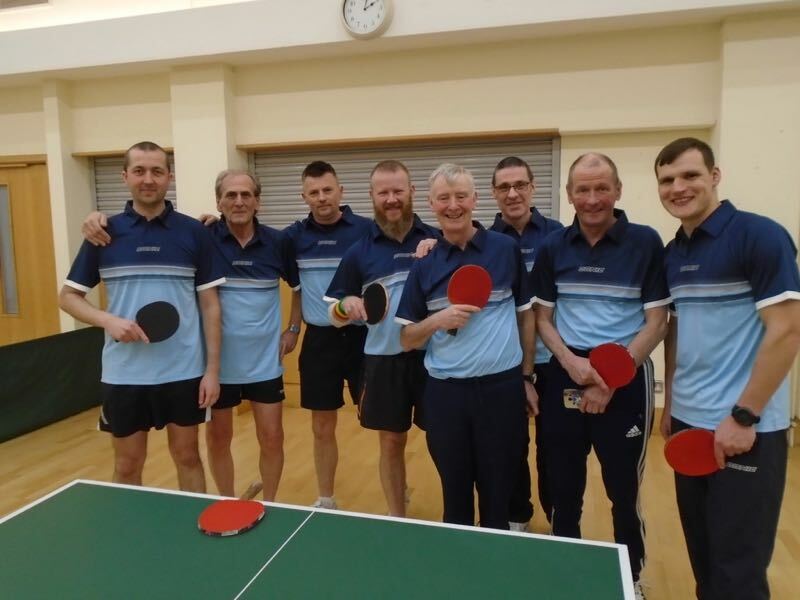 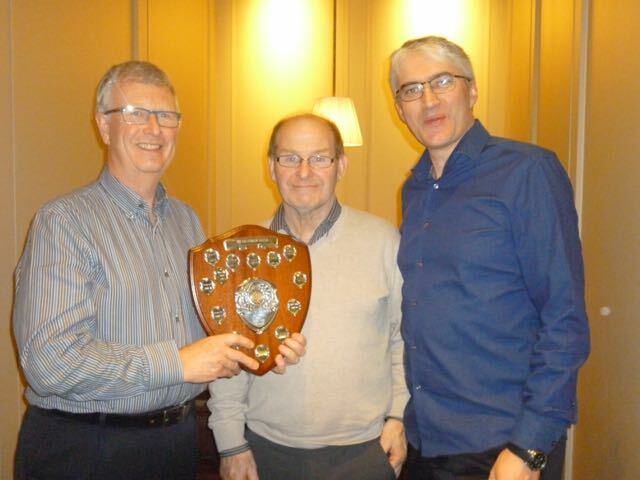 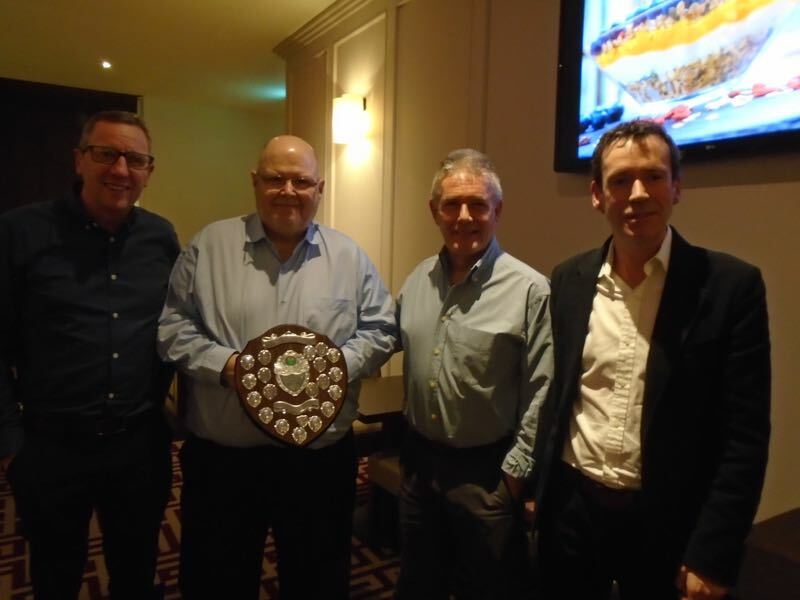 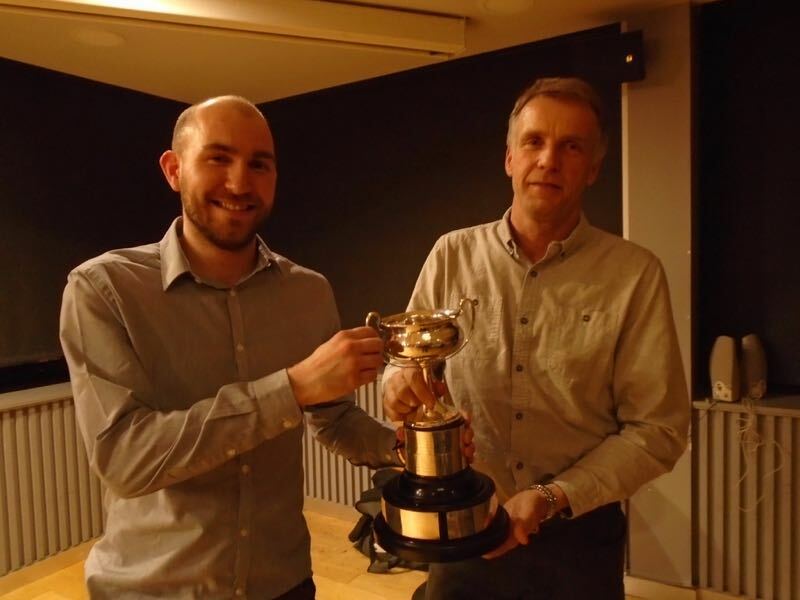 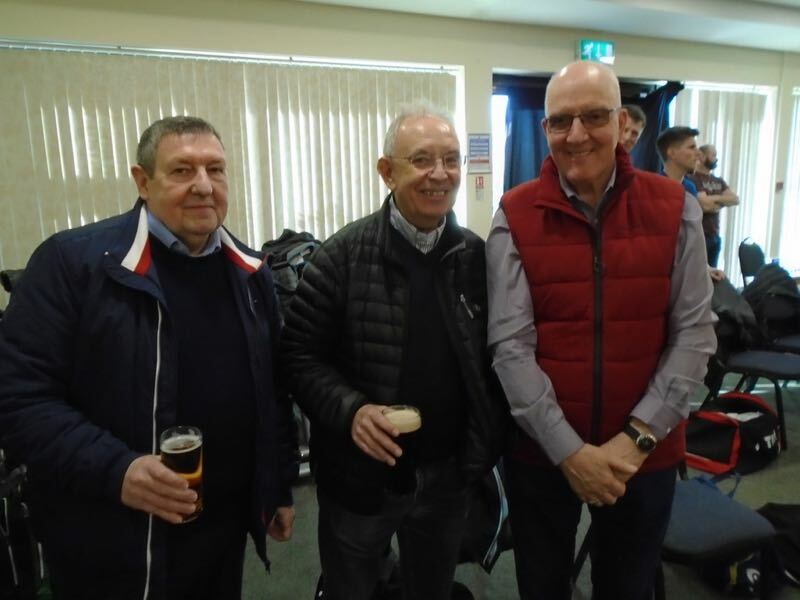 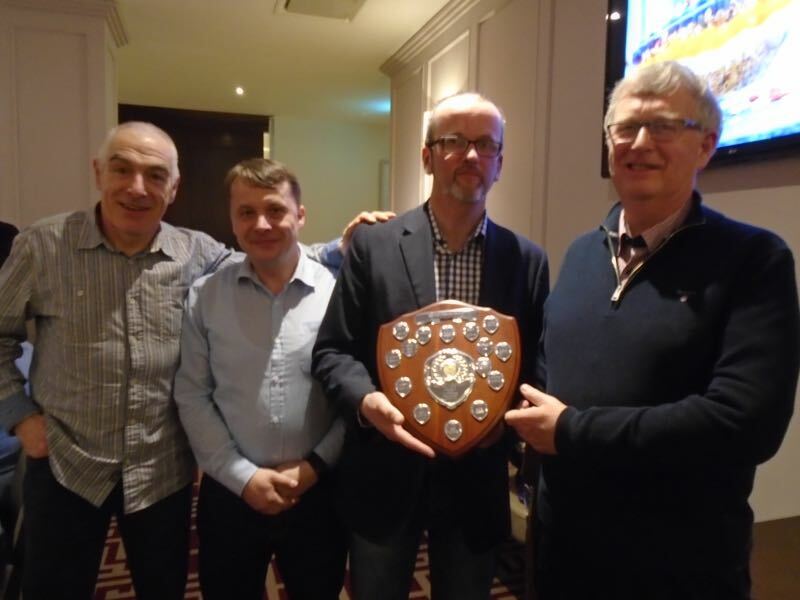 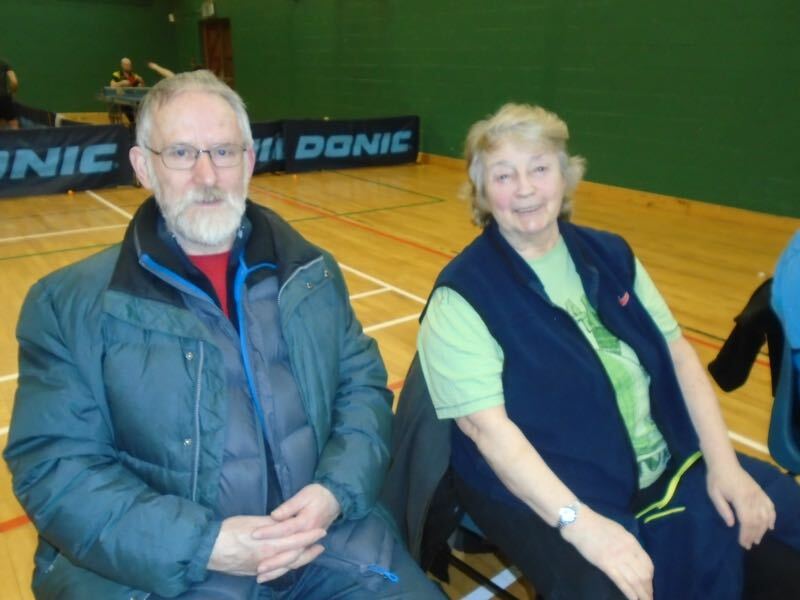 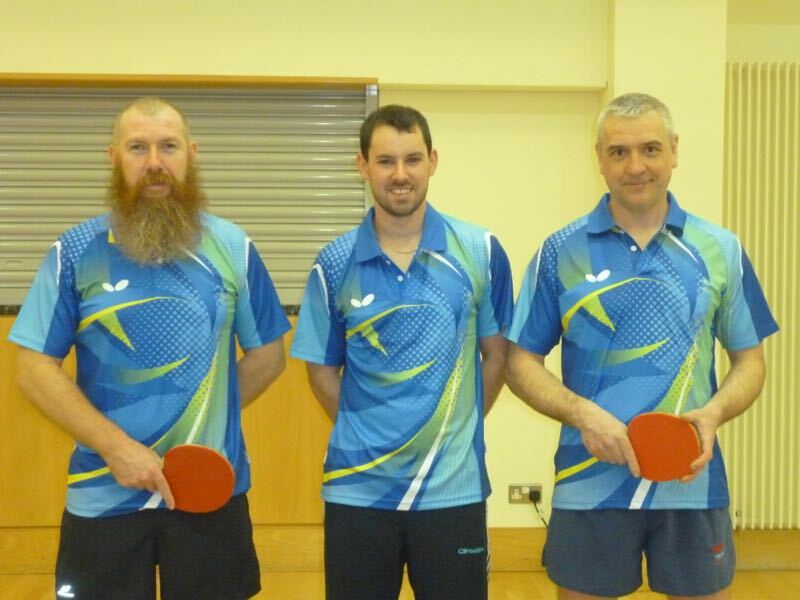 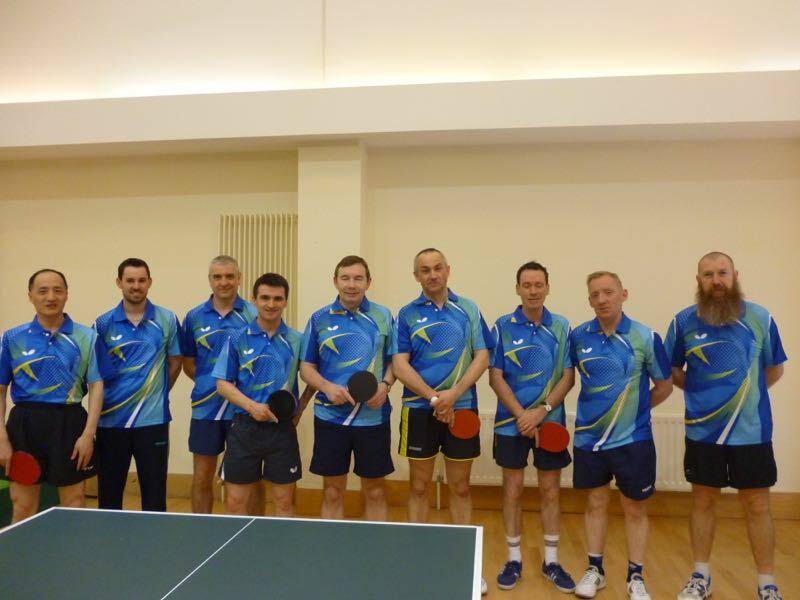 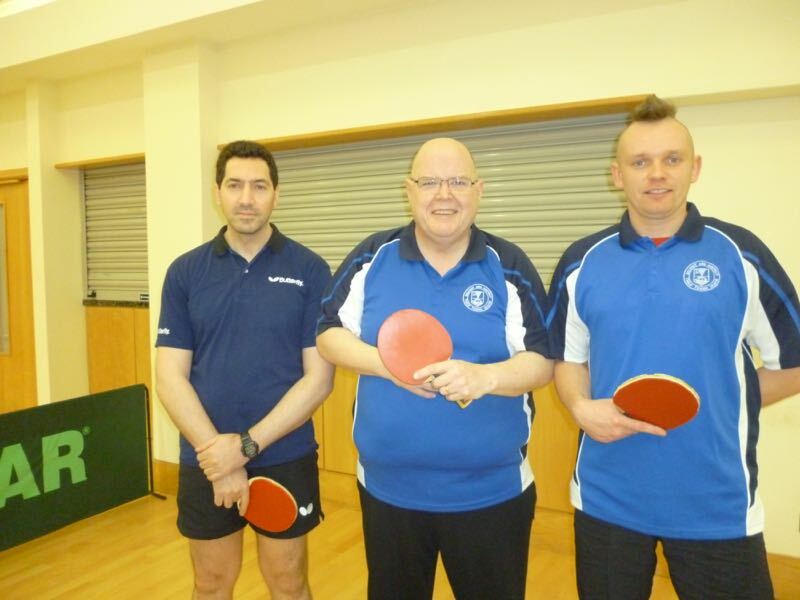 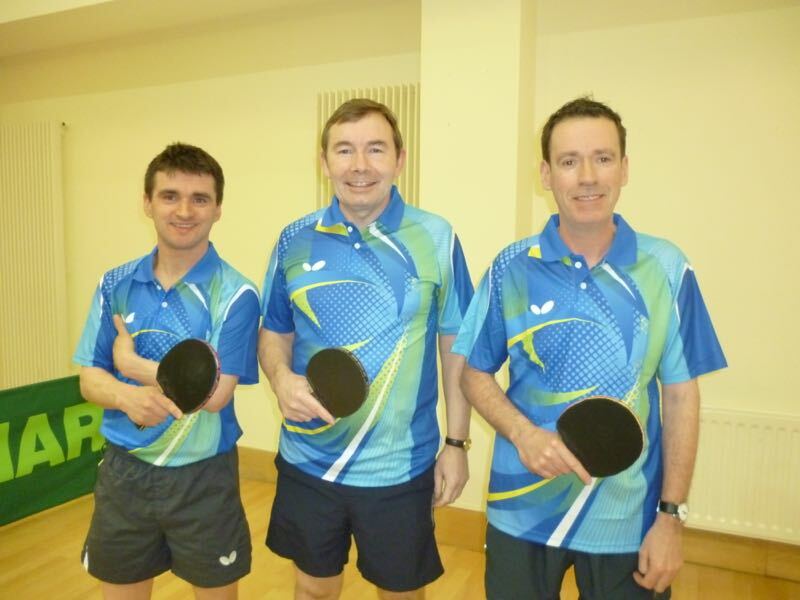 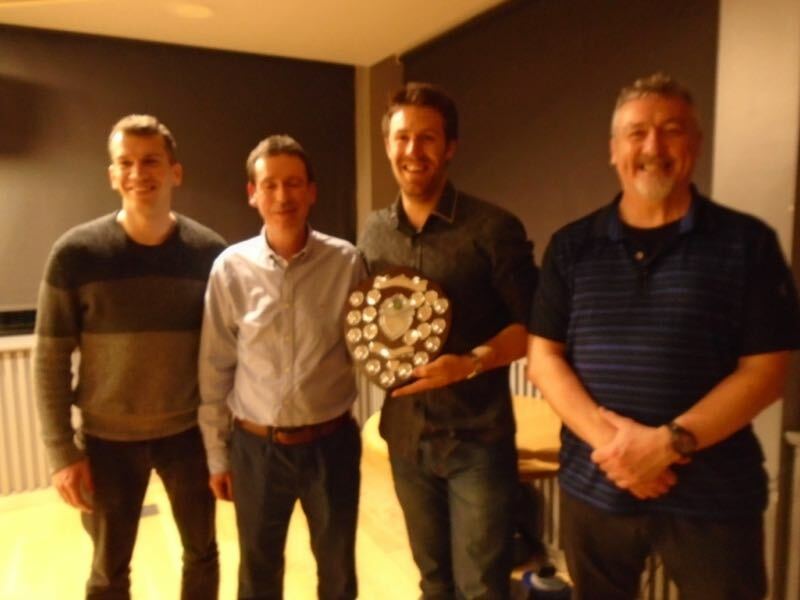 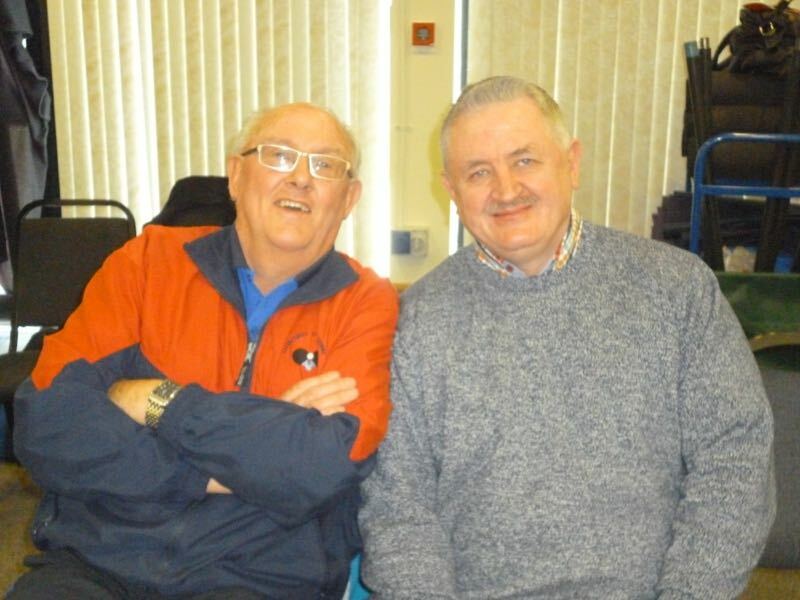 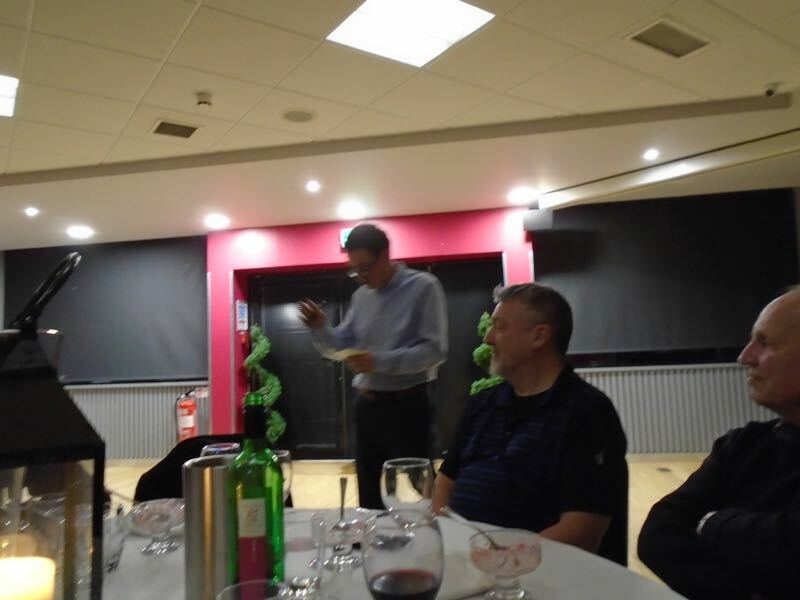 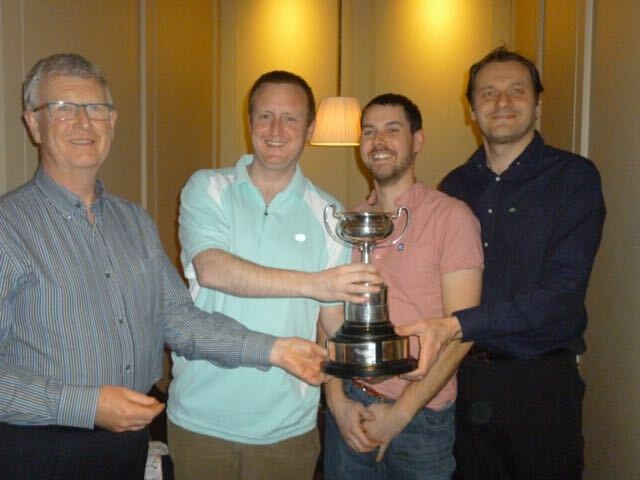 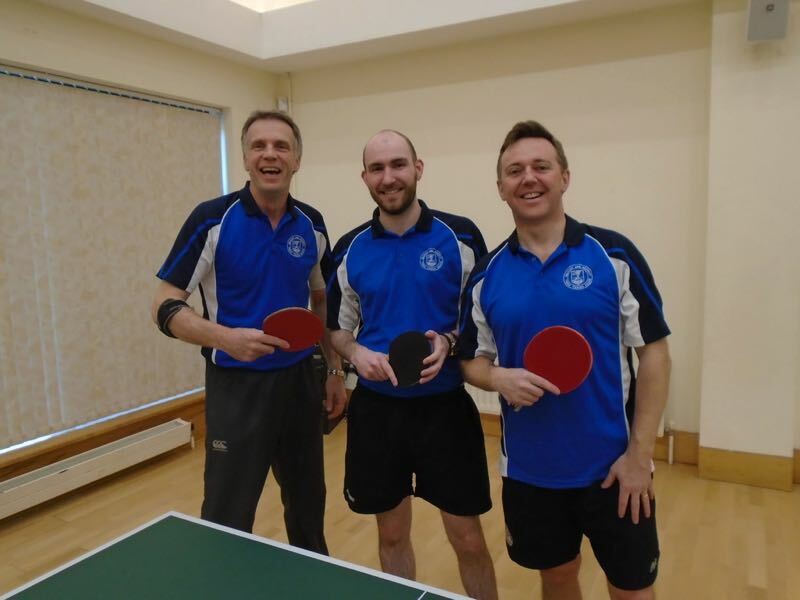 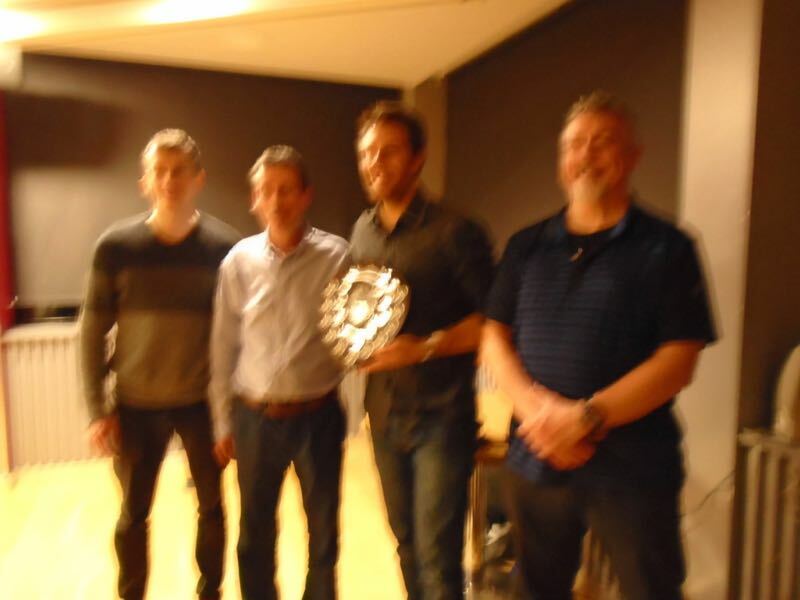 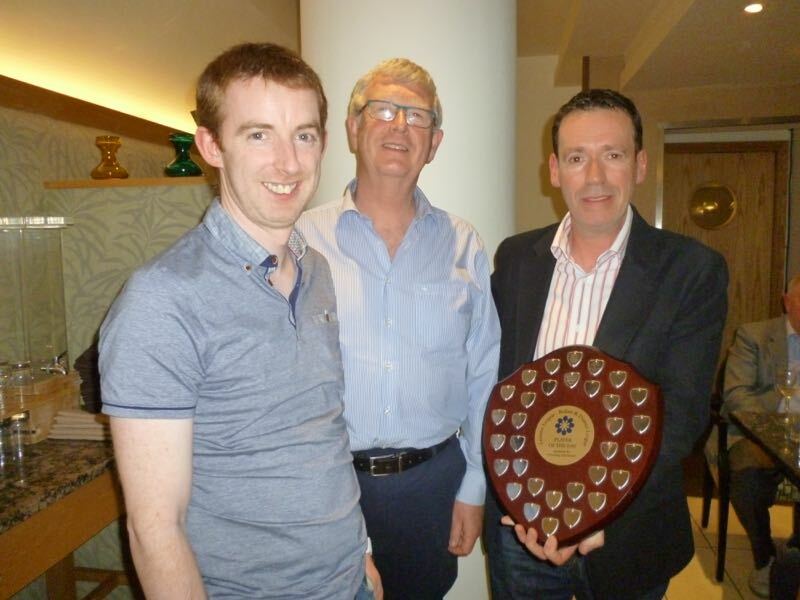 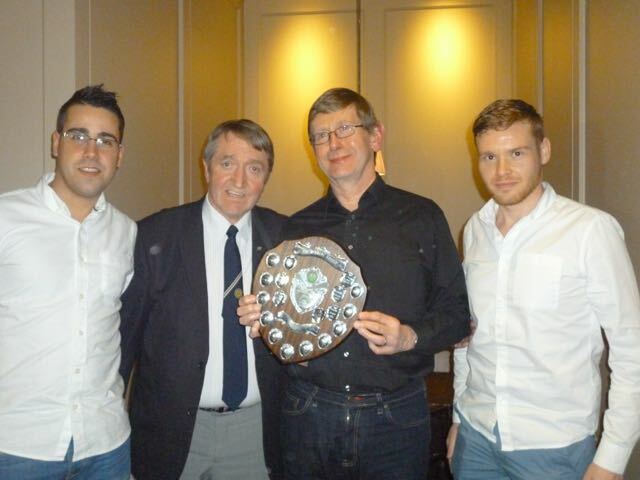 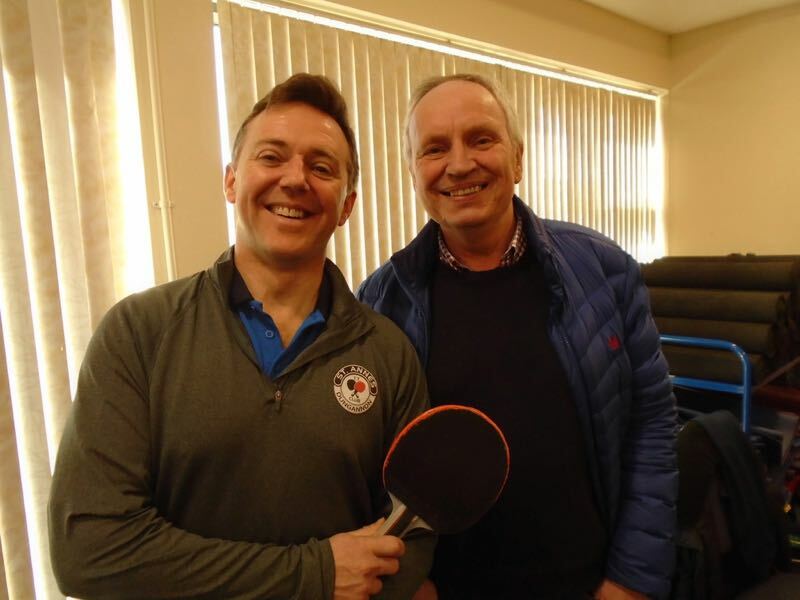 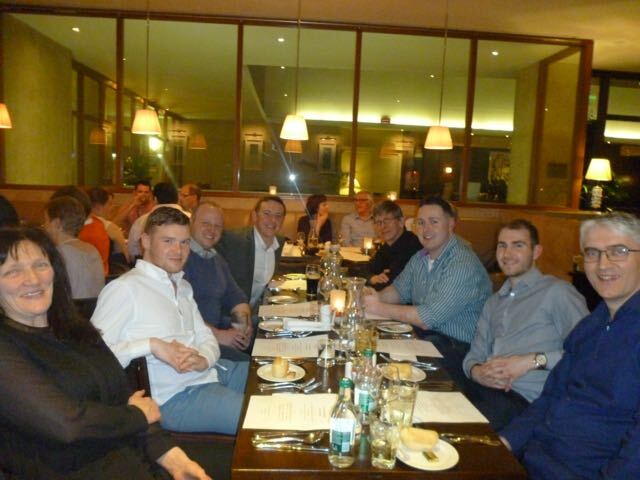 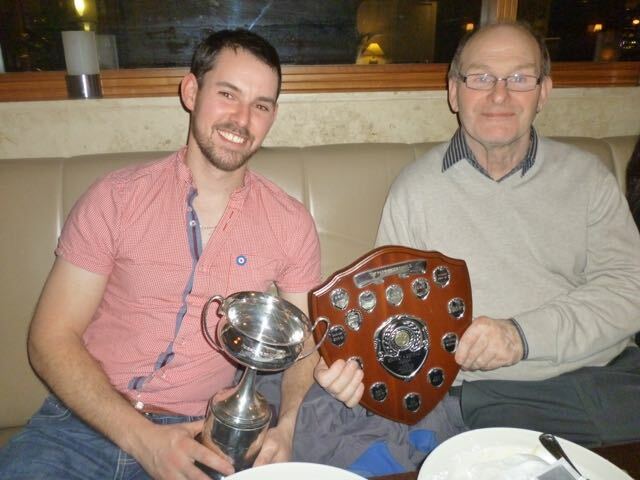 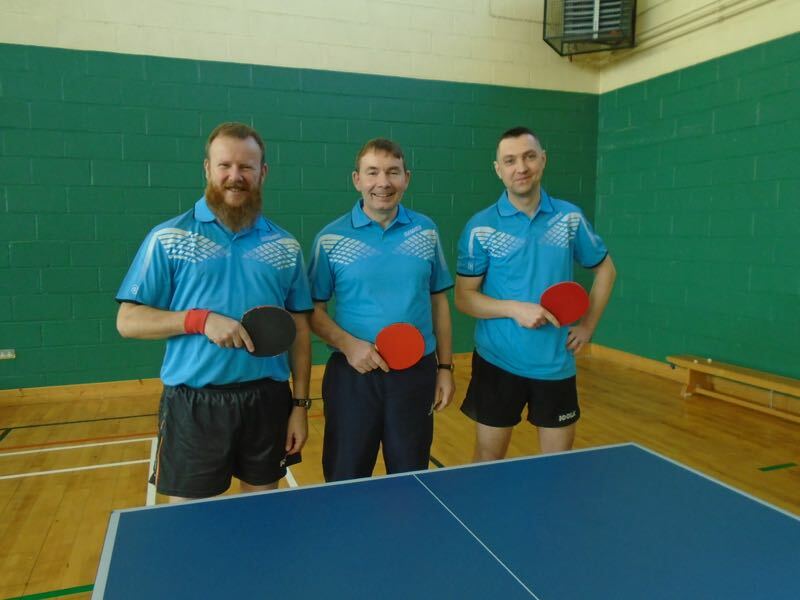 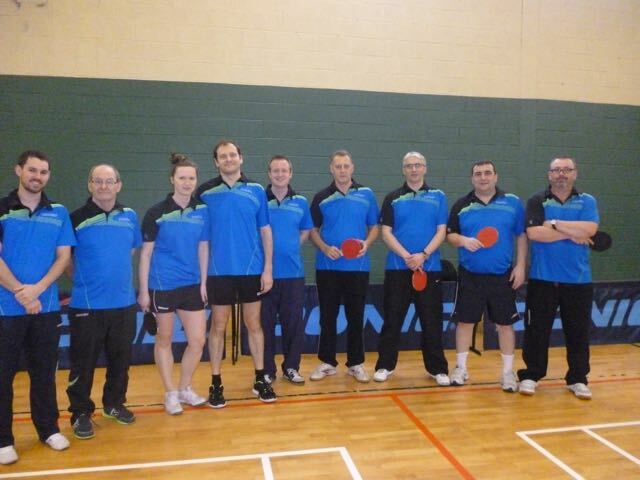 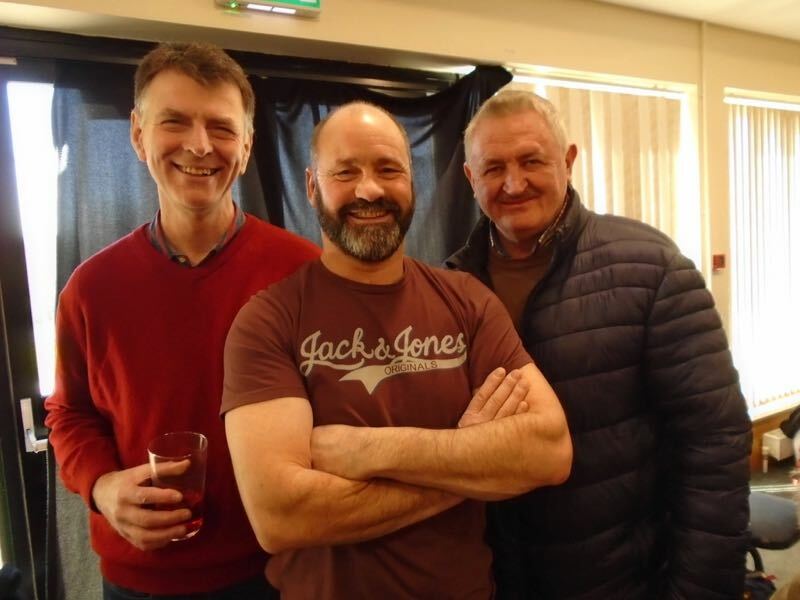 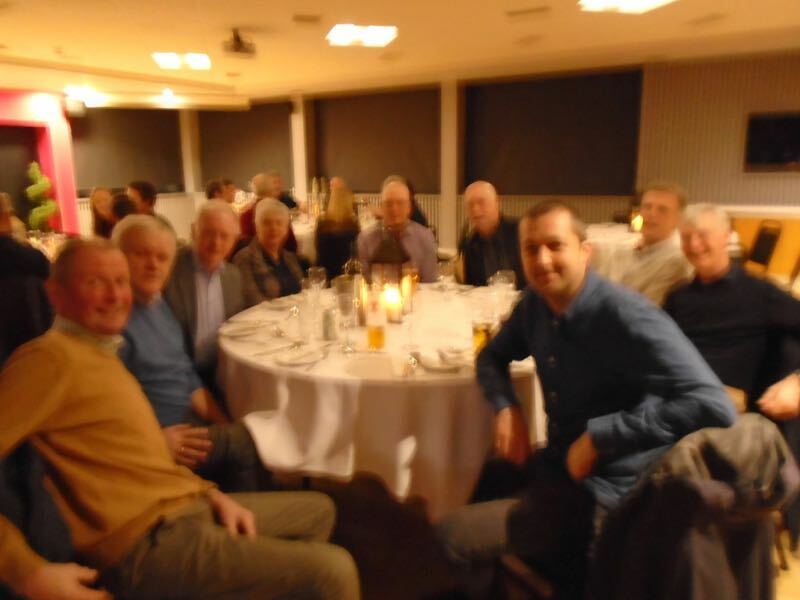 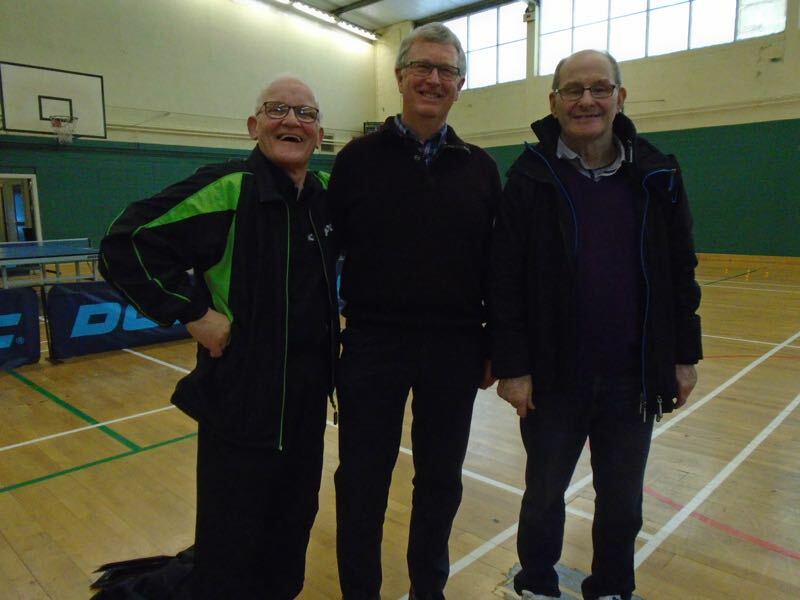 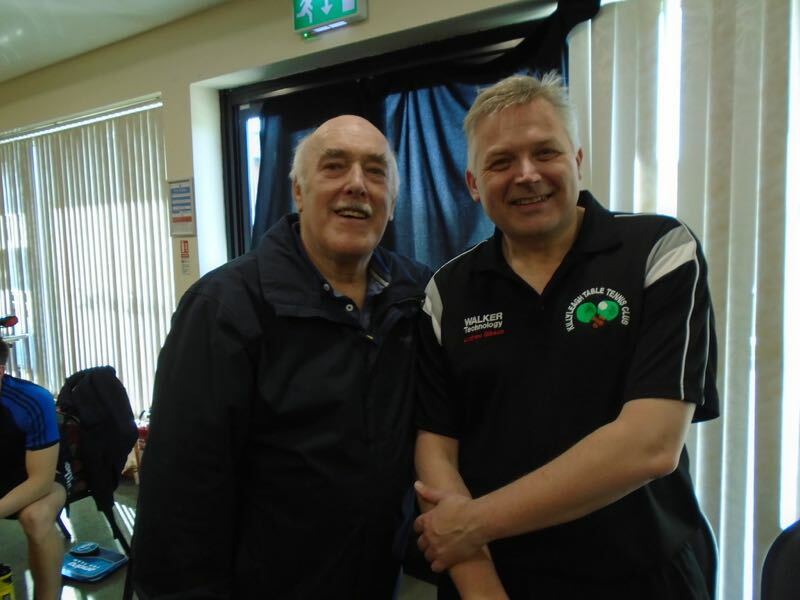 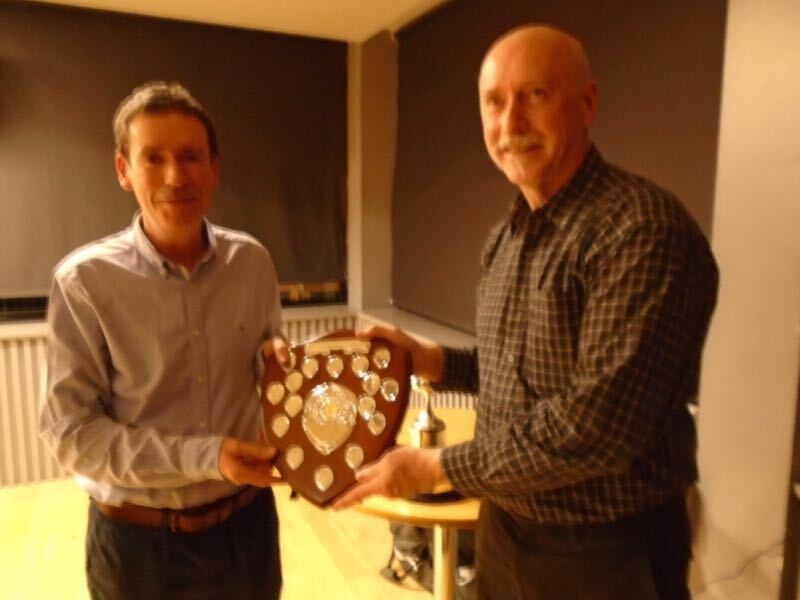 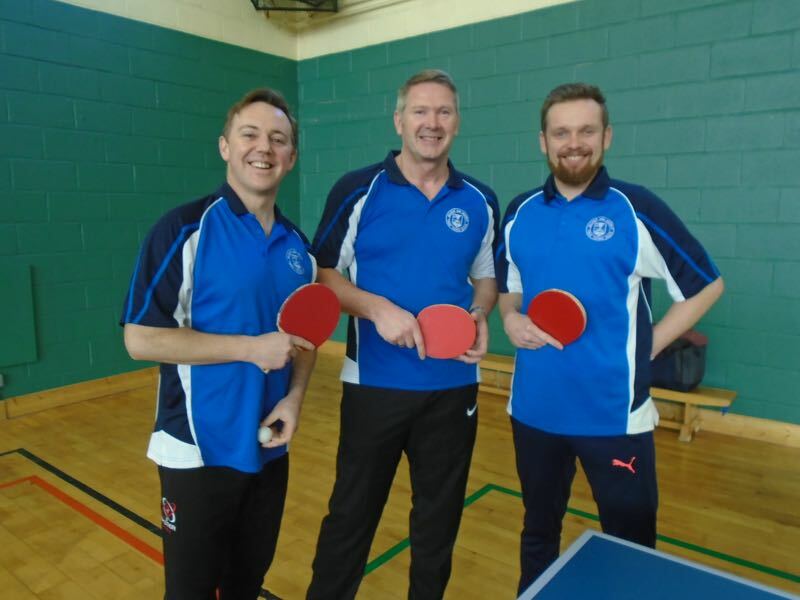 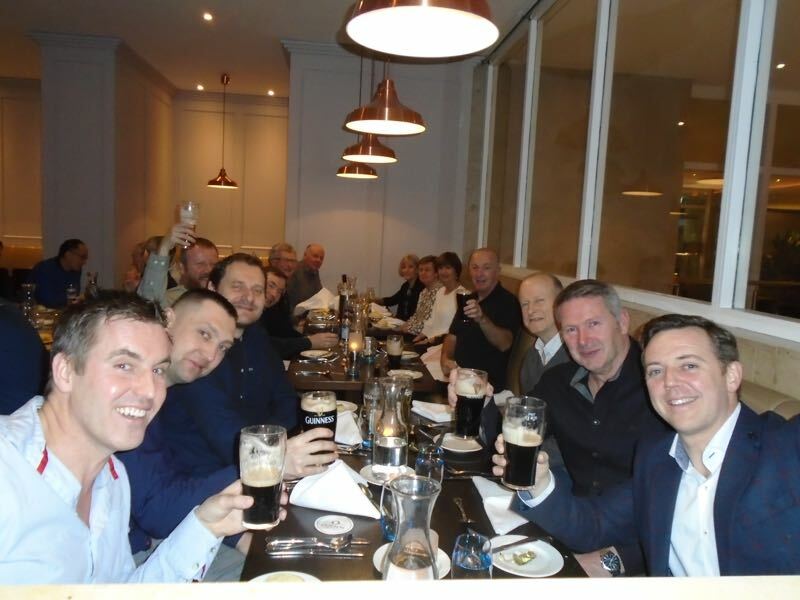 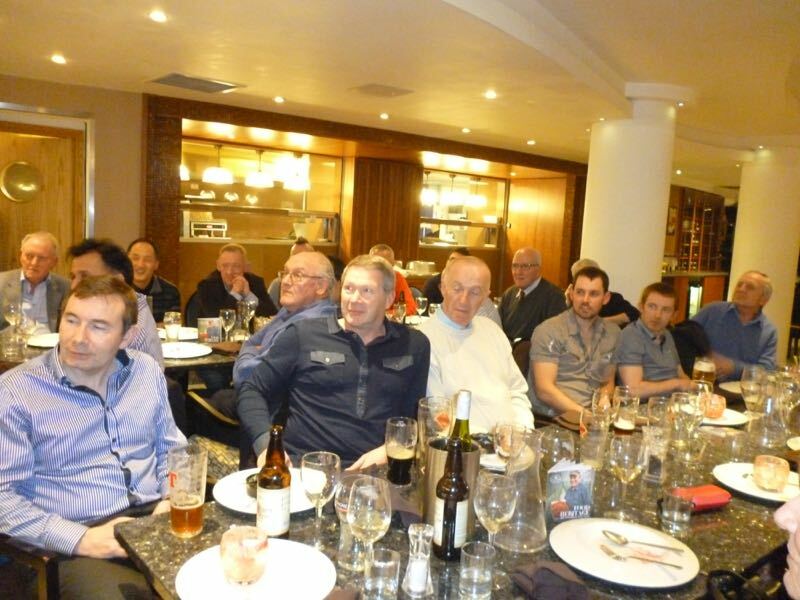 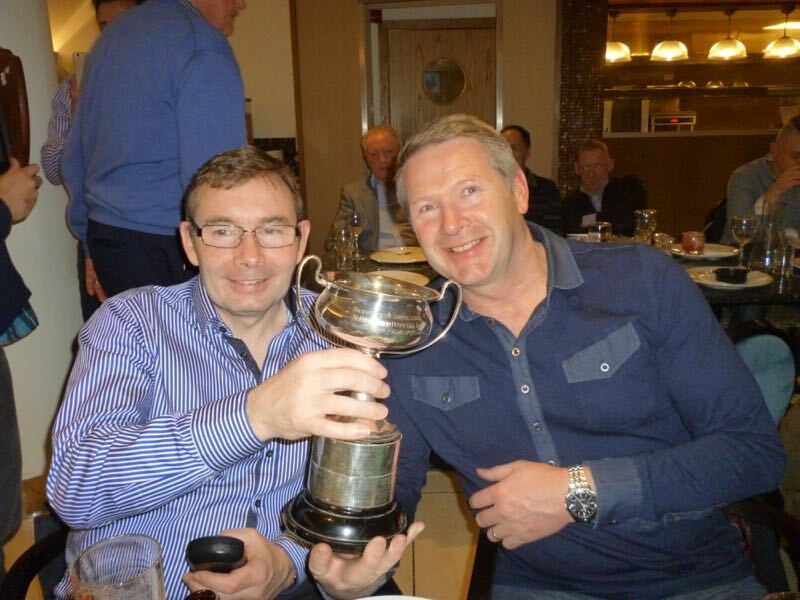 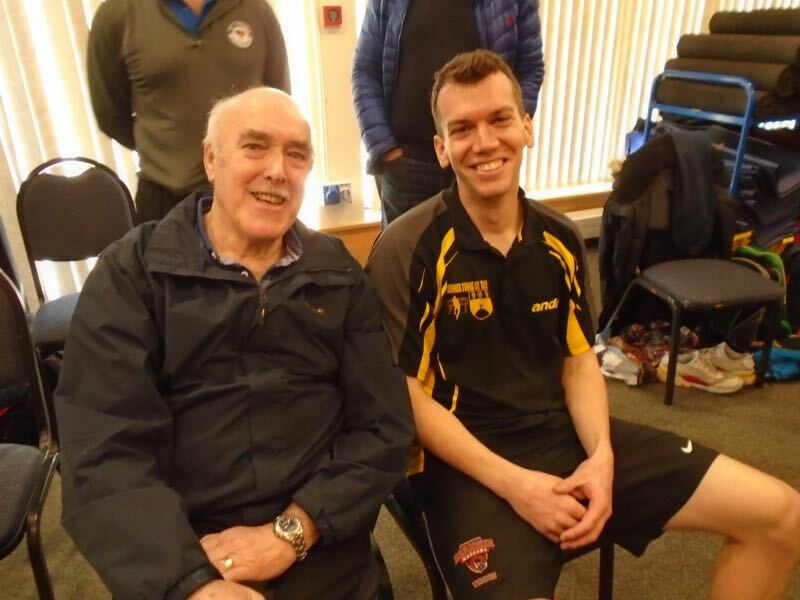 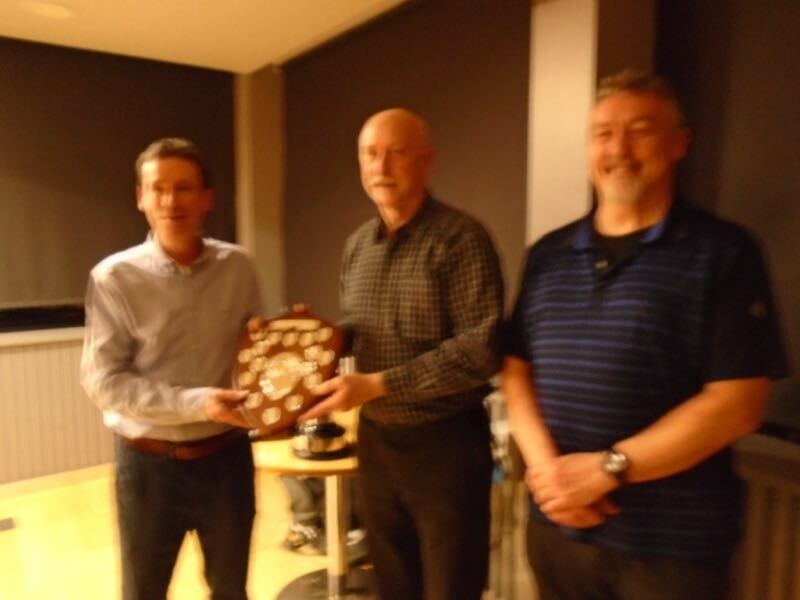 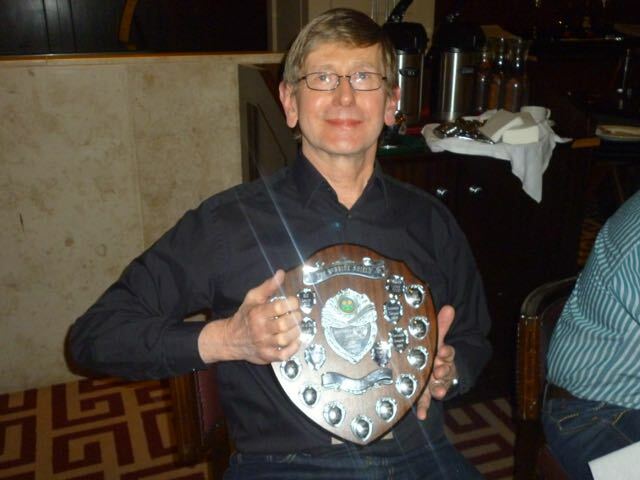 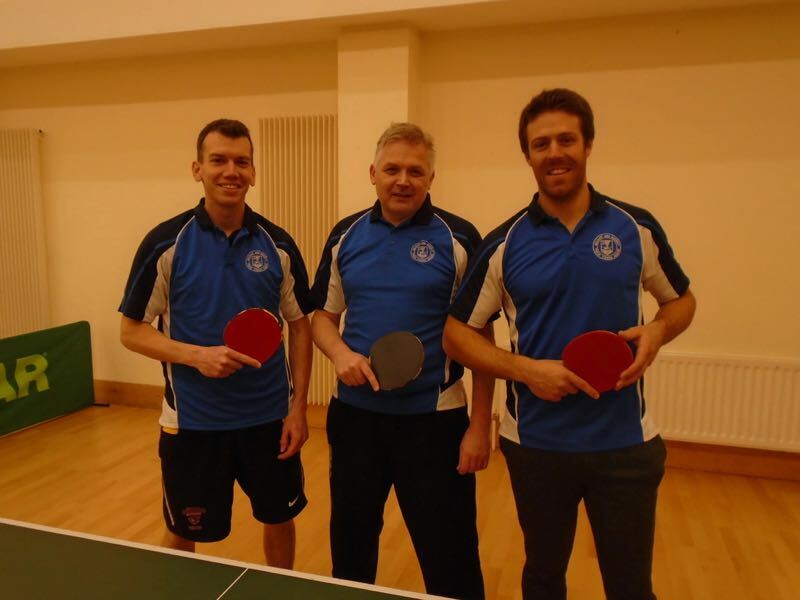 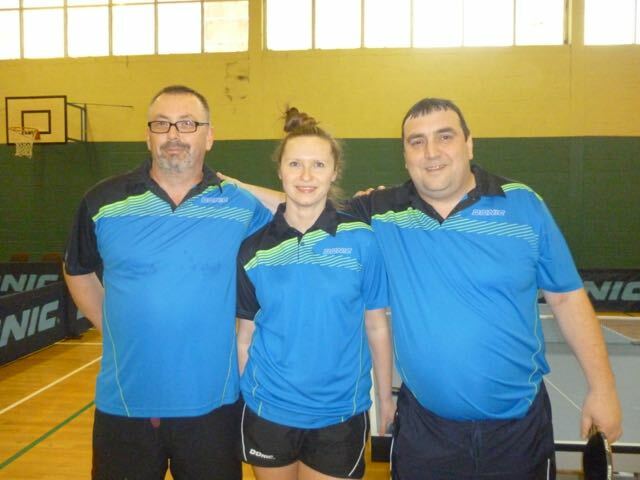 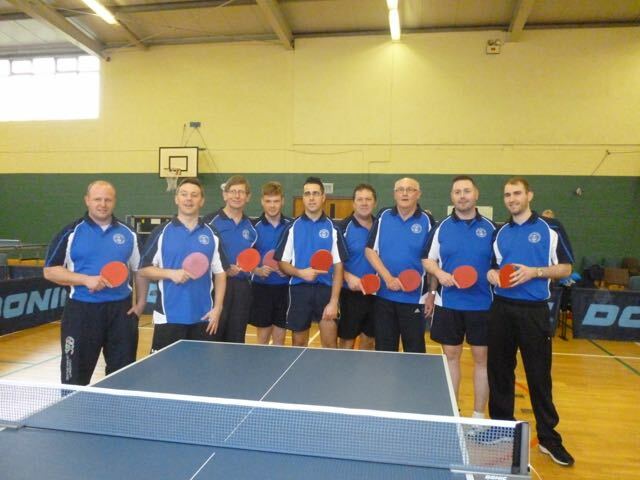 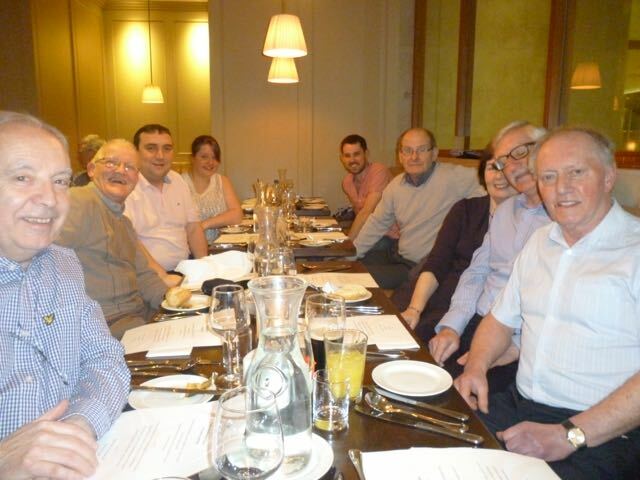 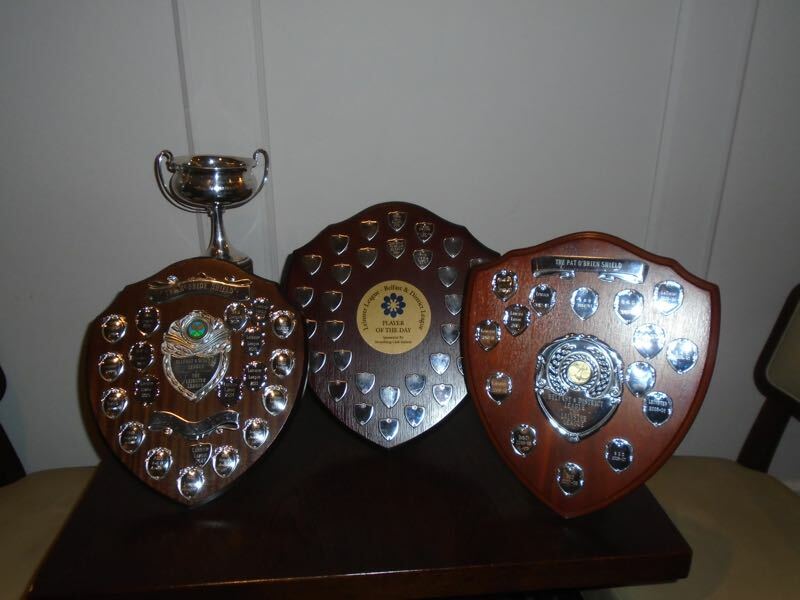 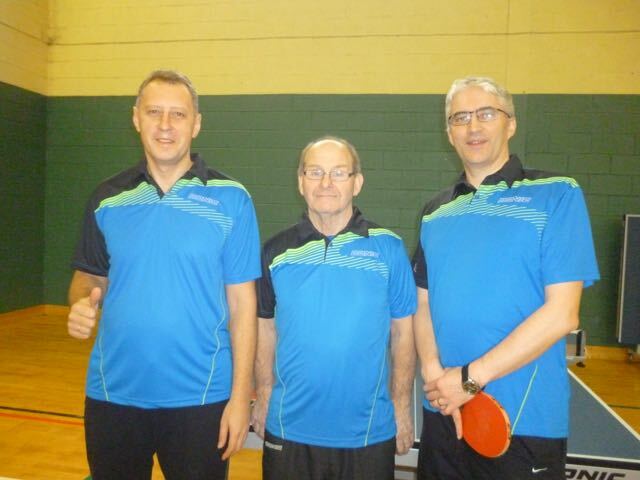 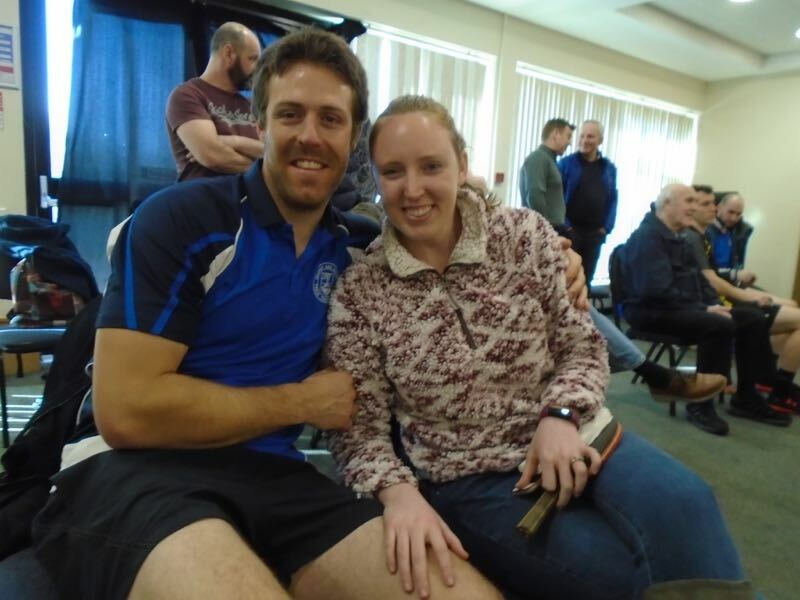 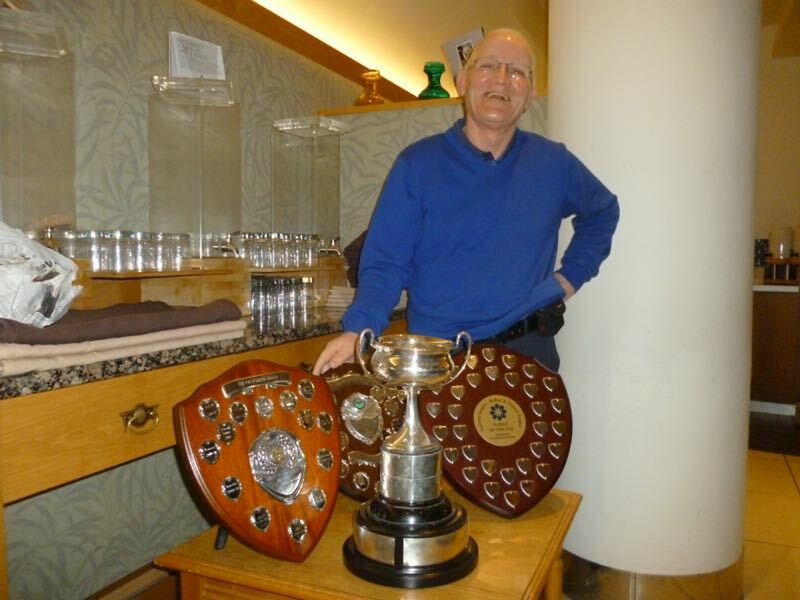 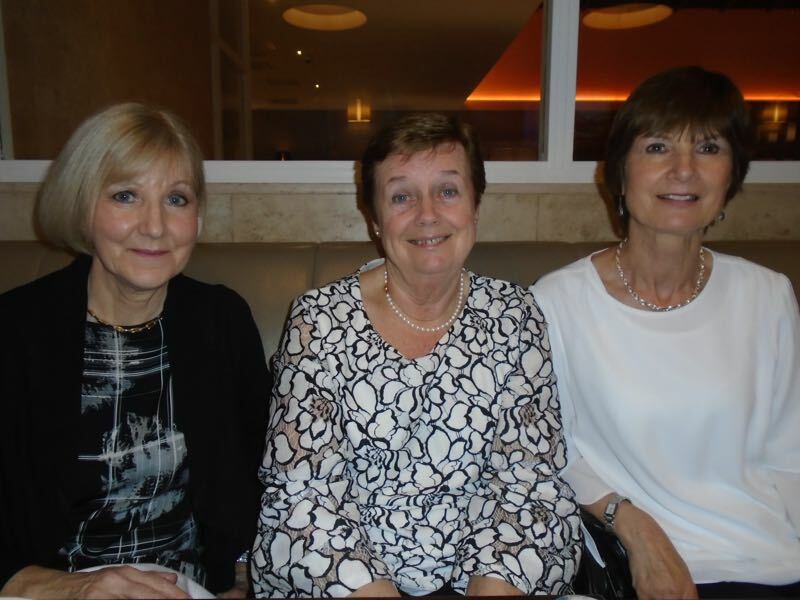 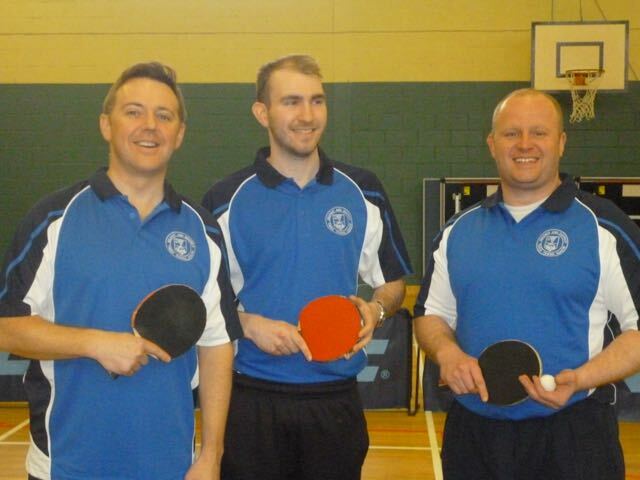 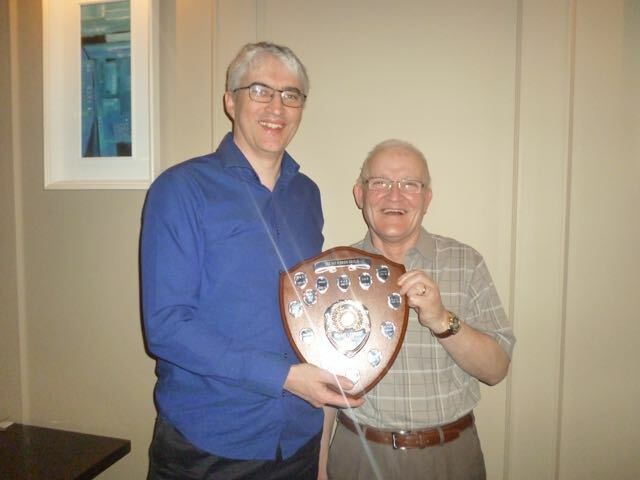 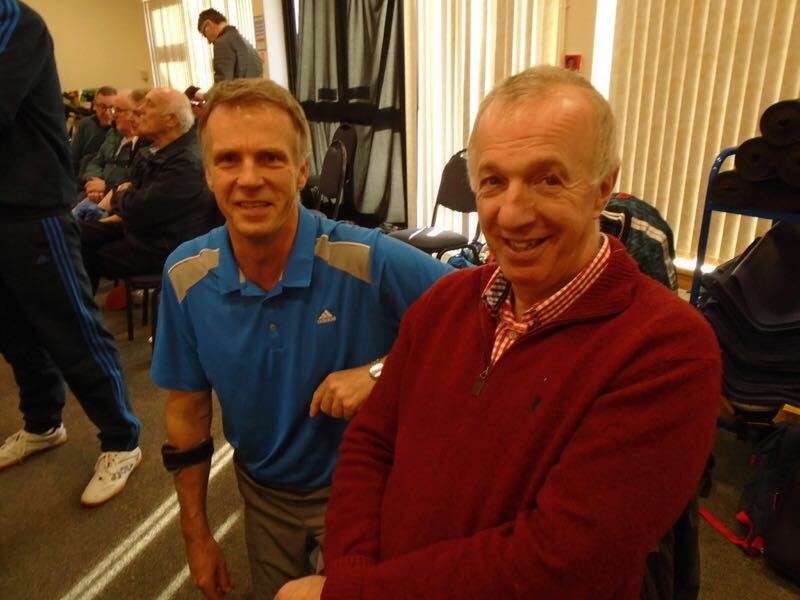 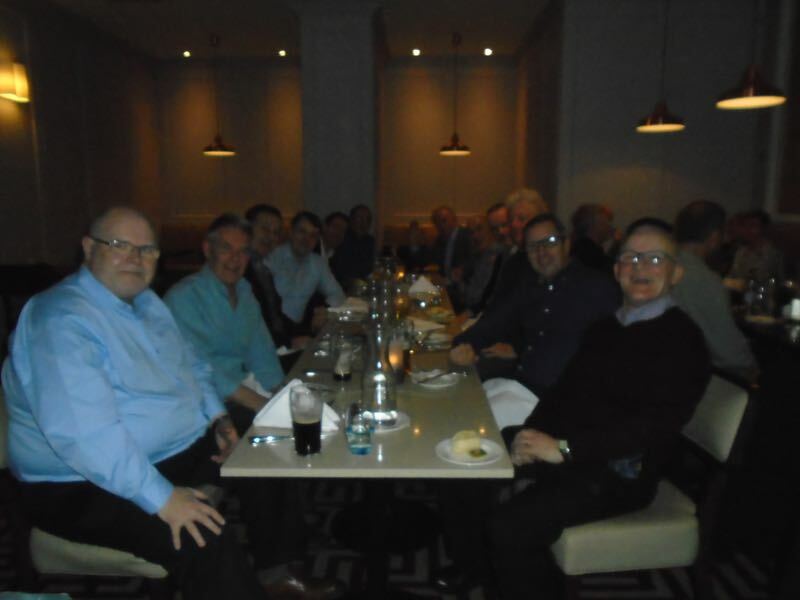 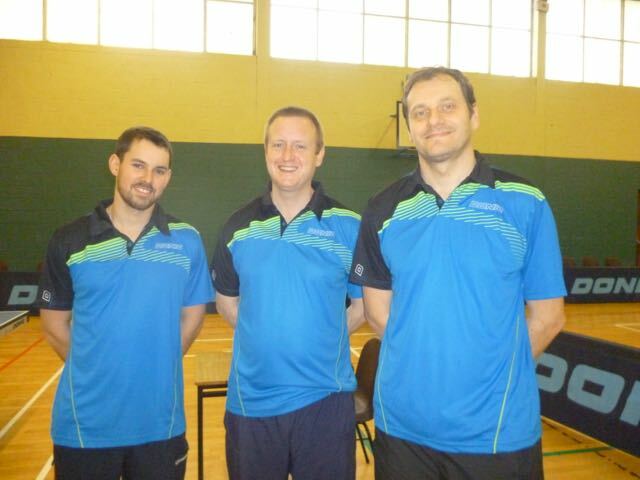 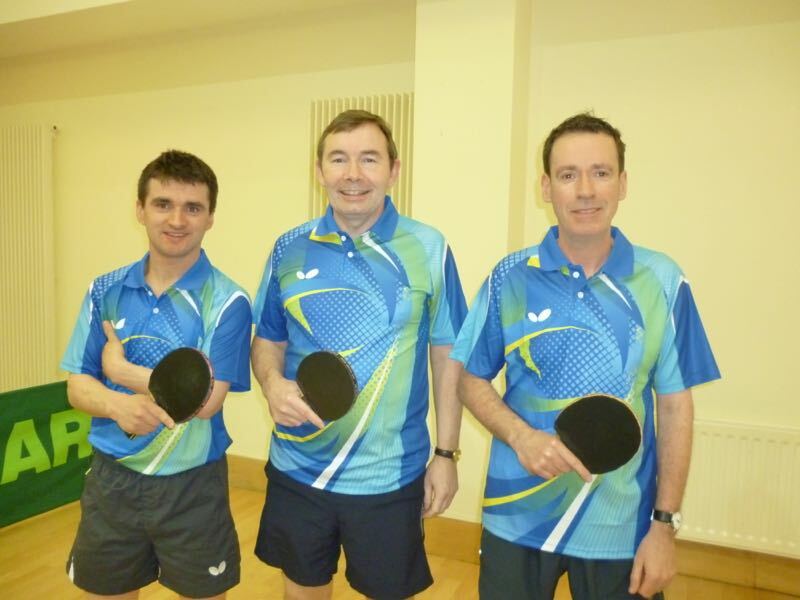 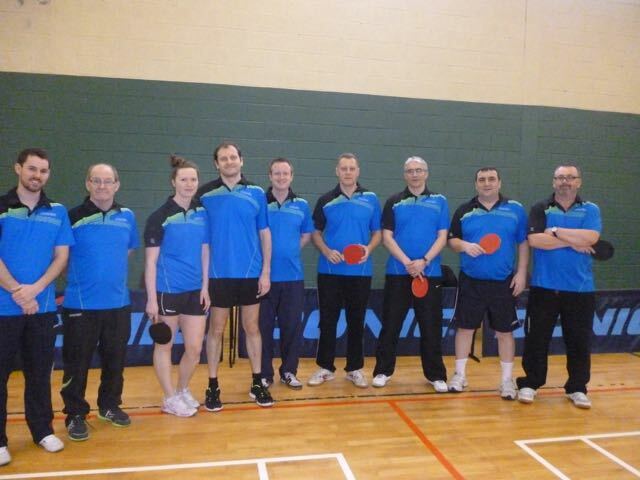 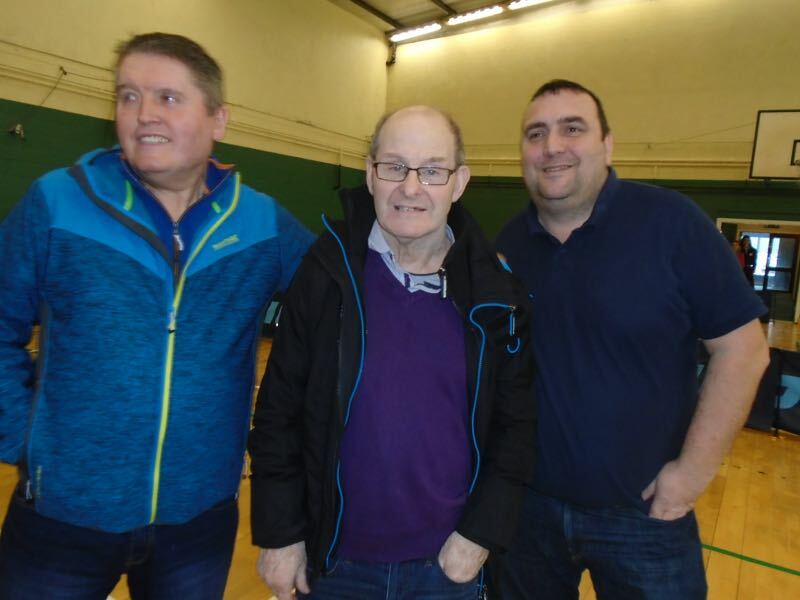 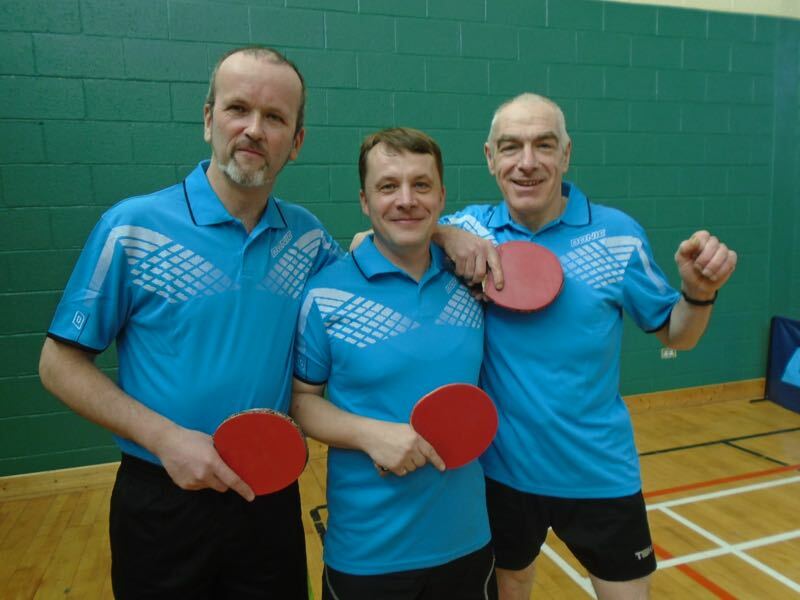 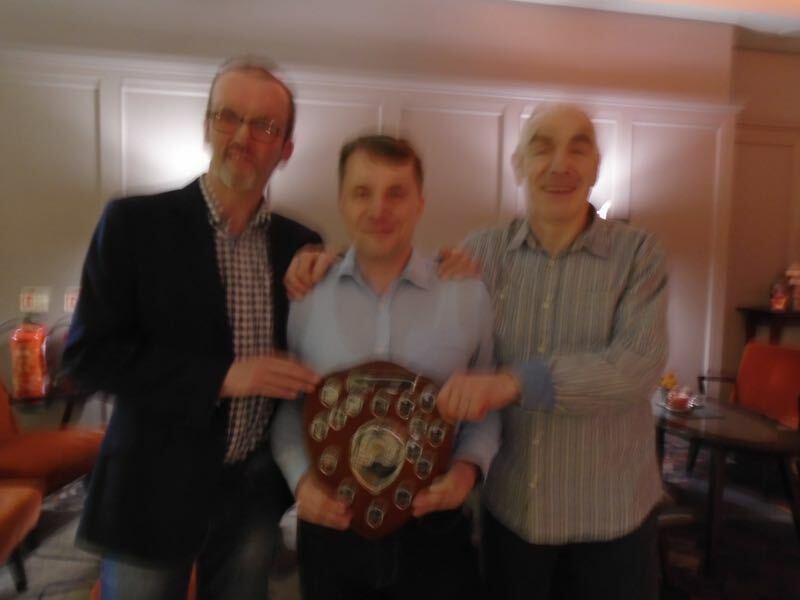 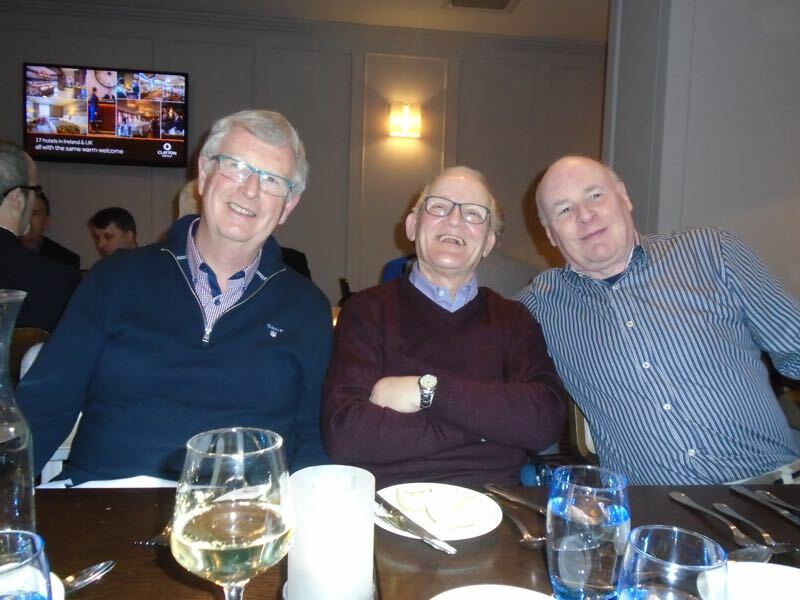 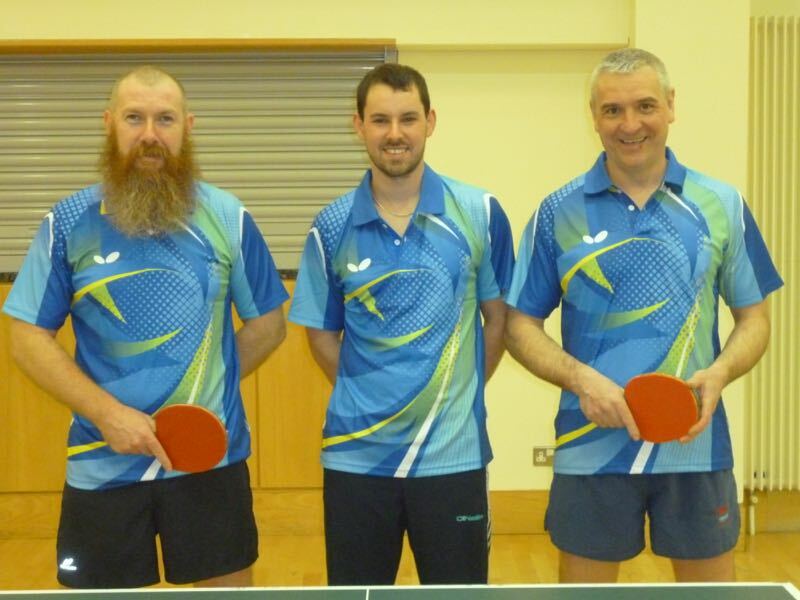 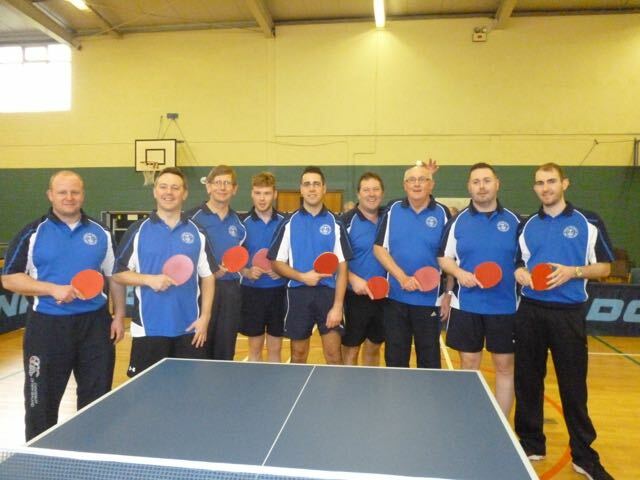 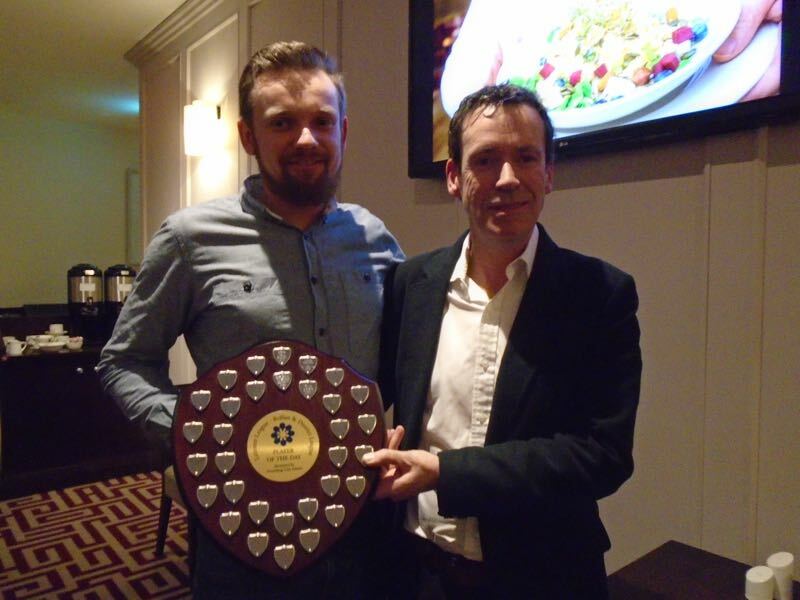 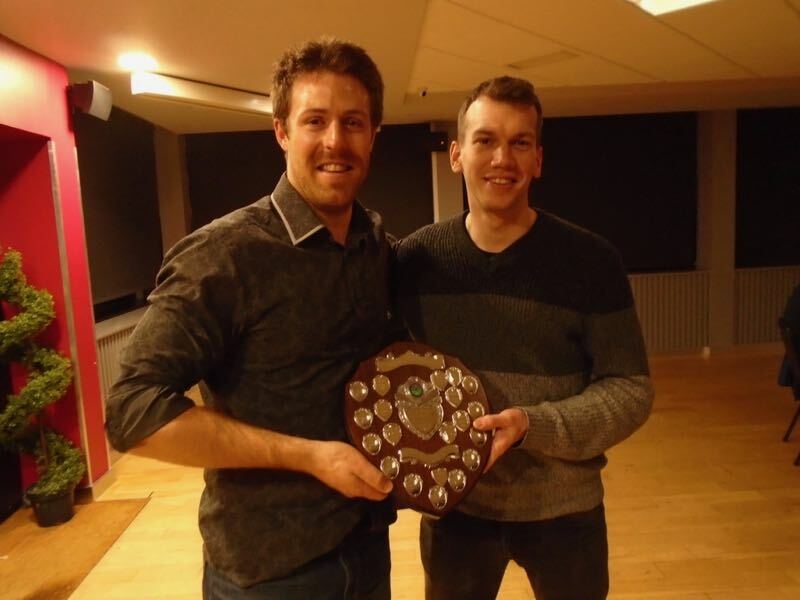 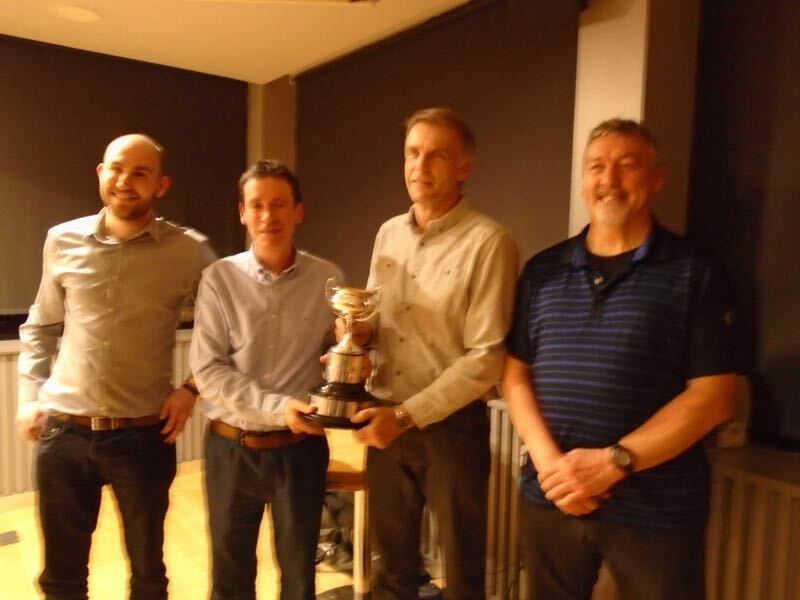 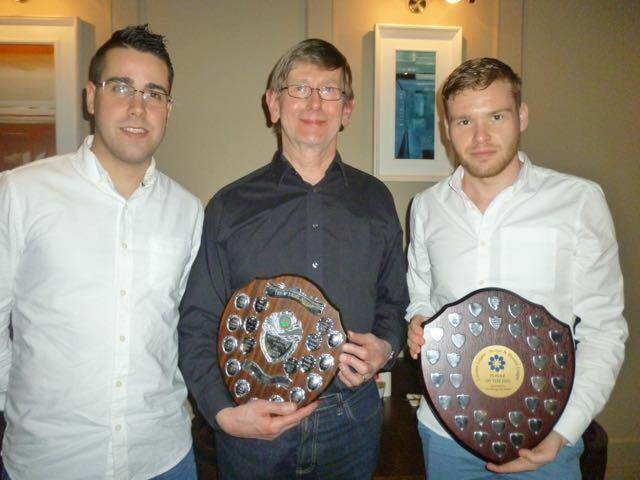 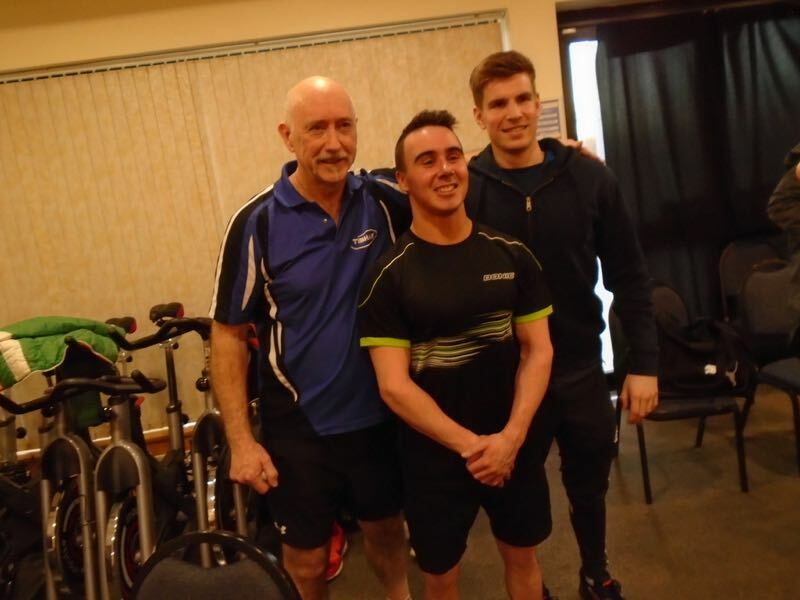 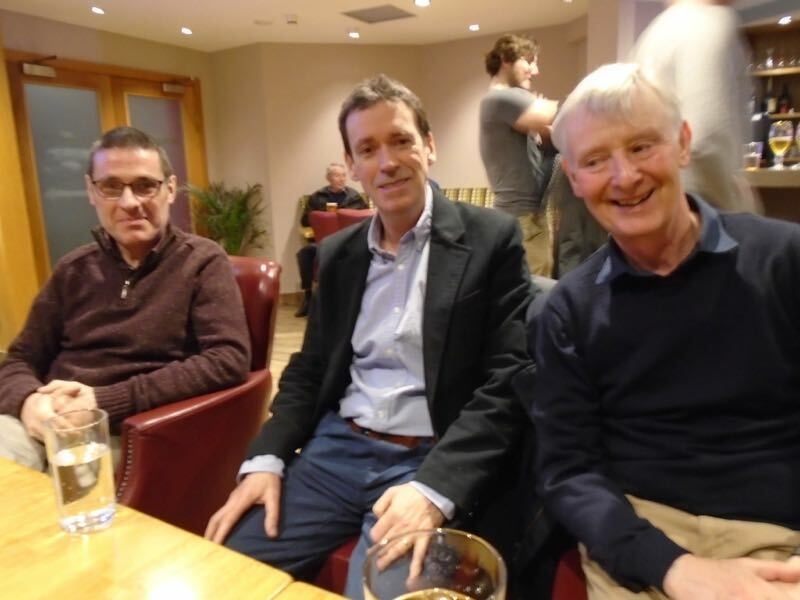 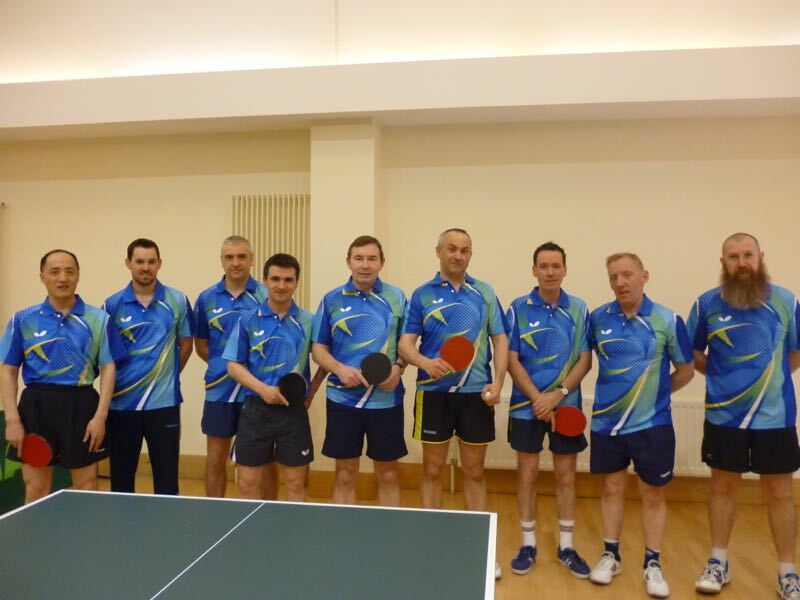 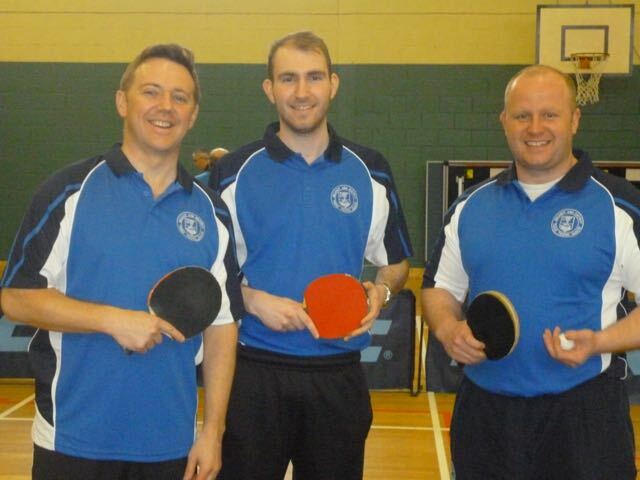 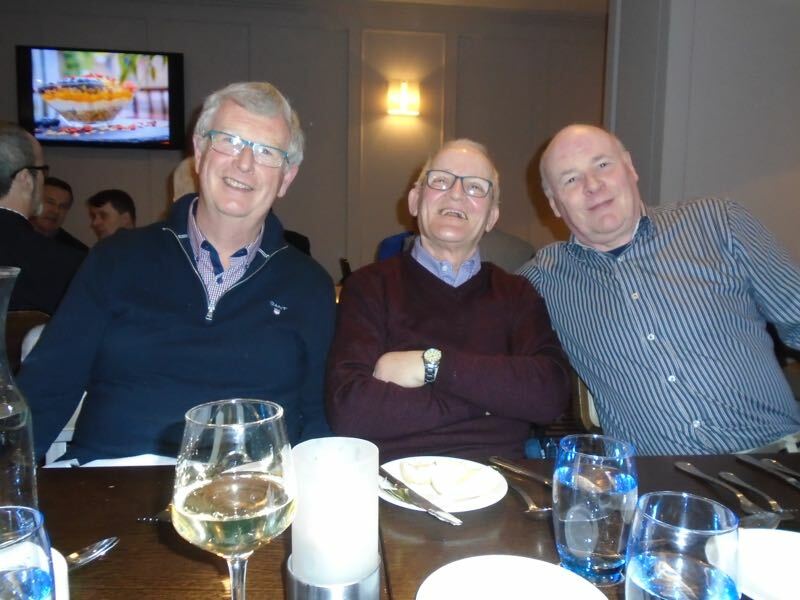 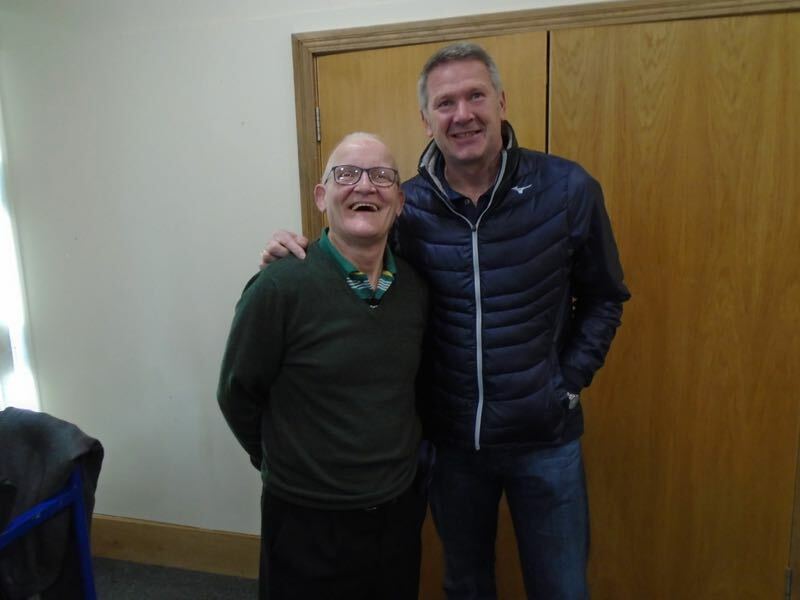 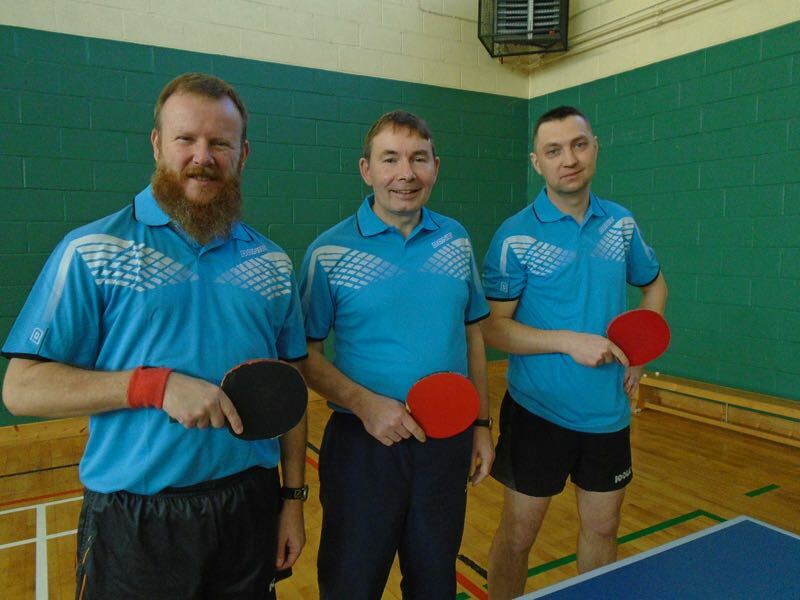 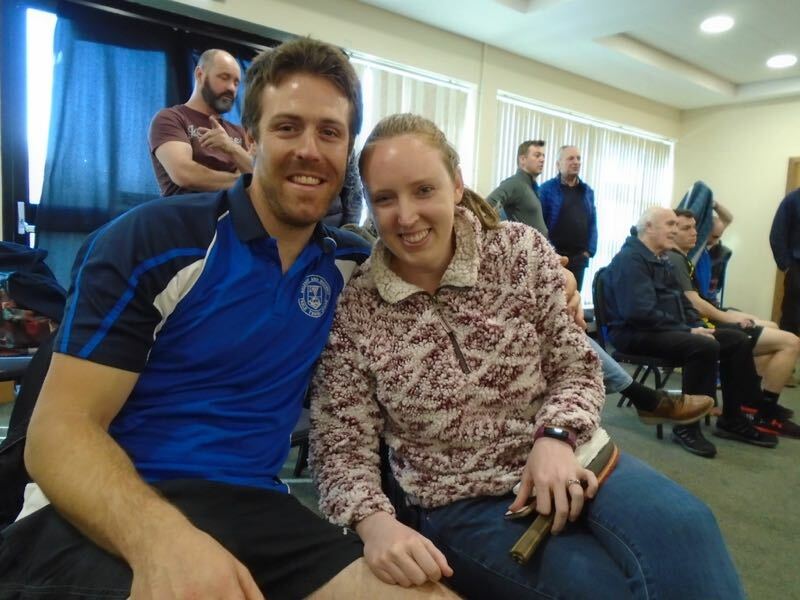 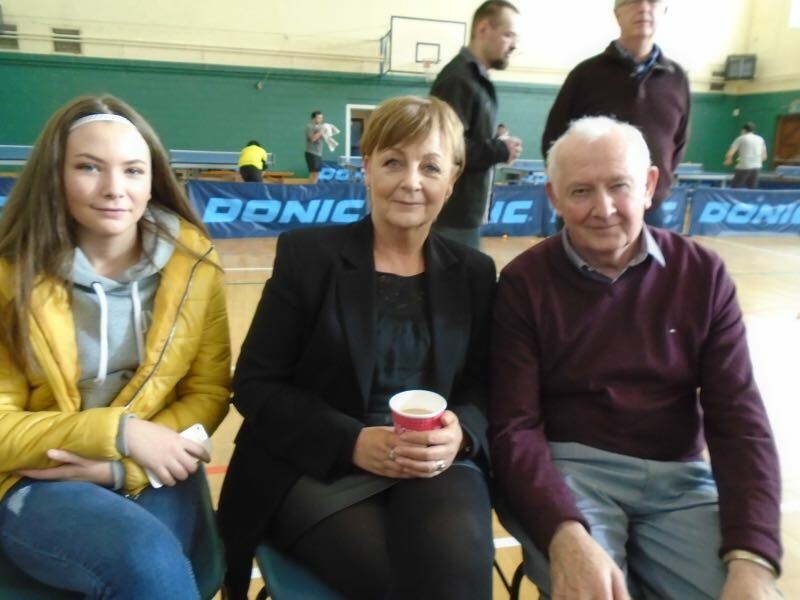 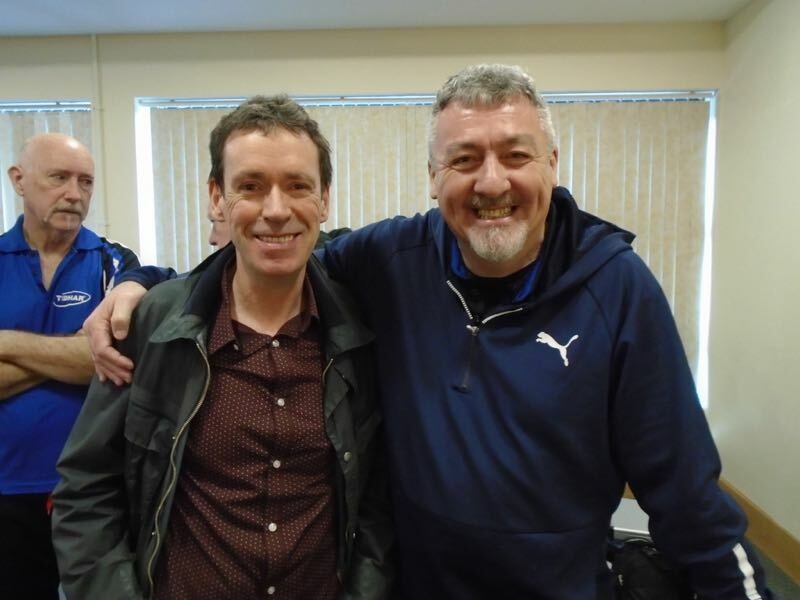 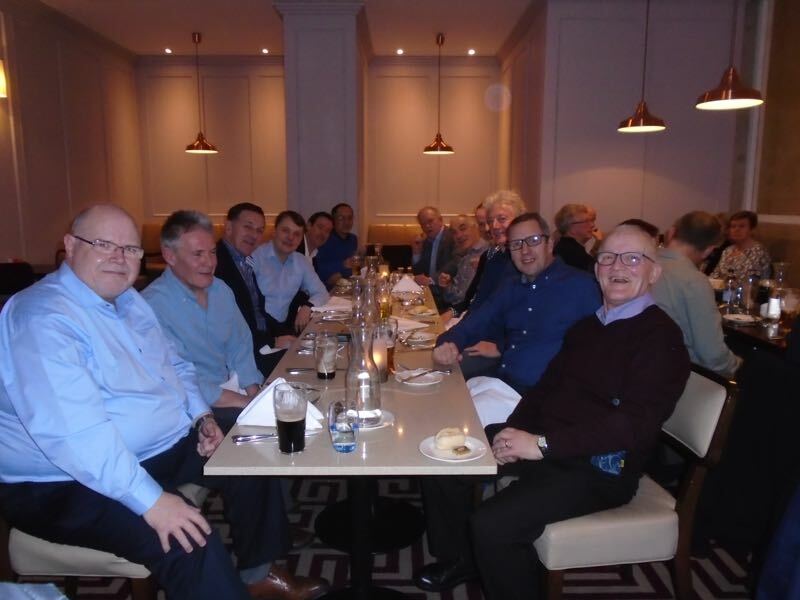 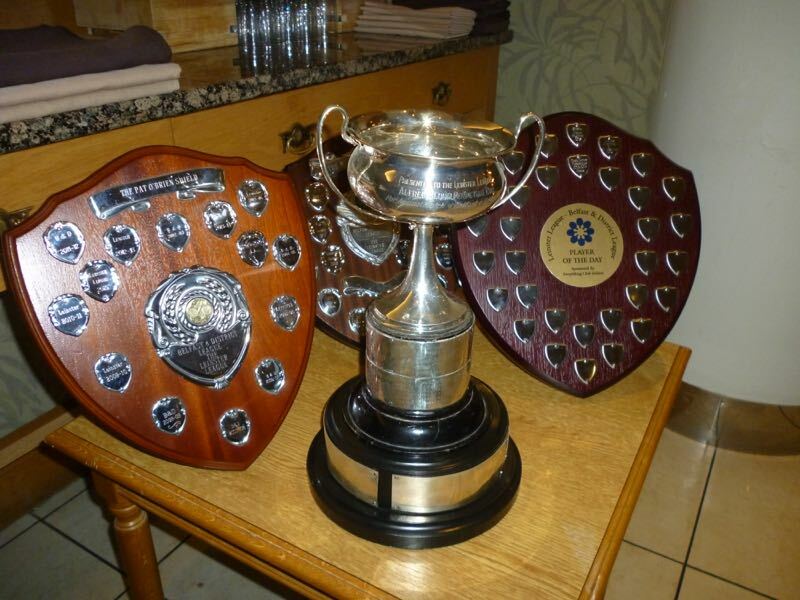 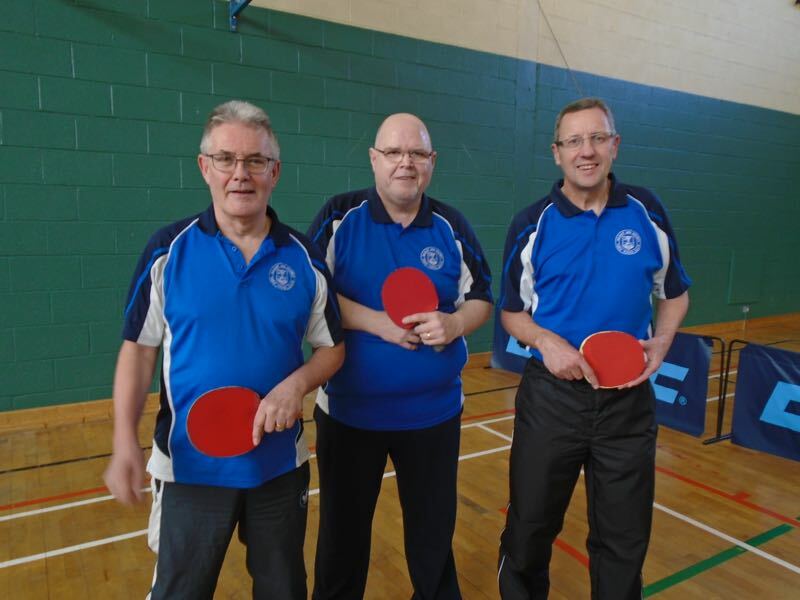 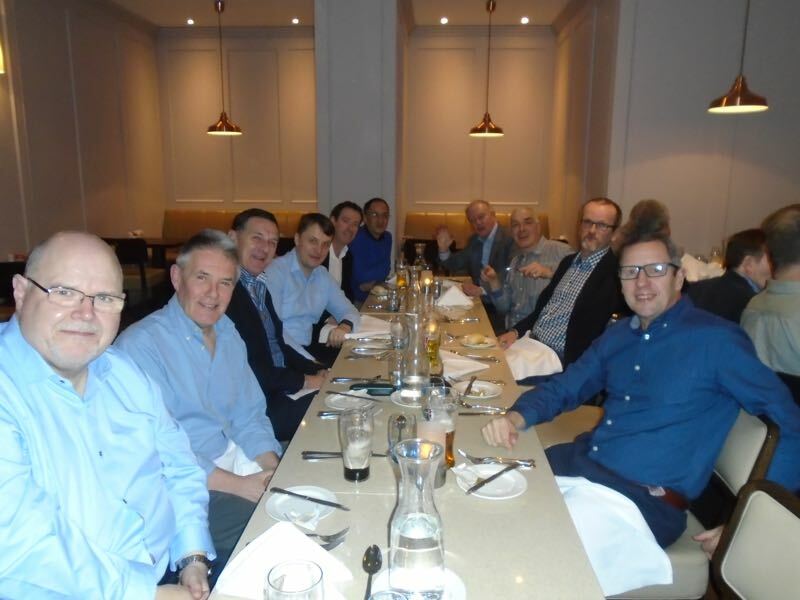 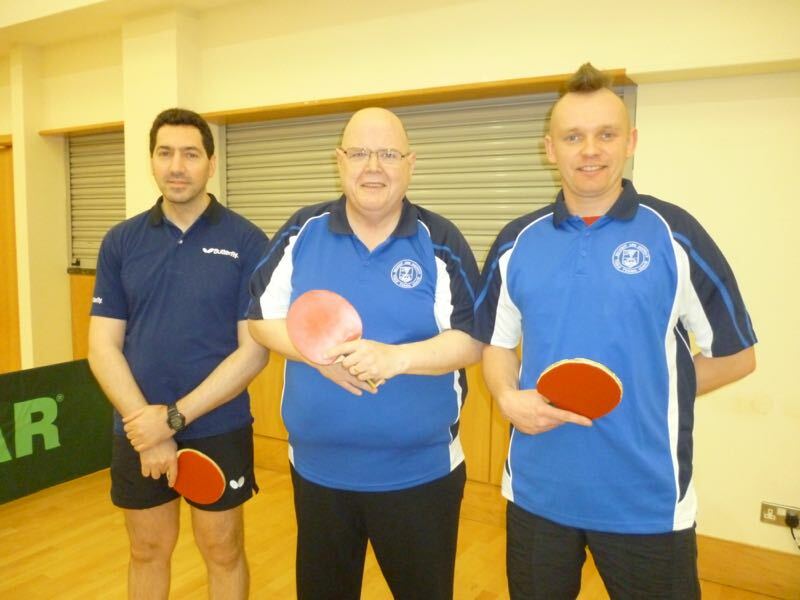 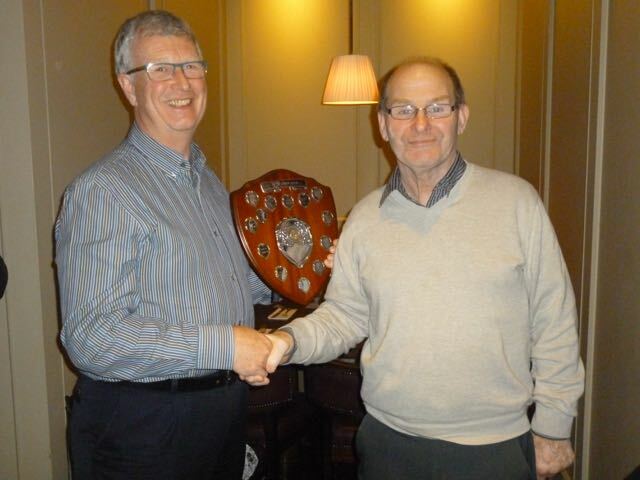 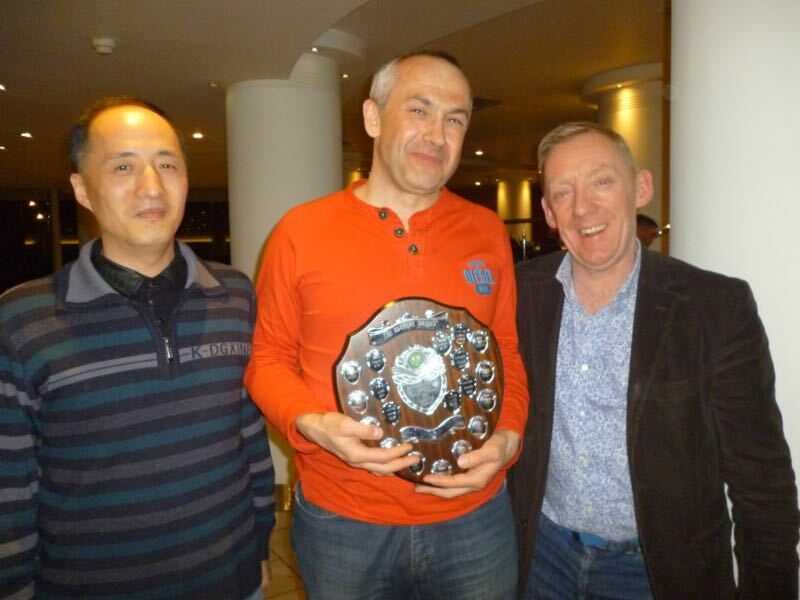 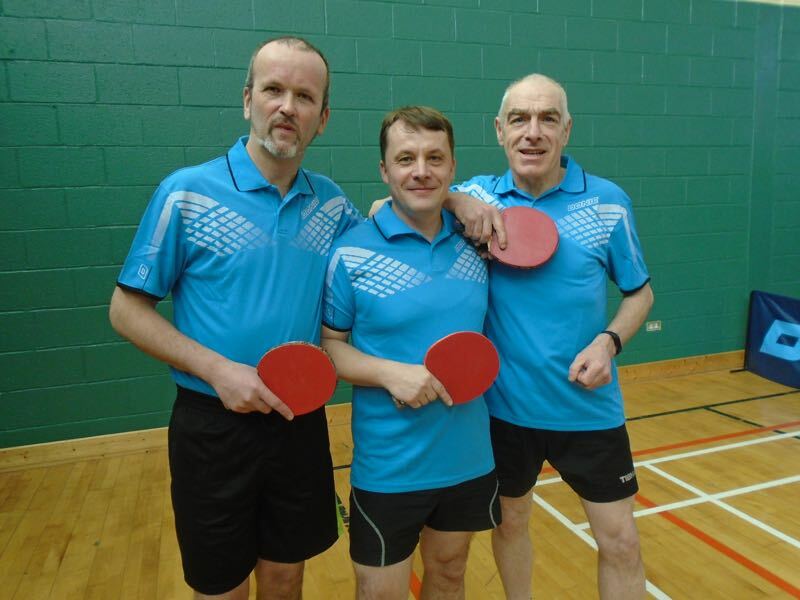 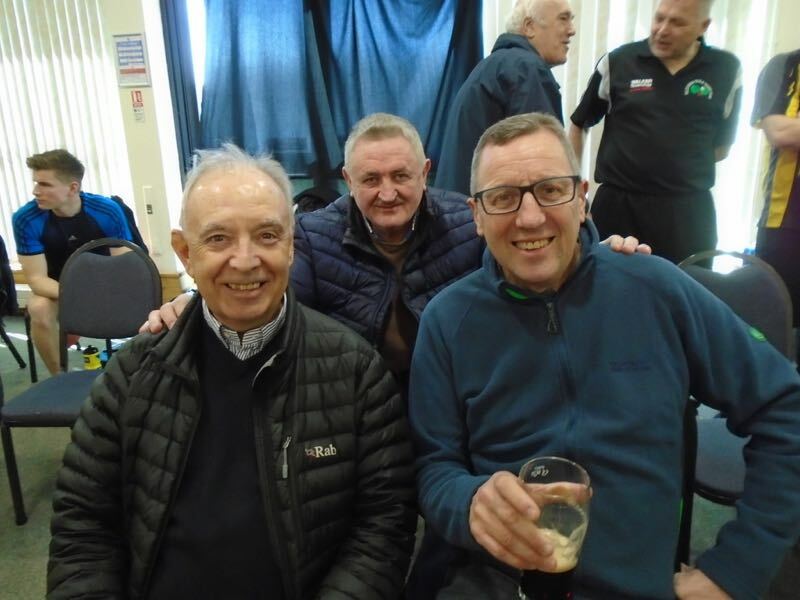 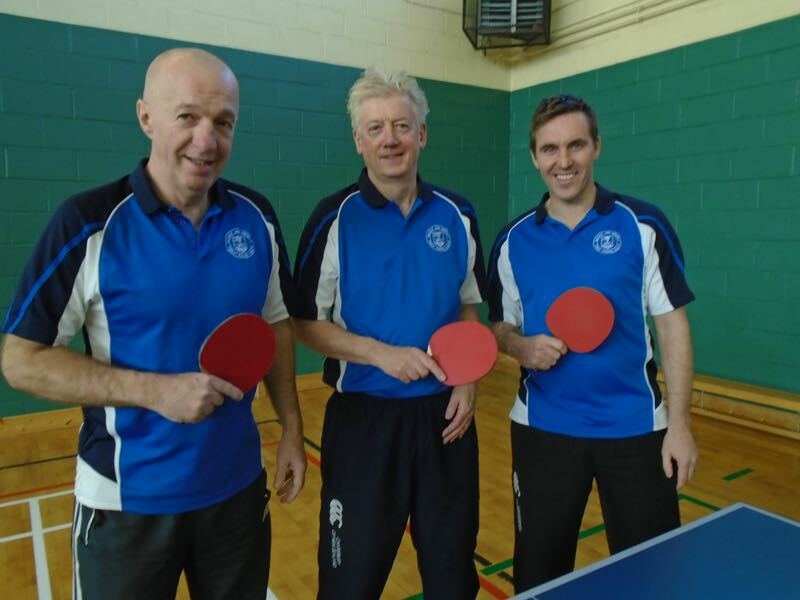 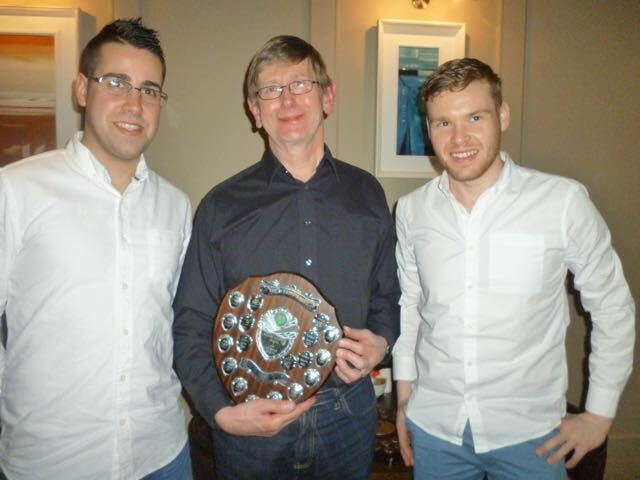 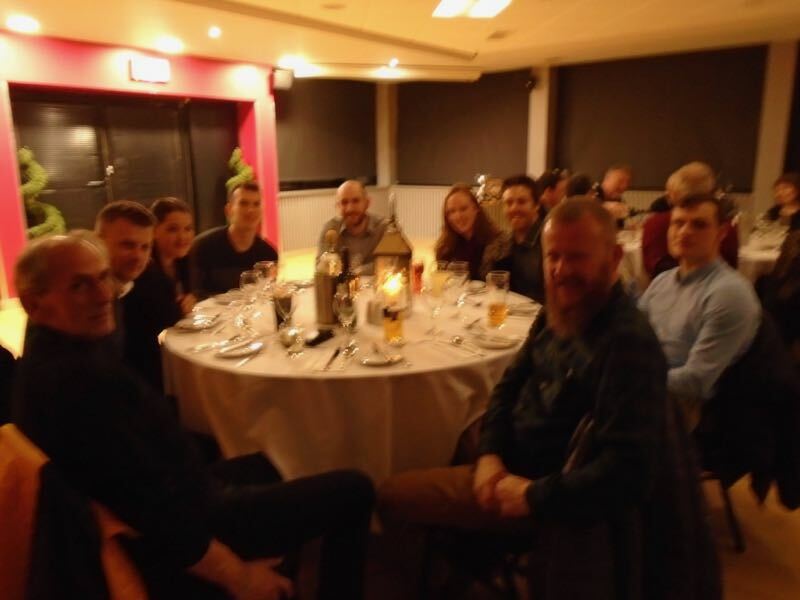 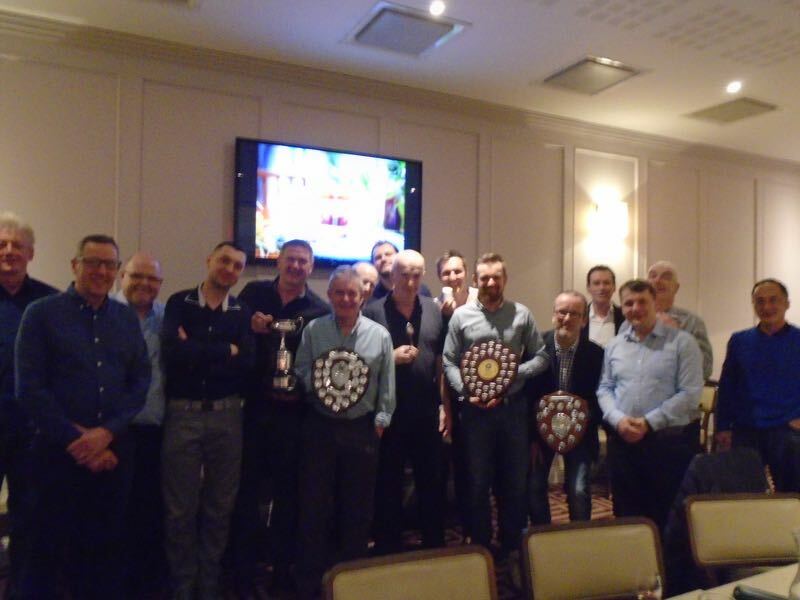 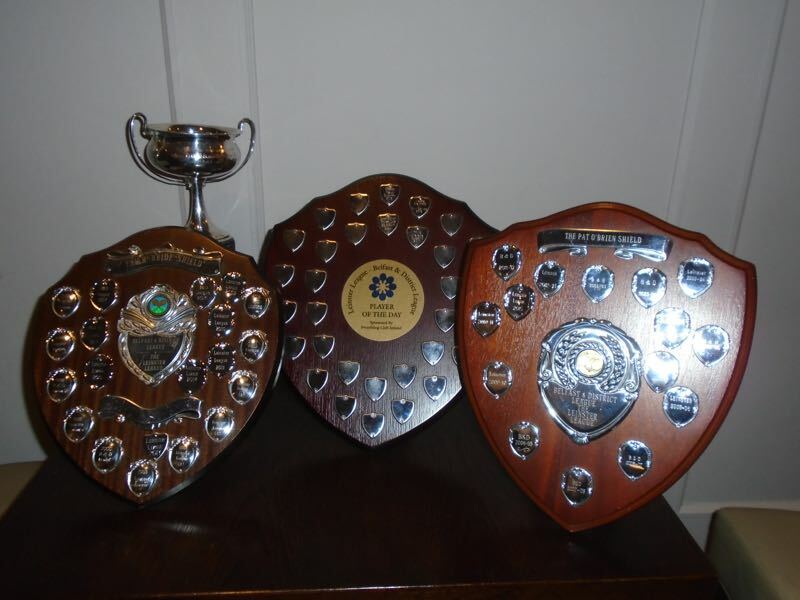 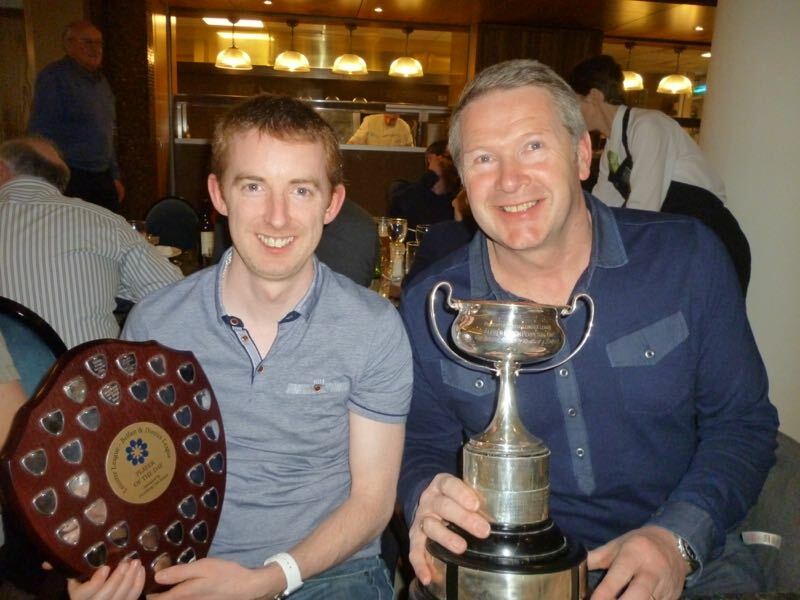 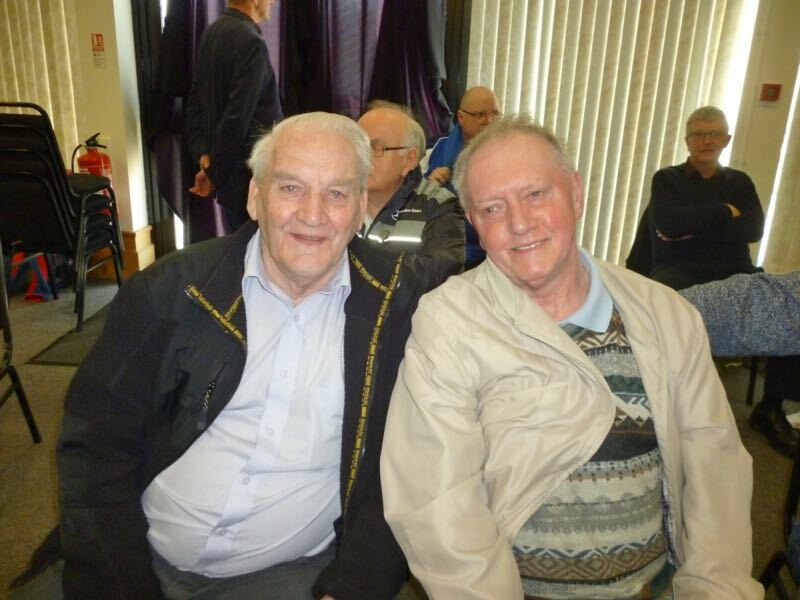 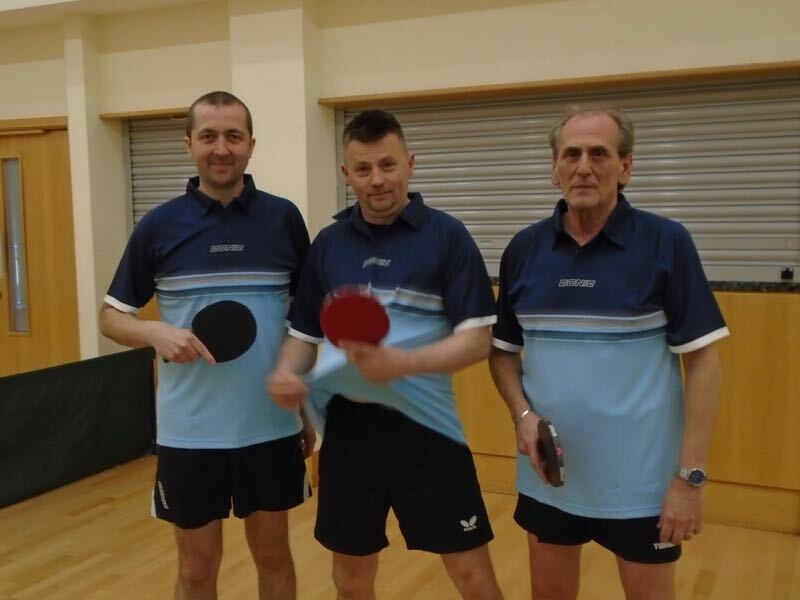 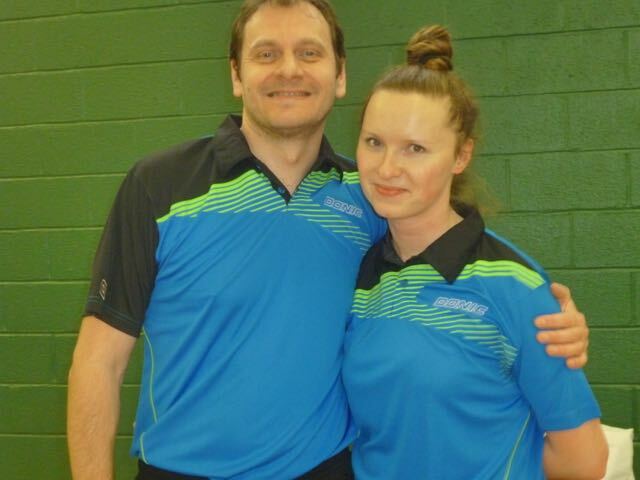 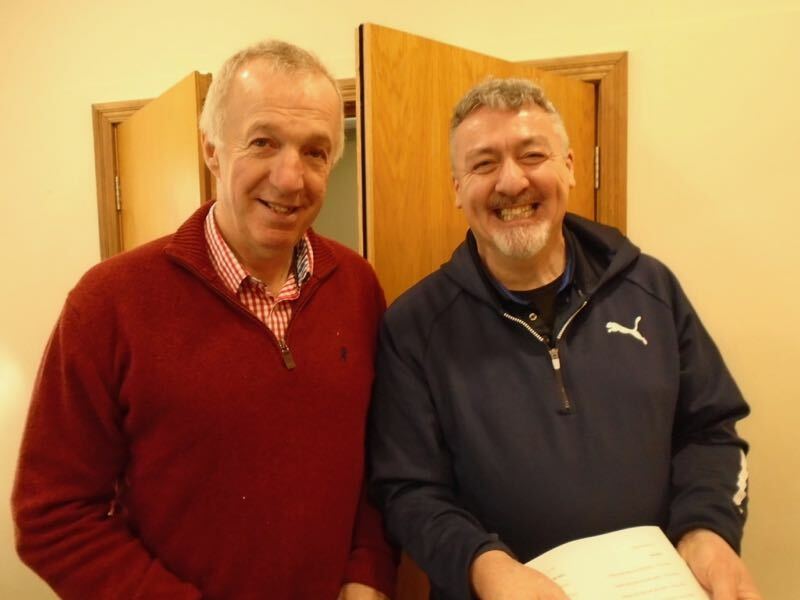 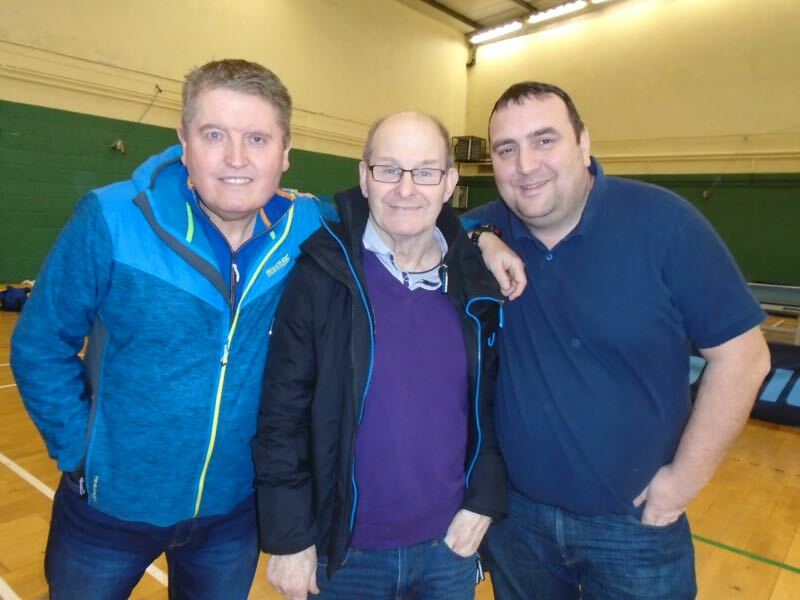 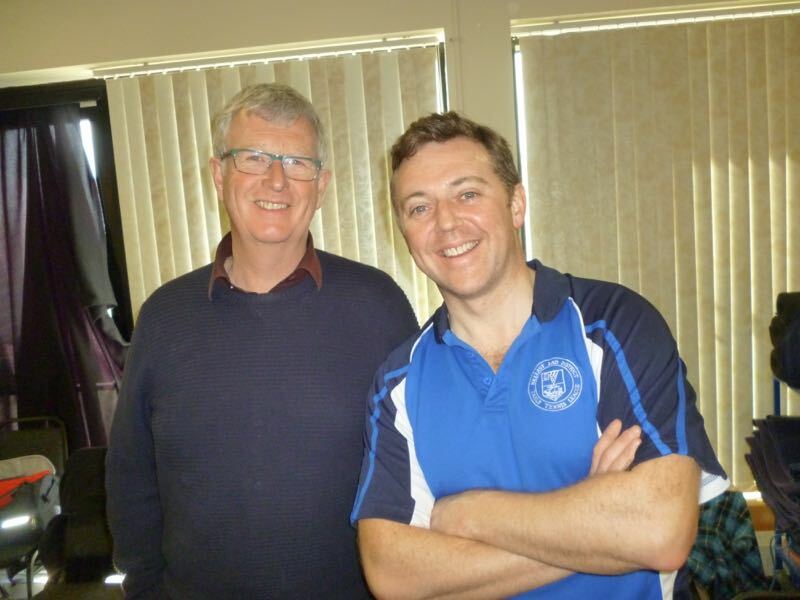 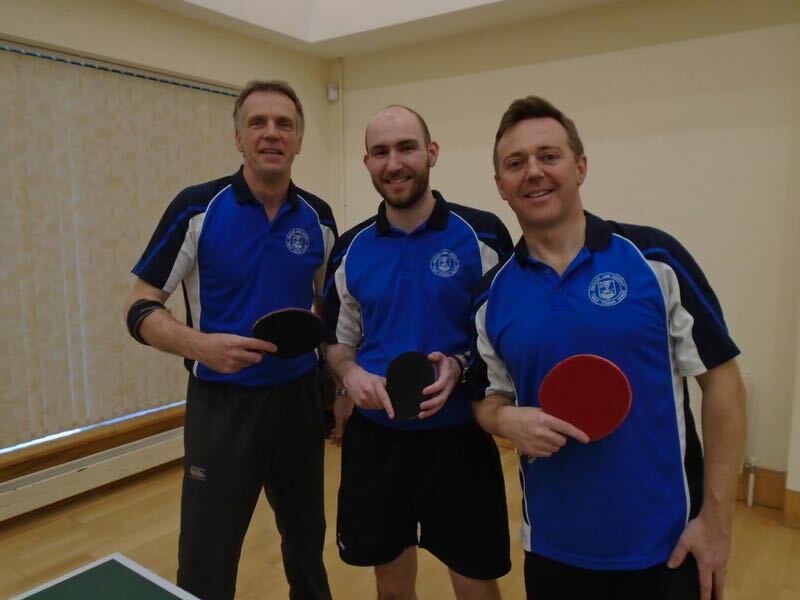 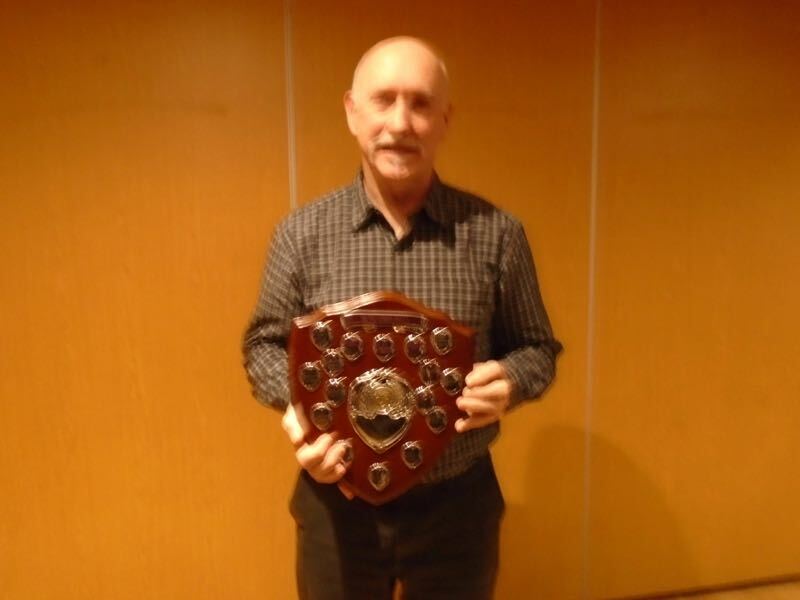 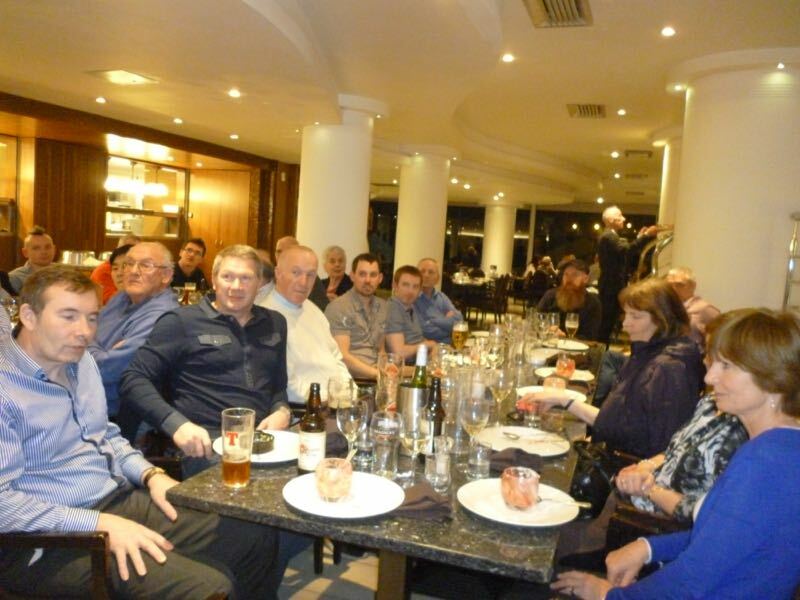 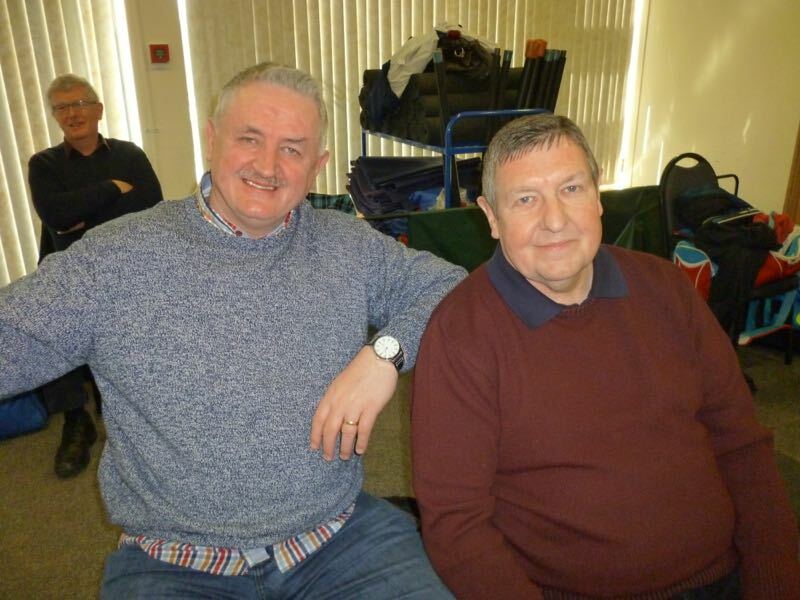 The 2019 Belfast District League v Leinster League match took place in the civil service tt club on Saturday 9th March. 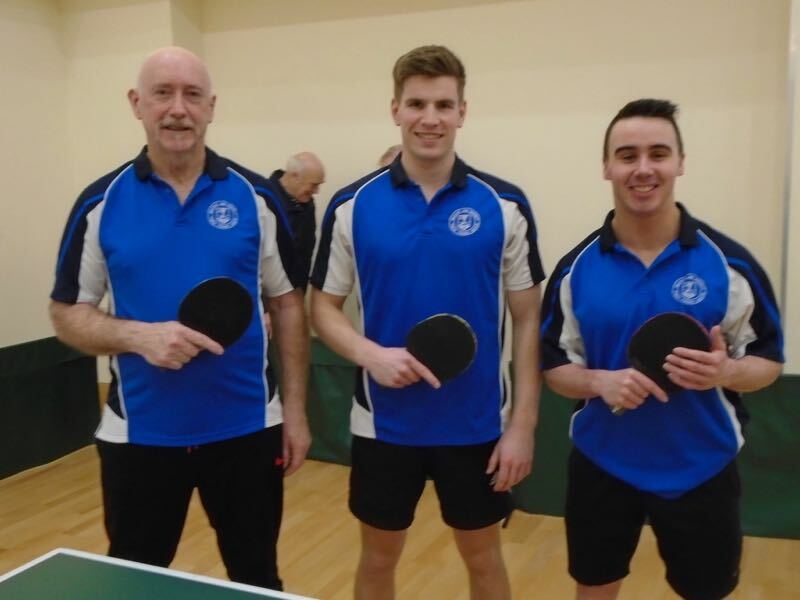 Belfast had a good start winning the first four matches but in the fifth games Branco won the fifth game in three sets the 6th and 8th games also went to Leinster with Tibor also winning his games in style in three sets. 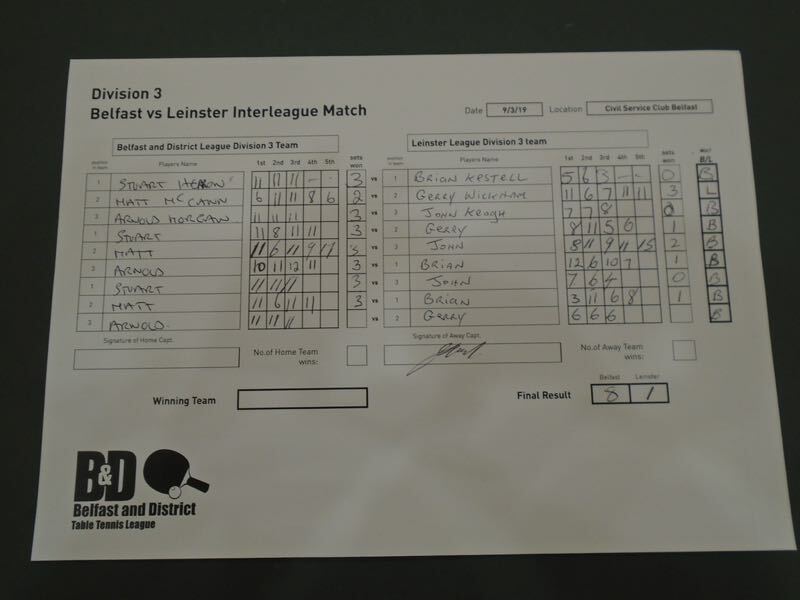 Does not reflect the play with two of the matches going to five sets six of the sets going to 10 each and over all it was a super match with great rallies and our players fought very hard but it just wasn’t to be. 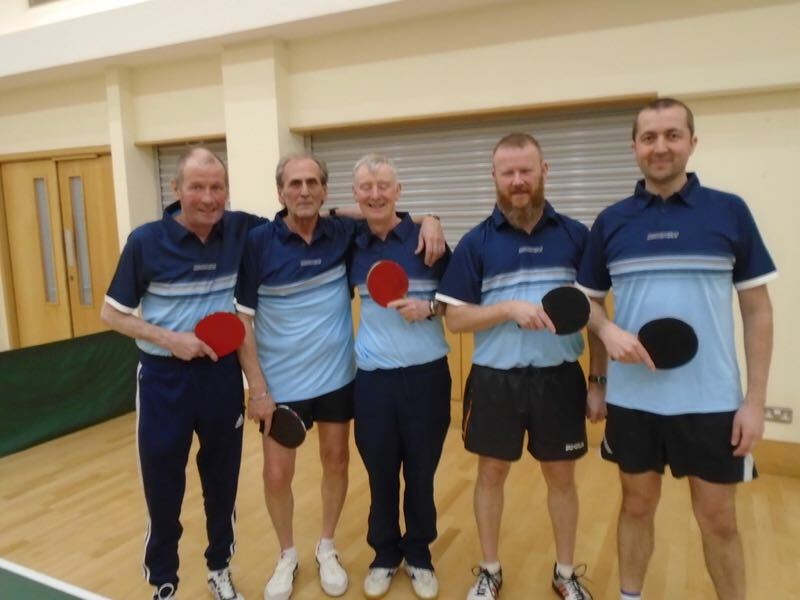 Well done to Belfast on winning the division with Gerry Wickham the only Leinster player to win in five sets and John Keogh just losing out to his opponent 15-17 in the fifth and Brian Kestell just losing out in four sets in two of his matches and again the players done us proud. 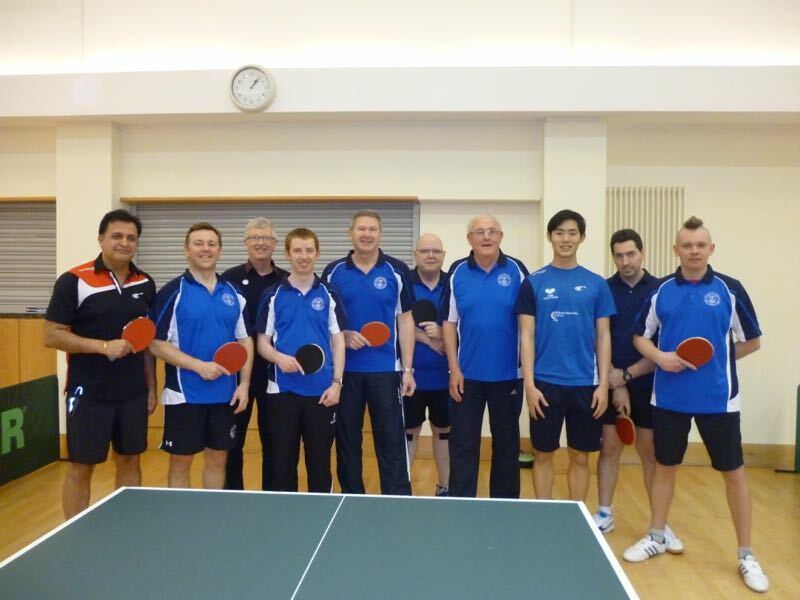 To conclude may I complaint all the players on playing so well giving us all and a very enjoyable match to watch. 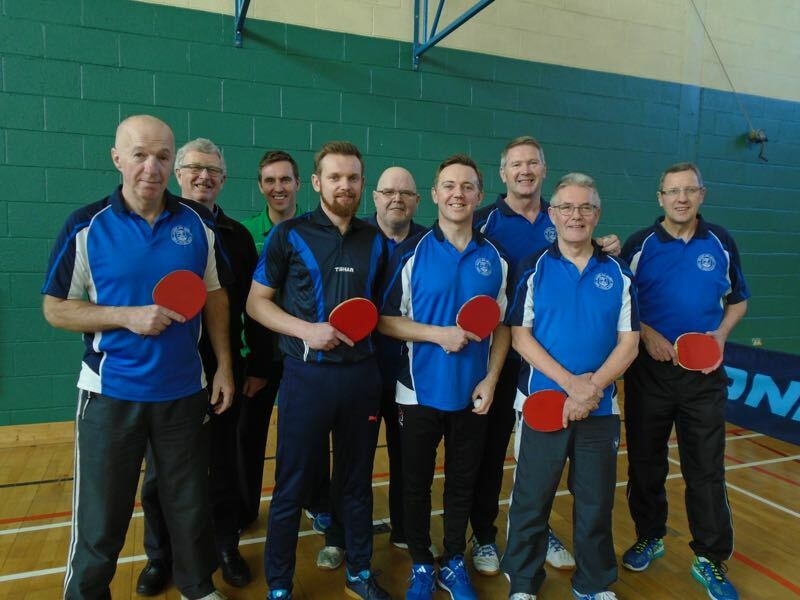 On behalf of the Leinster League committee and all the players I would like to congratulate Belfast on winning the three divisions and been such gracious hosts. 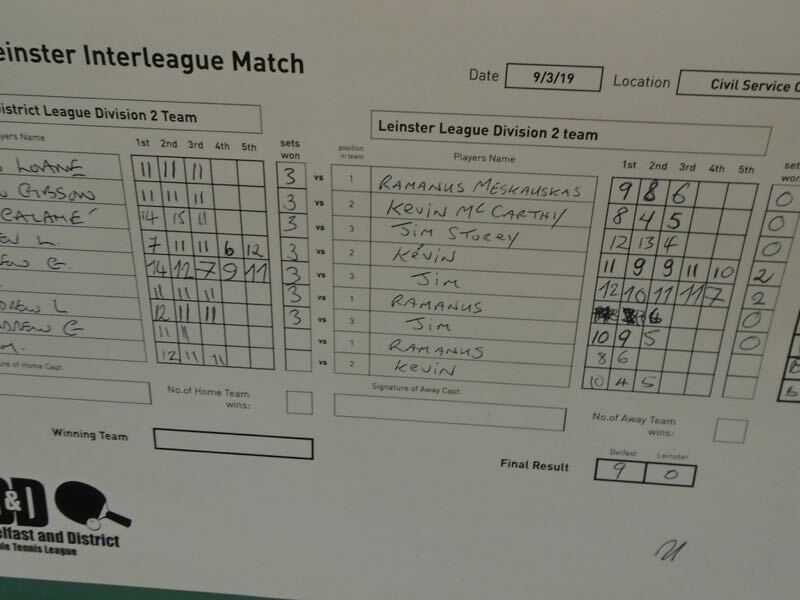 The annual Leinster v Belfast & District Leagues match takes place this weekend, featuring some of the best players from both leagues. 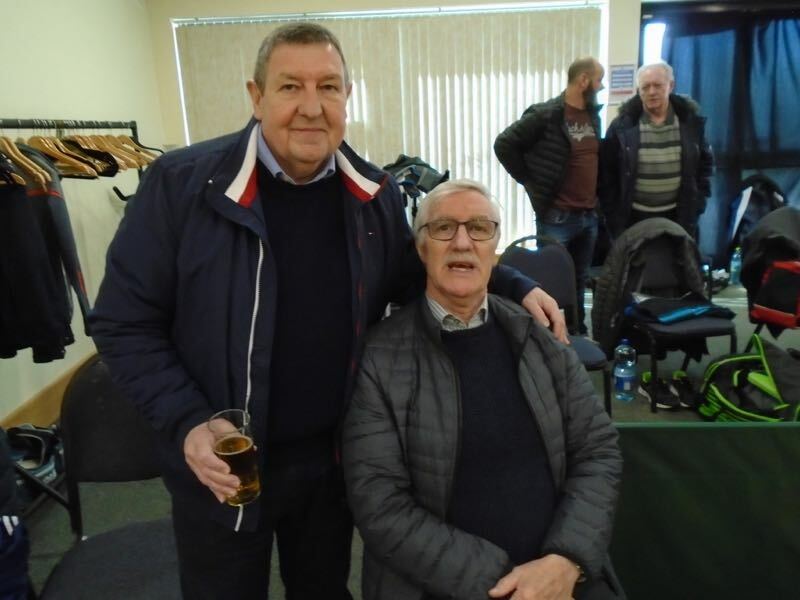 A report on the match will be posted as soon as it’s available. 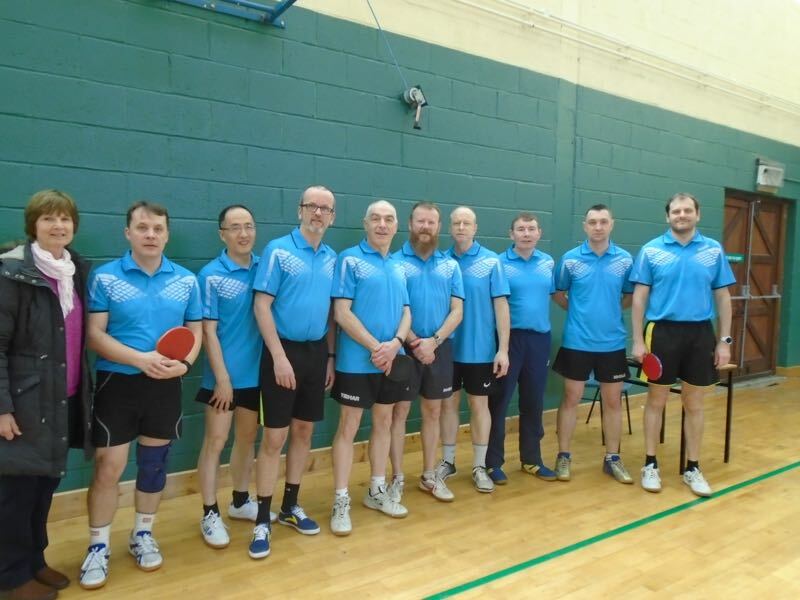 The 2018 Leinster League v Belfast & District League Match took place in PingZone on Saturday 17th February. 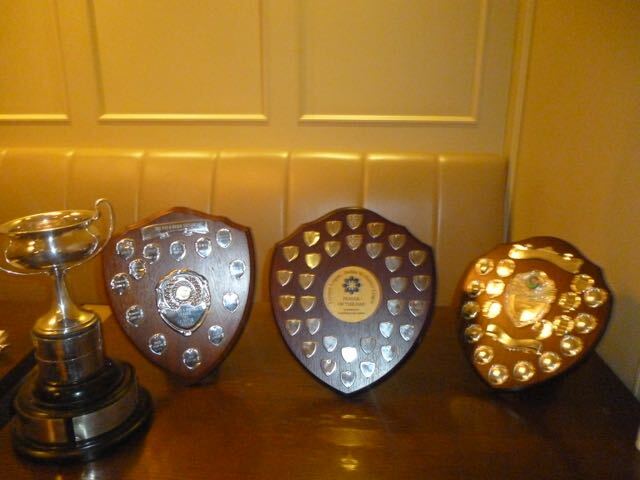 The player of the day was a really hard decision. 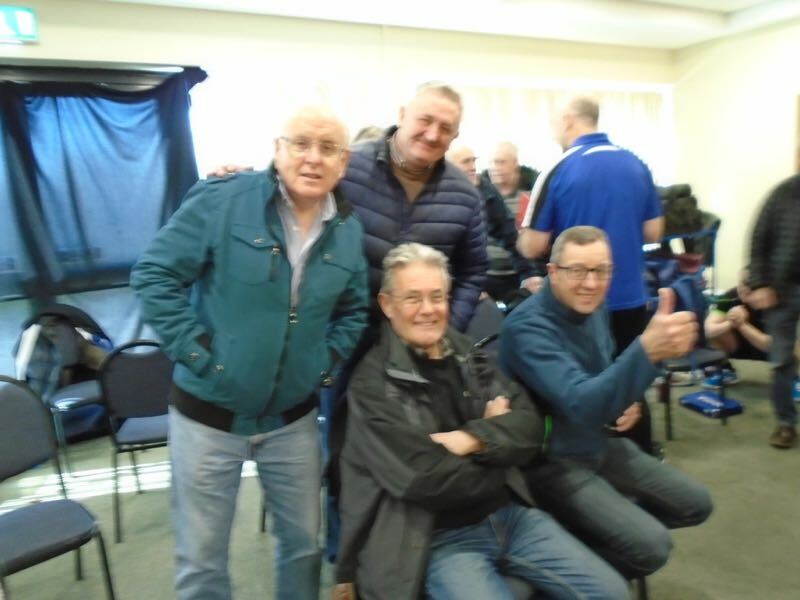 We had four players who had won all their games – Alex from the first team, Steve from the second and Gerry and Tony from the third. 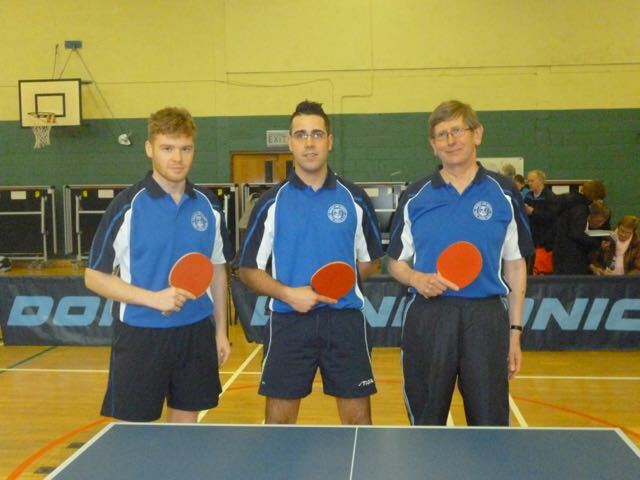 Alex was chosen as he had won a really tight 5 set game at a crucial stage of the match. 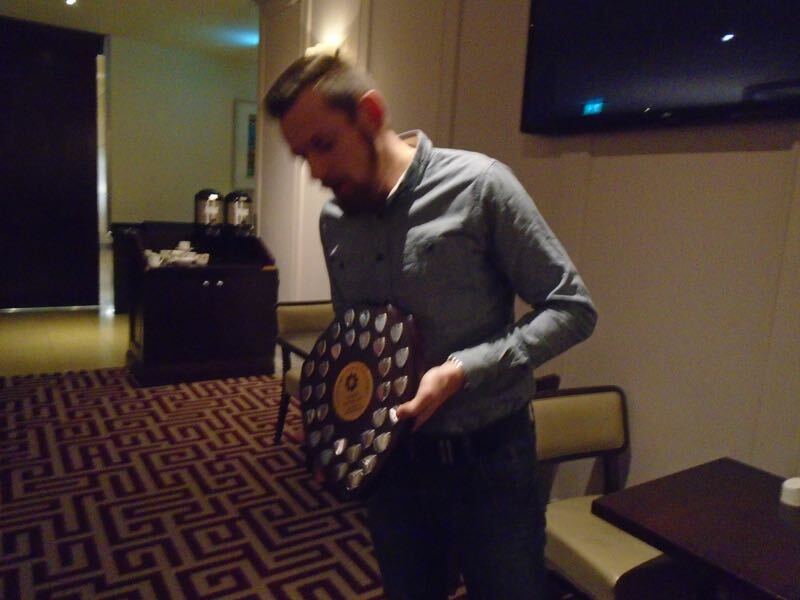 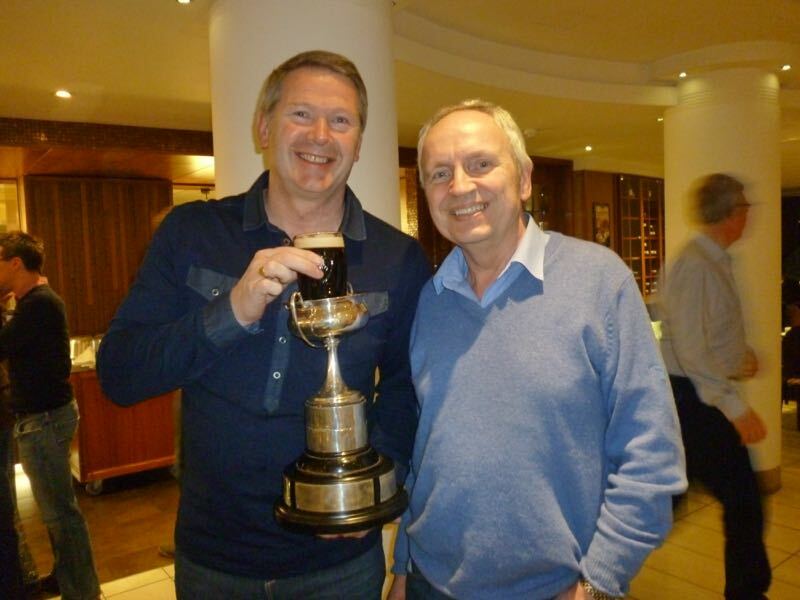 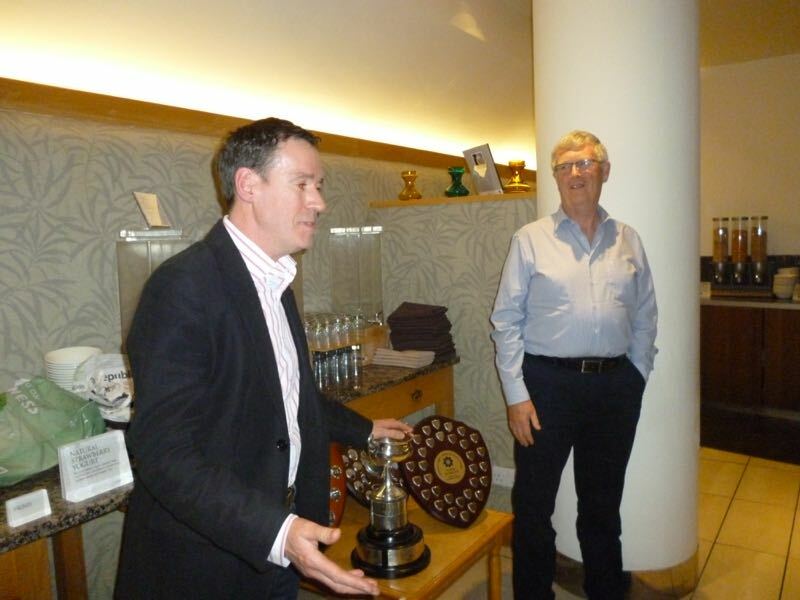 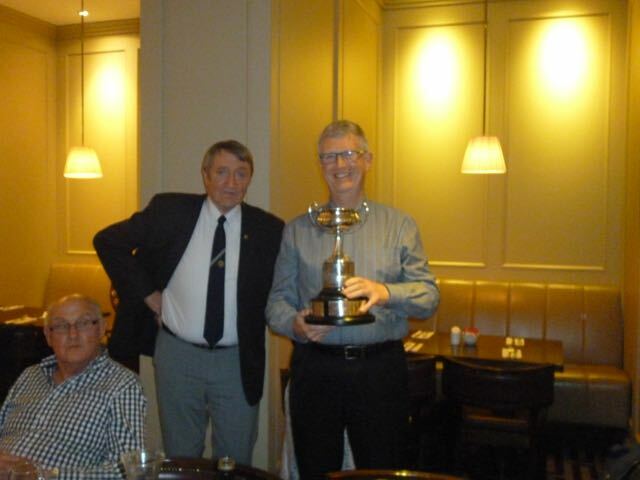 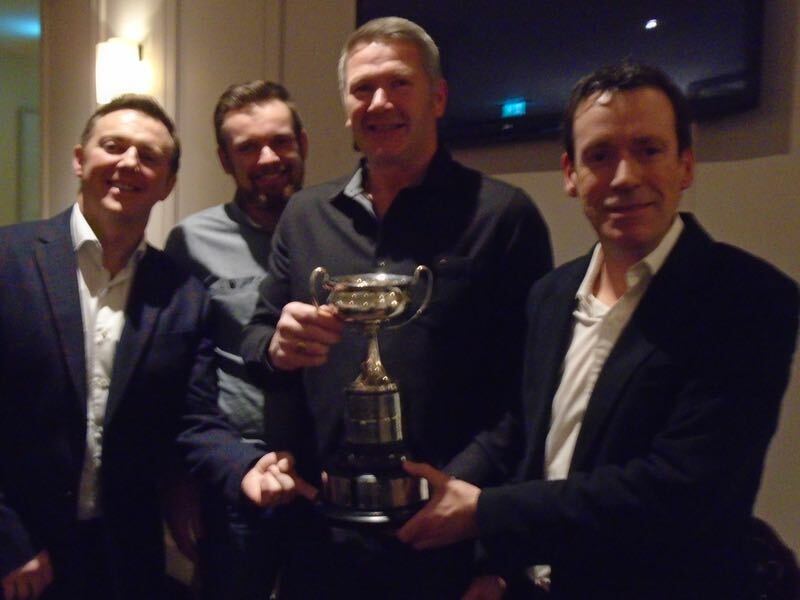 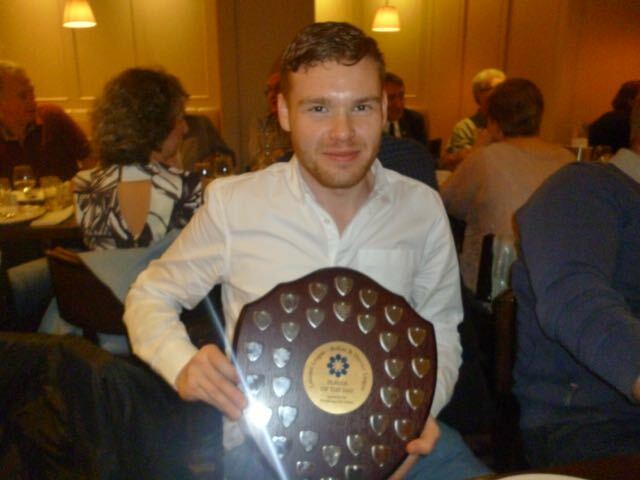 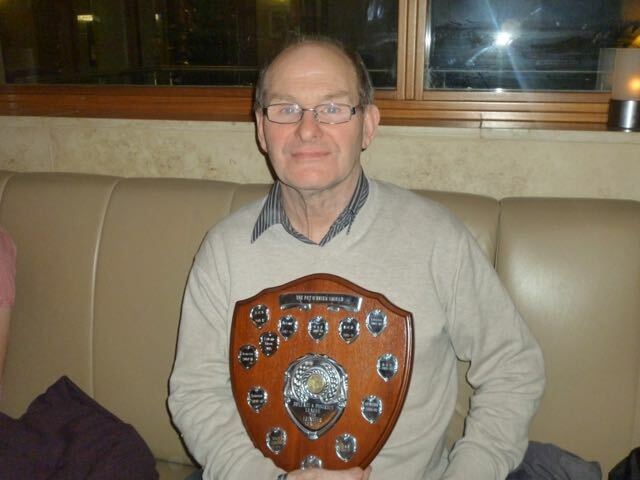 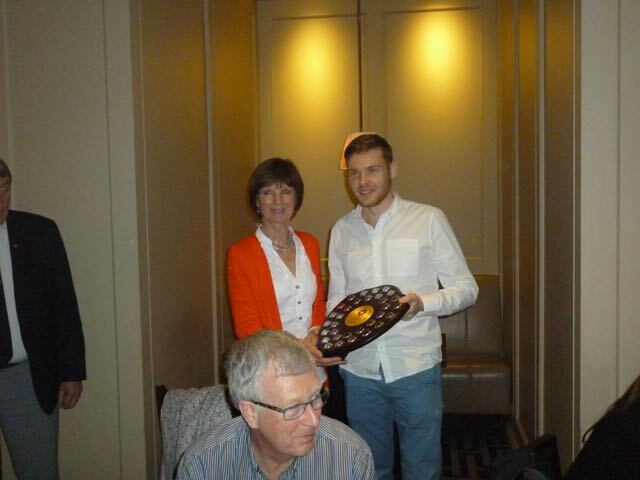 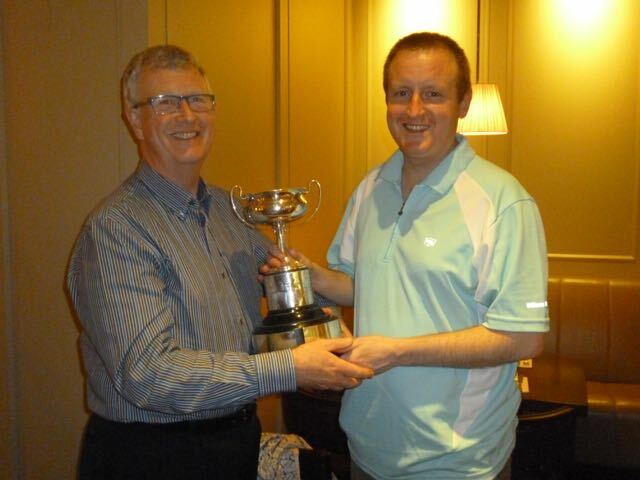 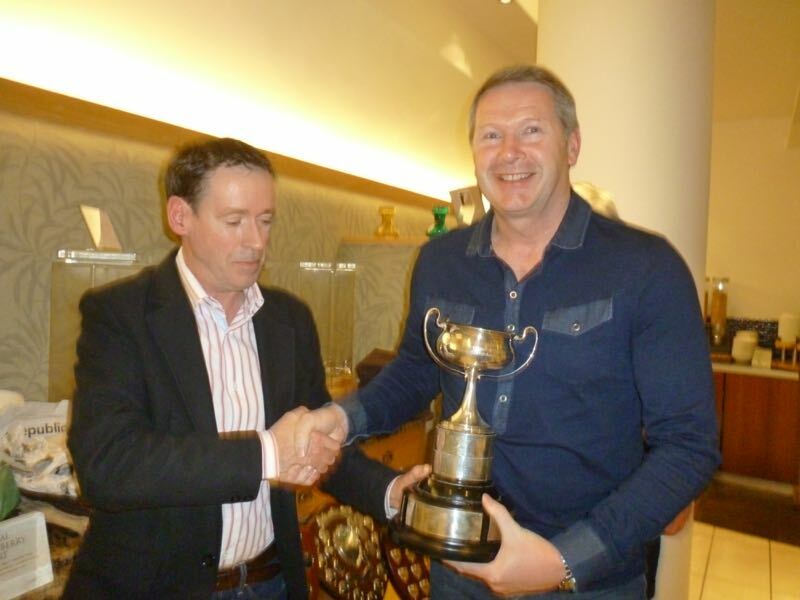 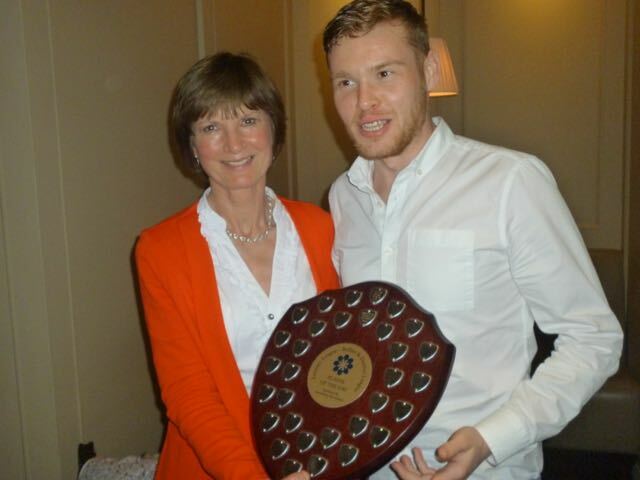 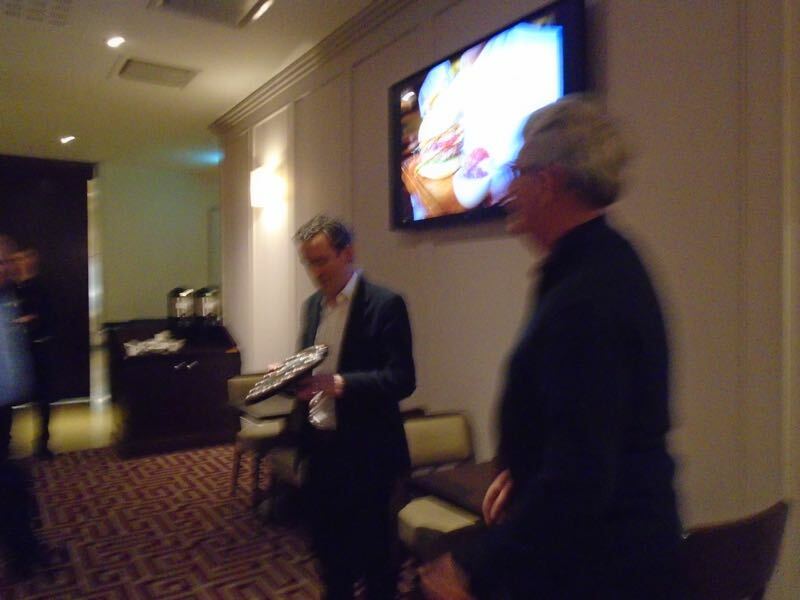 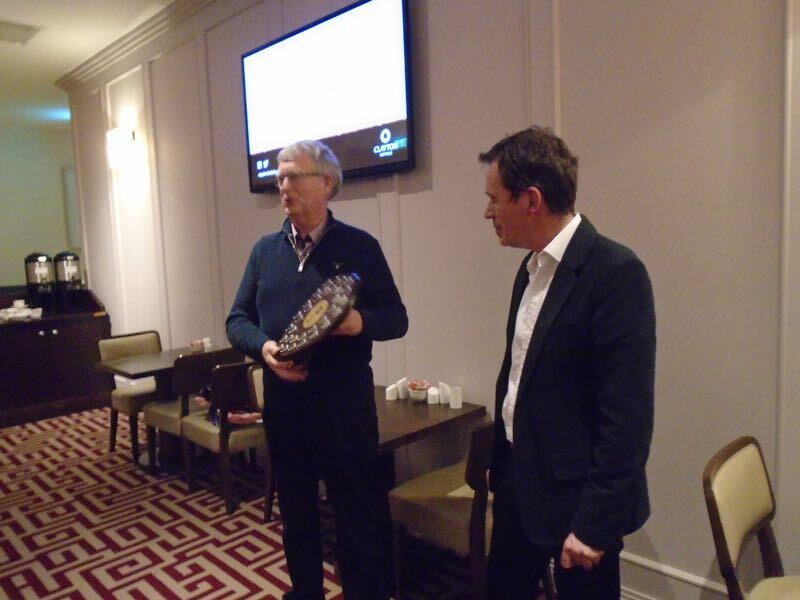 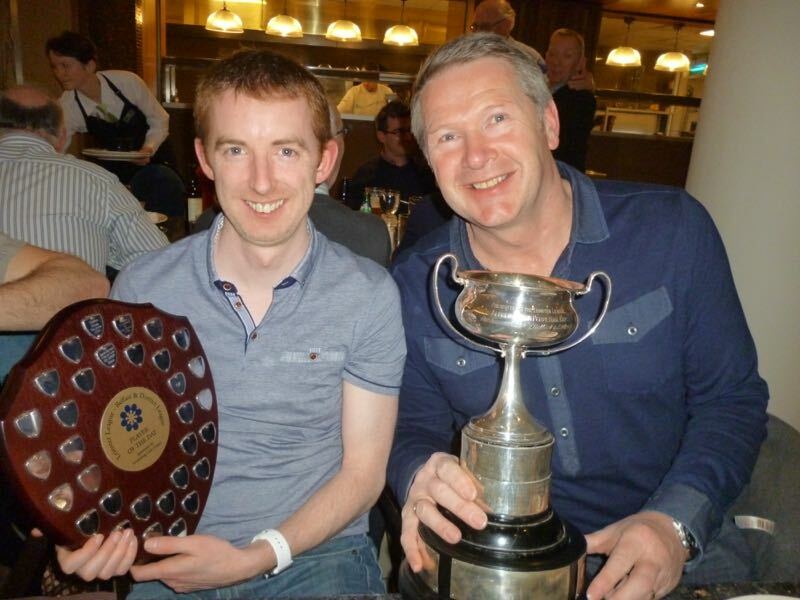 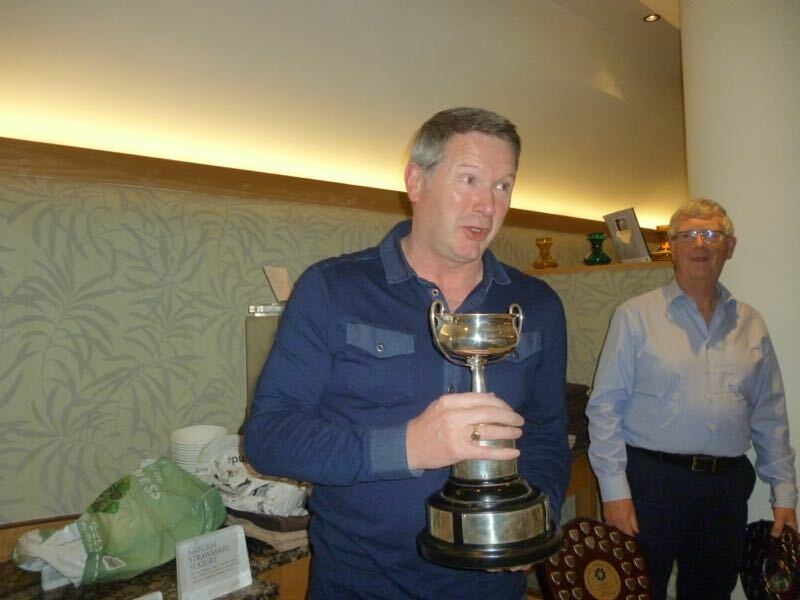 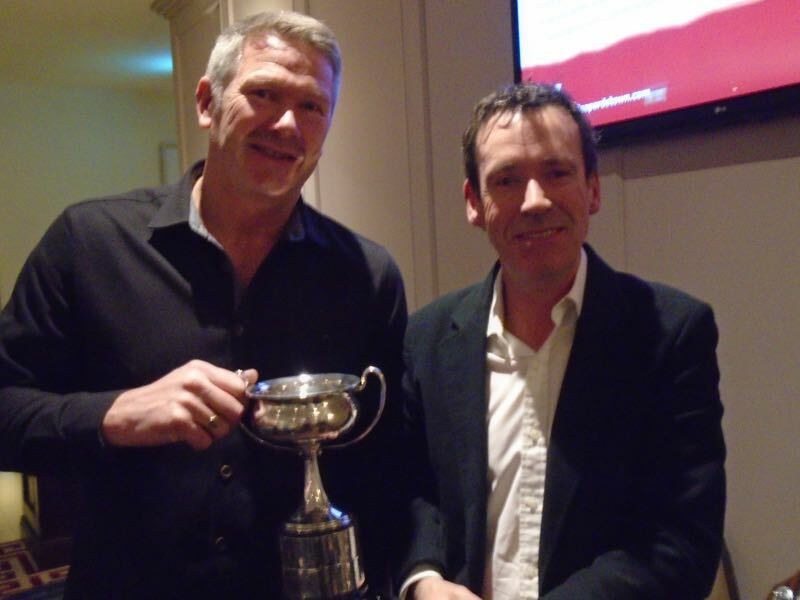 He was presented with the Pat O’Brien individual trophy. 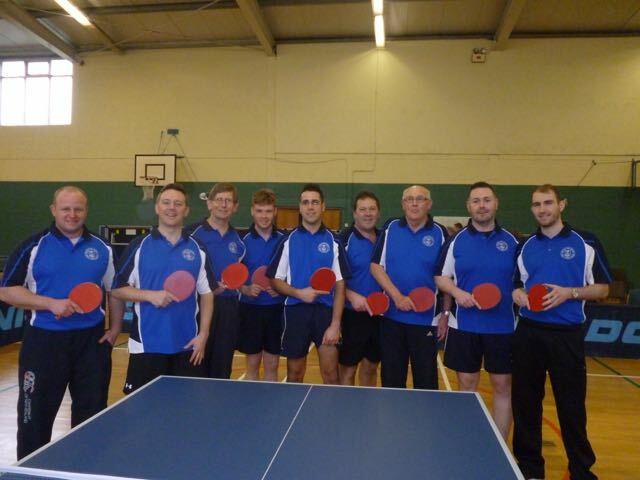 Well done to all the players for giving us such an enjoyable day of table tennis. 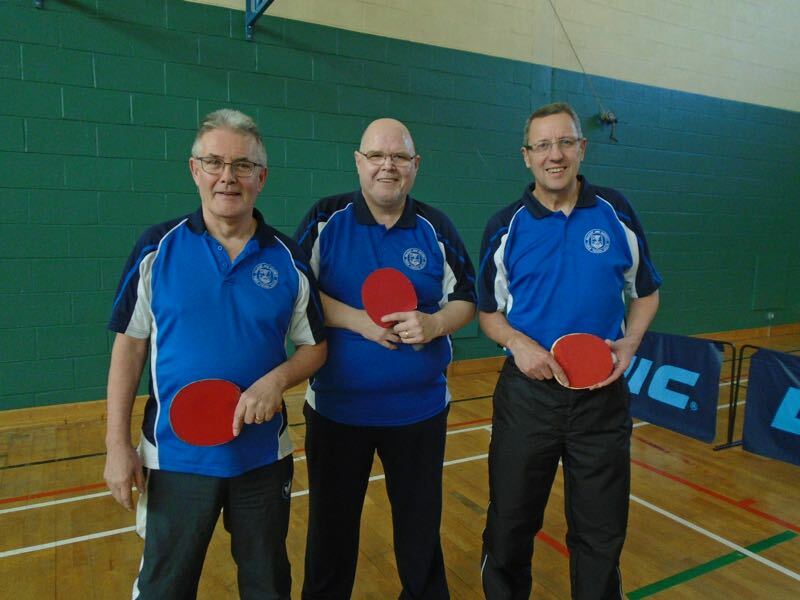 Some of the games were so close they could have gone either way but well done to Belfast for getting the overall win. 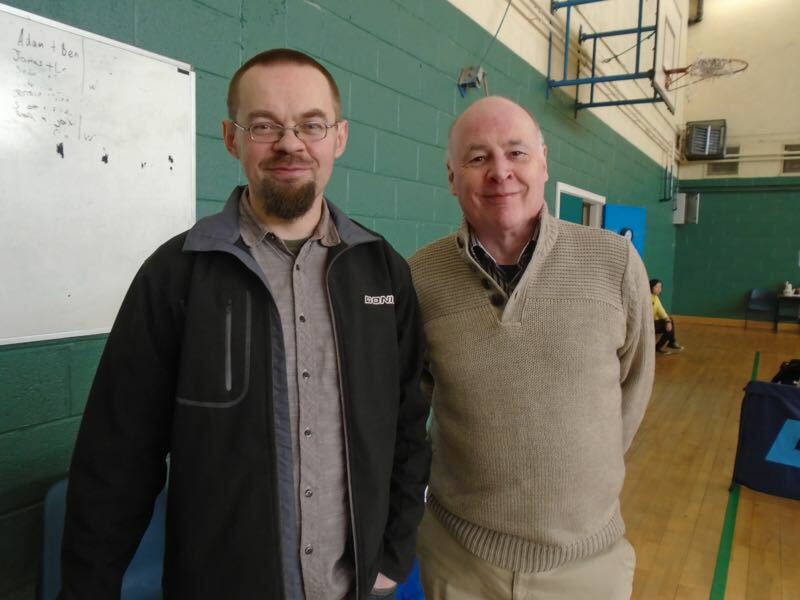 Many thanks to Roman from Pingzone for giving us the hall and for providing tea and coffee. 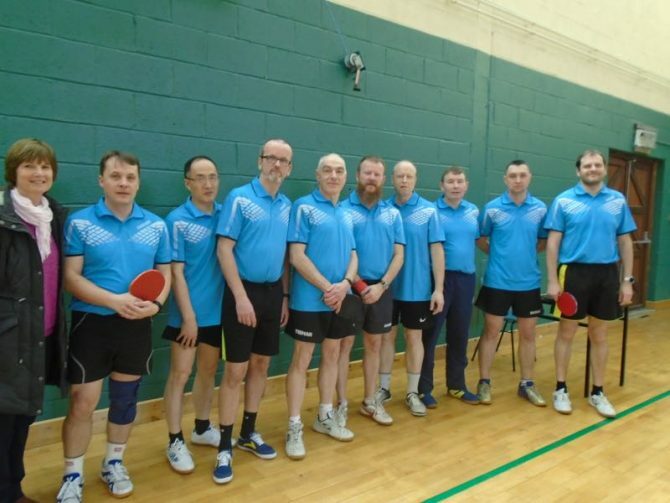 Well done to all of the players picked to represent the Leinster League. 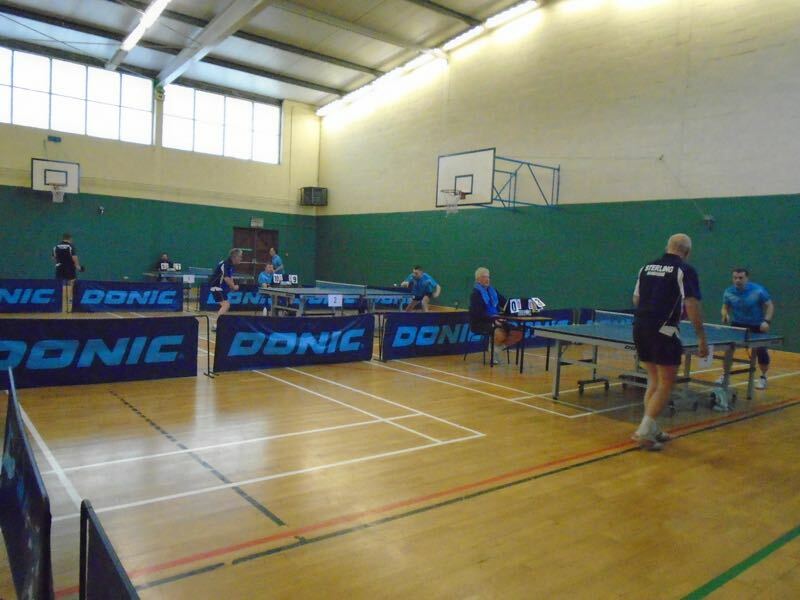 The matches are scheduled for 2pm on Saturday 17th February in PingZone. 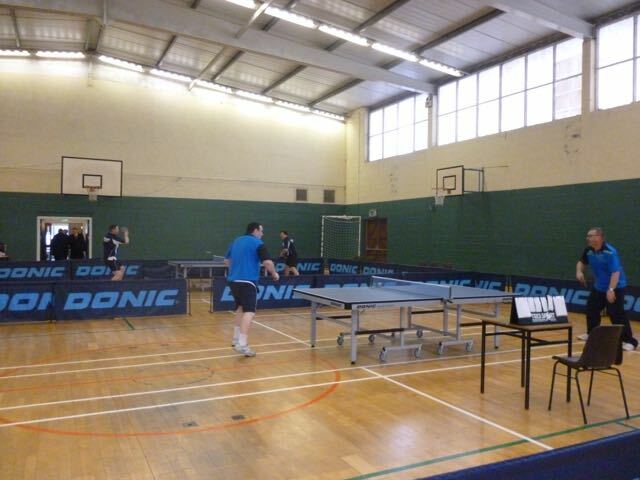 The start time was previously marked as 2:30pm, but that has been corrected to 2pm. 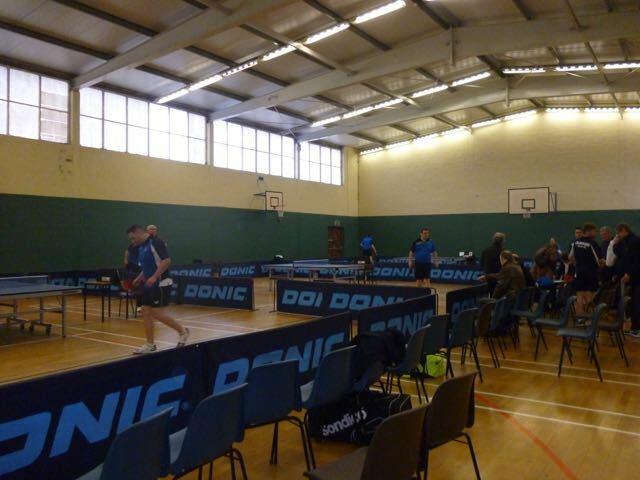 Spectators are welcome, and there should be some great matches, featuring some of the best players from both leagues. 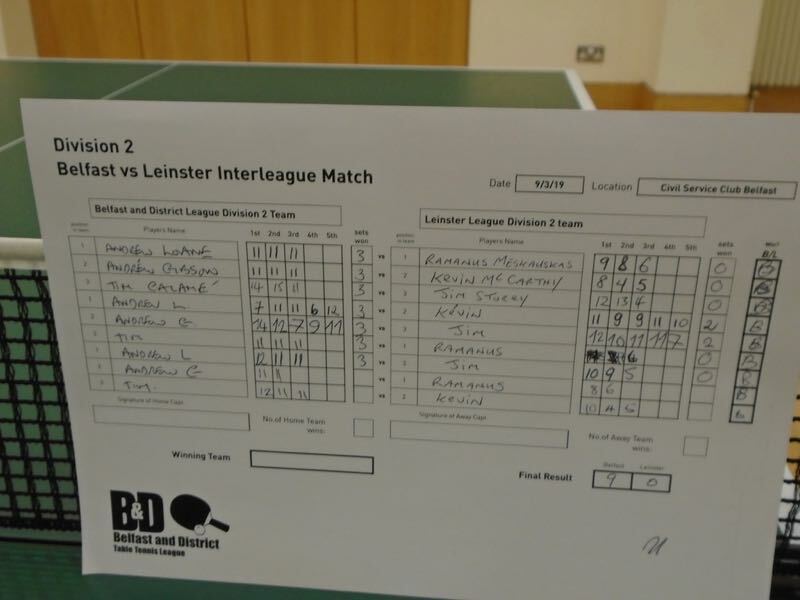 Last year, Belfast won out 2-1, with all 3 team matches ending 5-4. 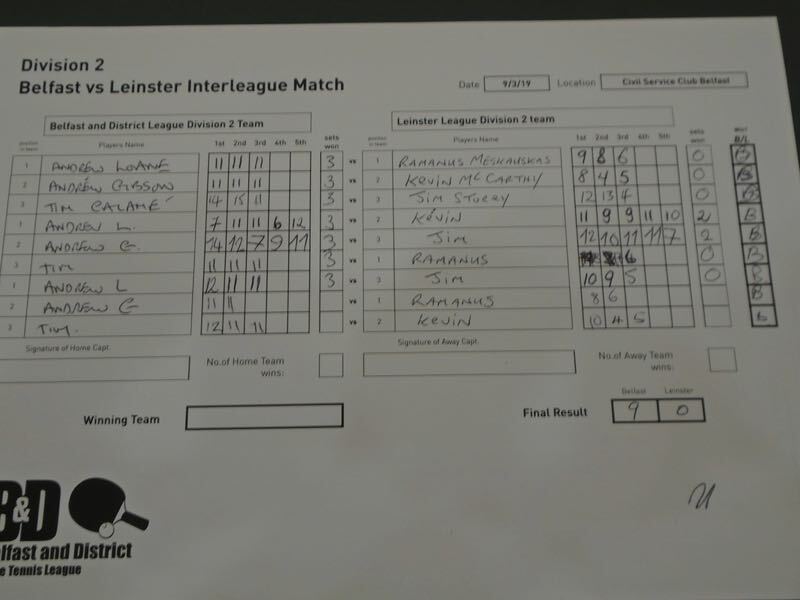 You can read the 2017 match report here. 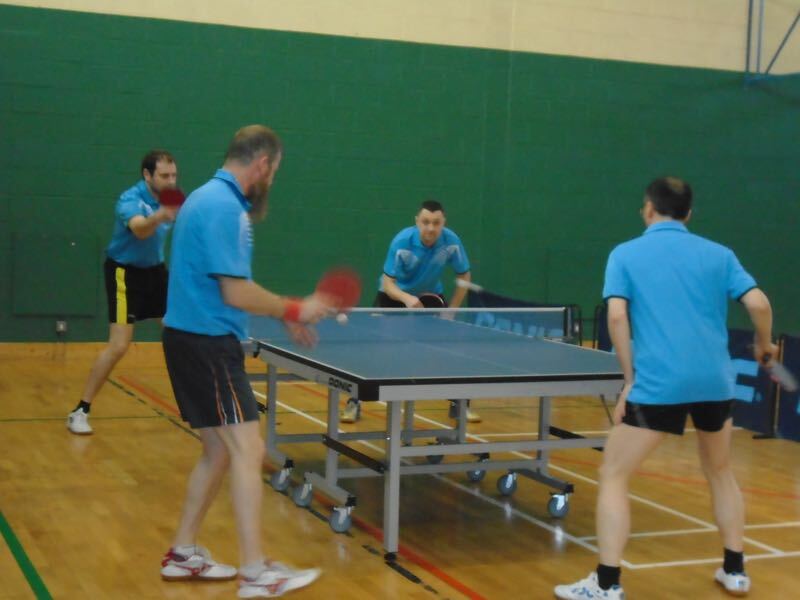 The 2018 Leinster v Belfast & District League match is scheduled for Saturday 17th February in PingZone. 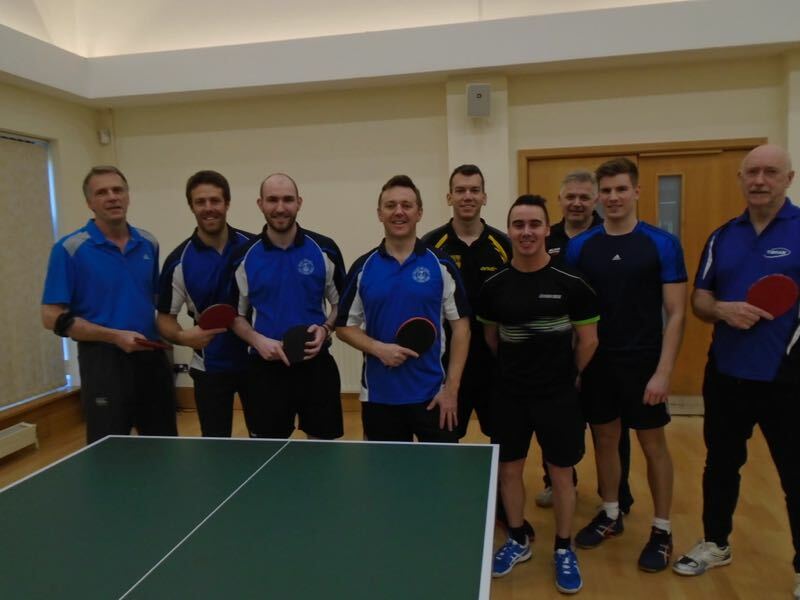 The committee will be meeting to pick teams on Wednesday 24th January. 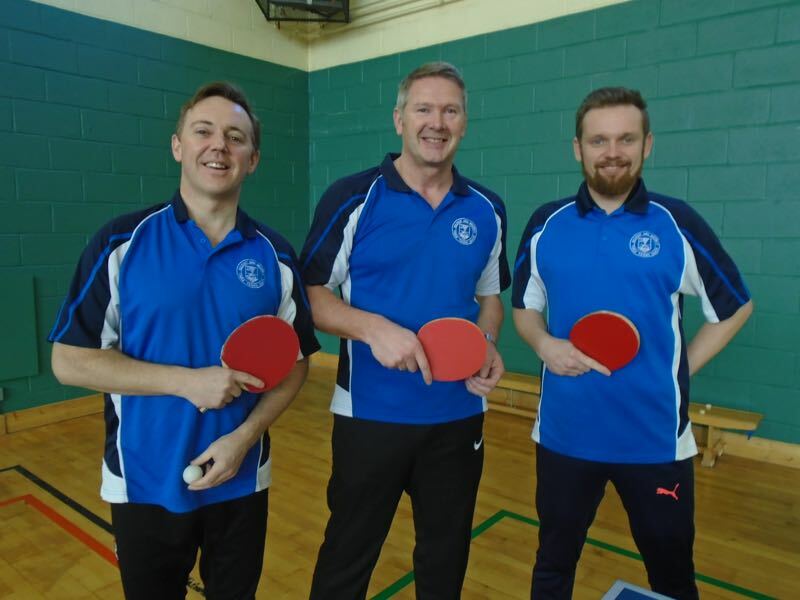 Photos from the 2017 Belfast & District versus Leinster League Match. 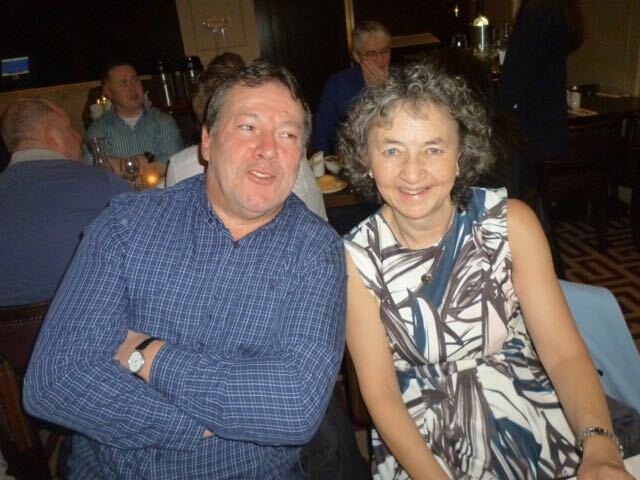 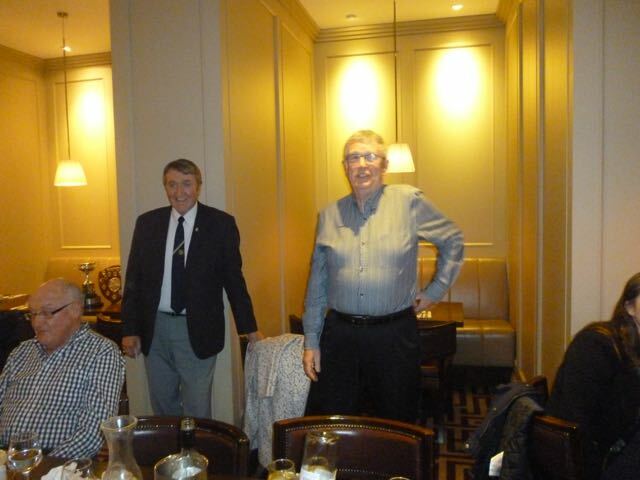 Photos provided by Jimmy Flemming. 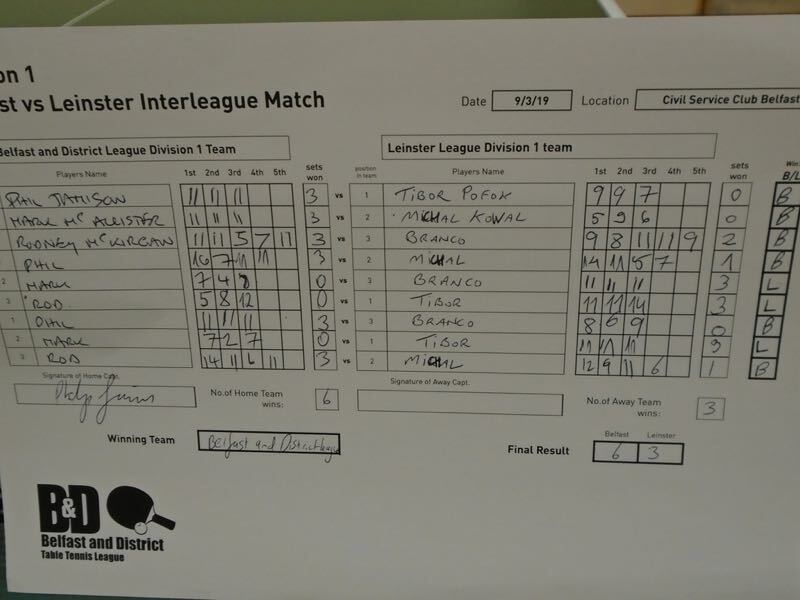 THE BELFAST & DISTRICT LEAGUE V LEINSTER LEAGUE MATCH TOOK PLACE IN BELFAST ON SATURDAY 25TH MARCH 2017. 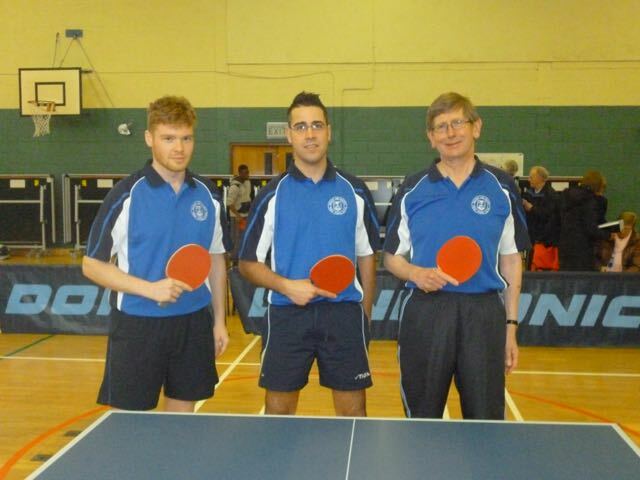 This was a day of really good table tennis and a pleasure to watch. 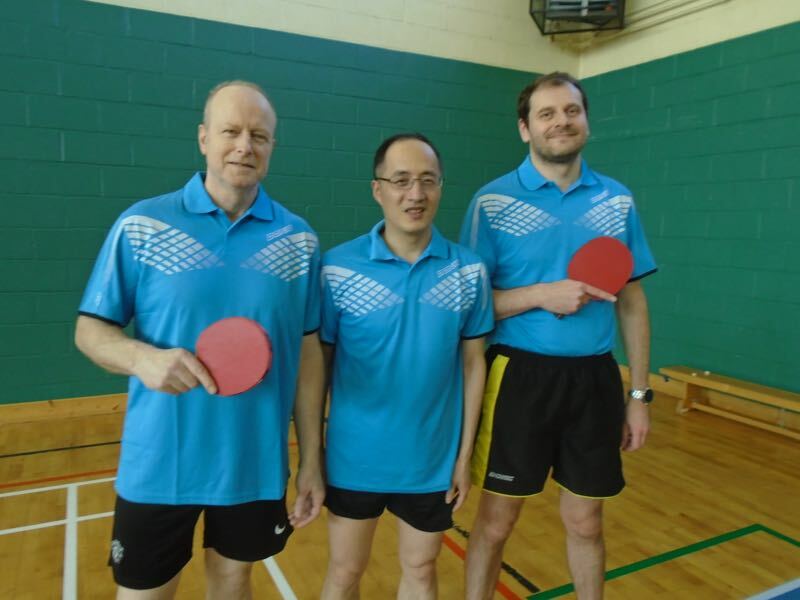 Last year I received an e mail over comments I made about funny rubbers so no mention of them this year. 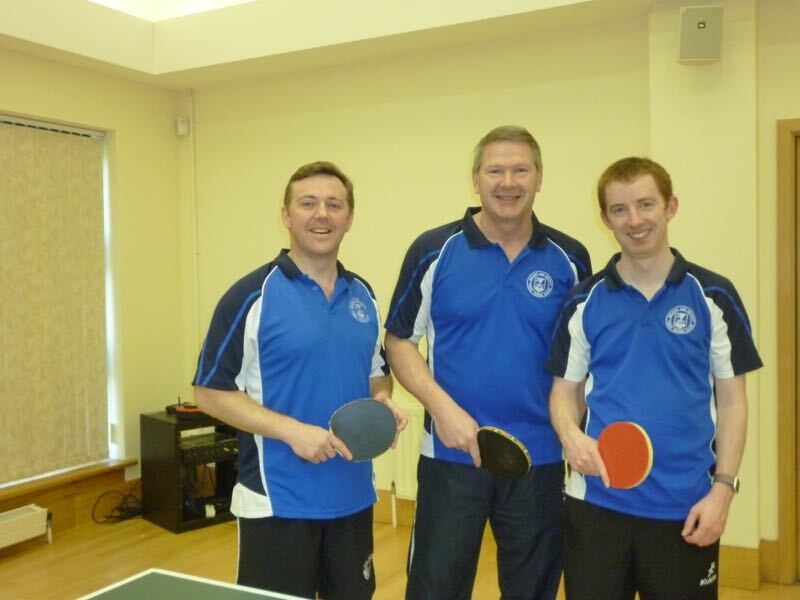 Marius got Leinster off to a great start winning in straight sets against Rodney Mc Kirgan. 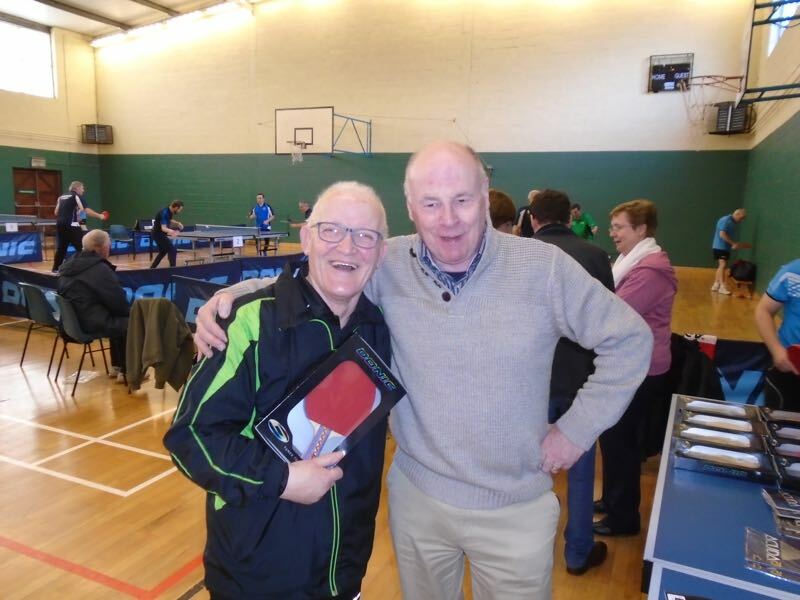 Leinster thought they had another one in the bag when Brian was 2 nil up against Philip Wallace but Philip had other ideas. 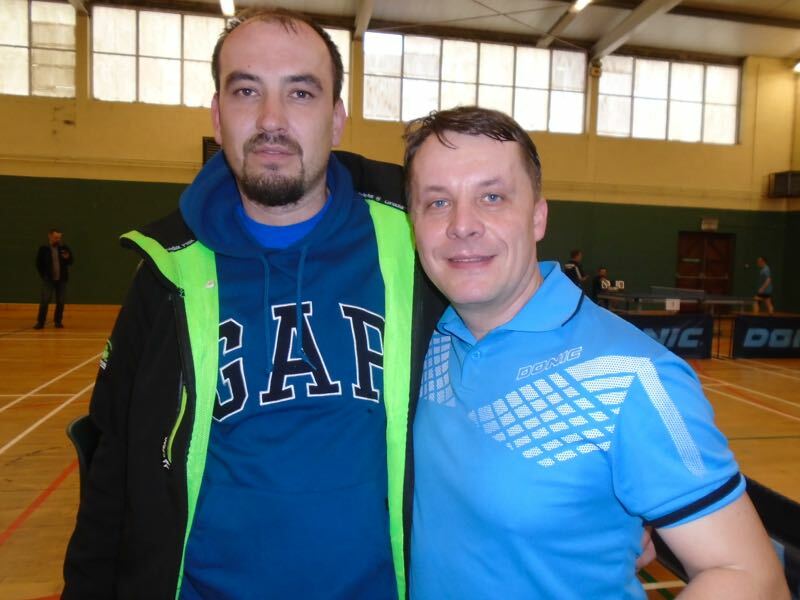 He won the third set 11/6. 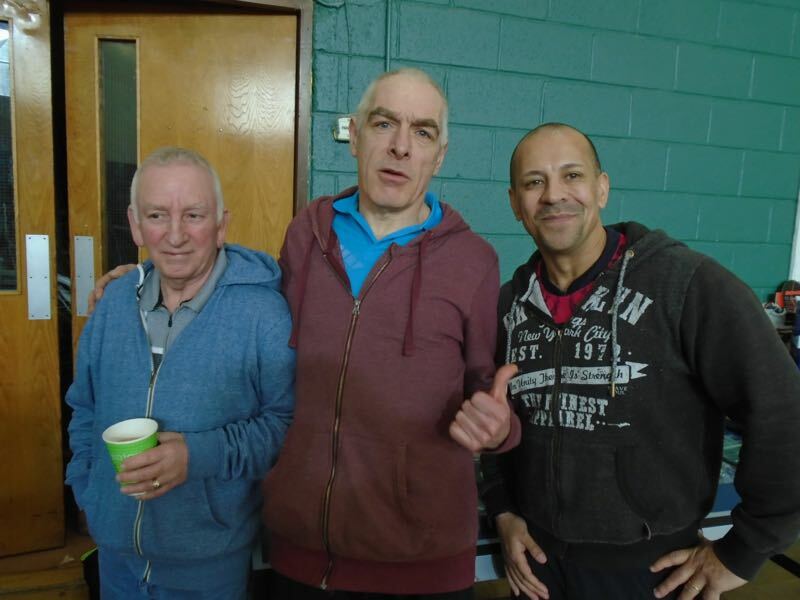 Brian was up 9/7 in the 4th but Philip came back and won 12/10 and he also won 12/10 in the 5th which made it 1-1. 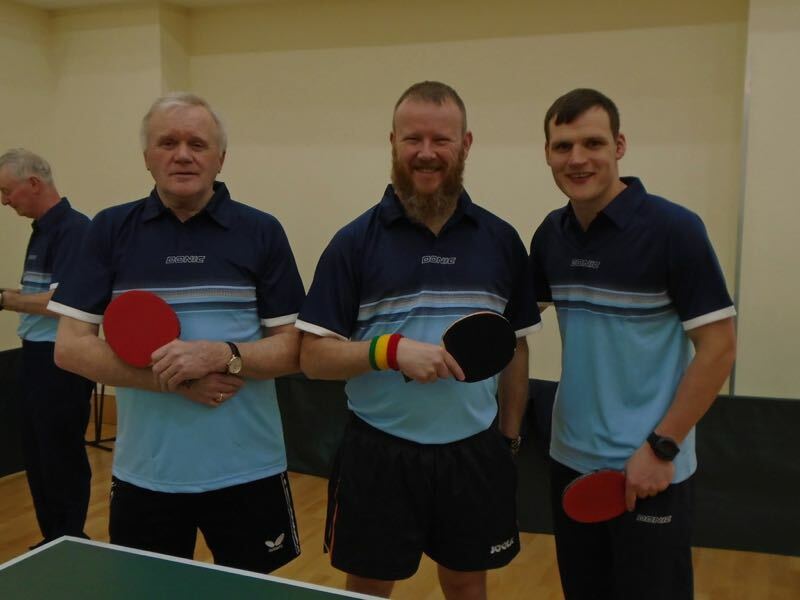 Willie Cherry then beat Stephen in four sets. 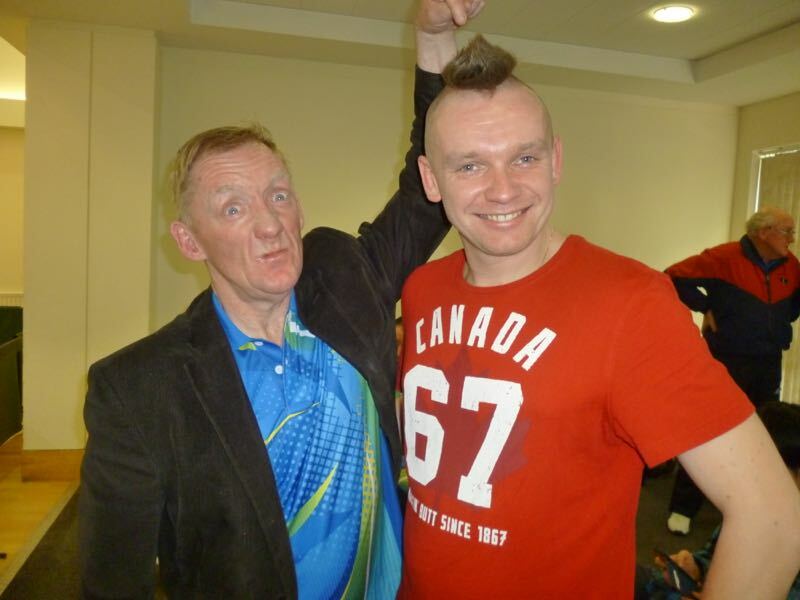 Next up, Philip against Marius. 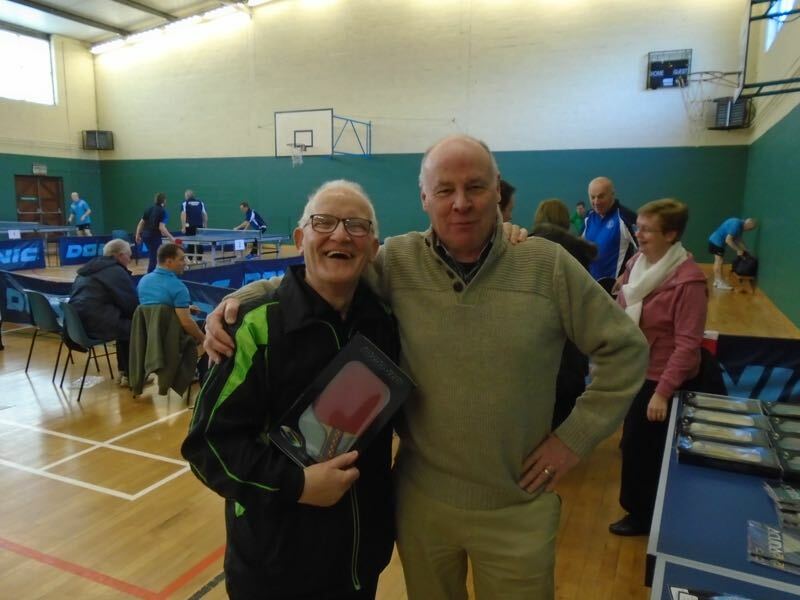 Again Philip was down 2 nil but went on to win the next three 11/9, 12/10 and 11/9. 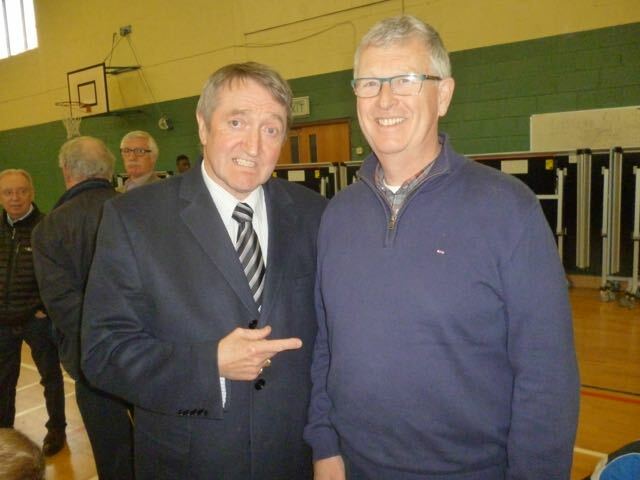 He was later to be referred to as the come-back kid. 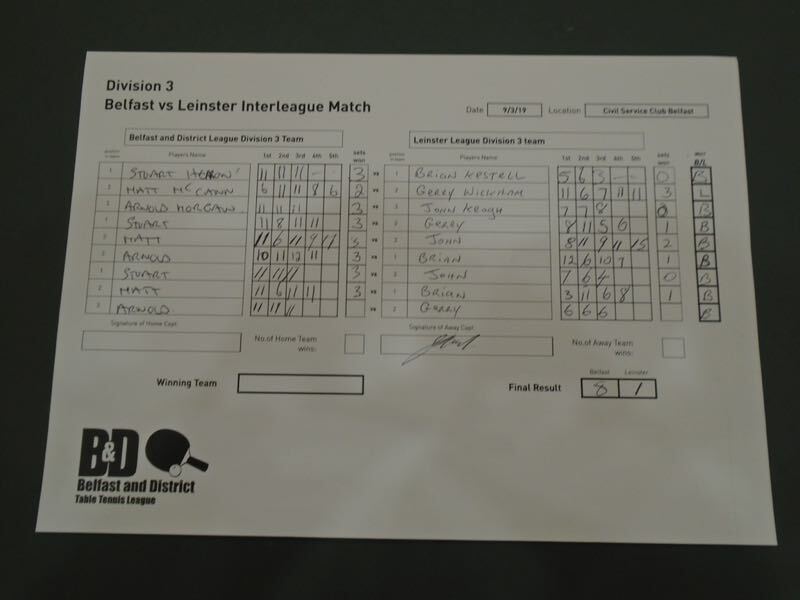 Belfast now led 3-1. 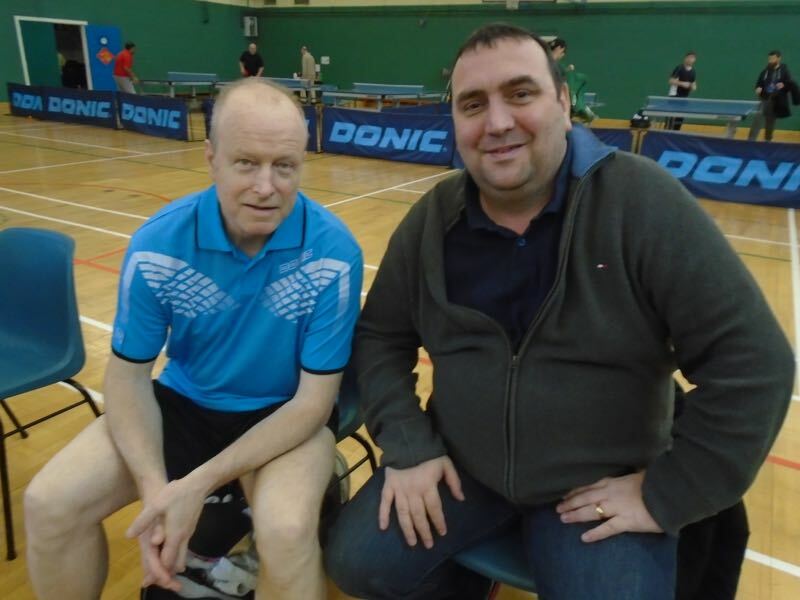 Rodney beat Stephen in a real close 3 setter to give Belfast a lead of 4-1. 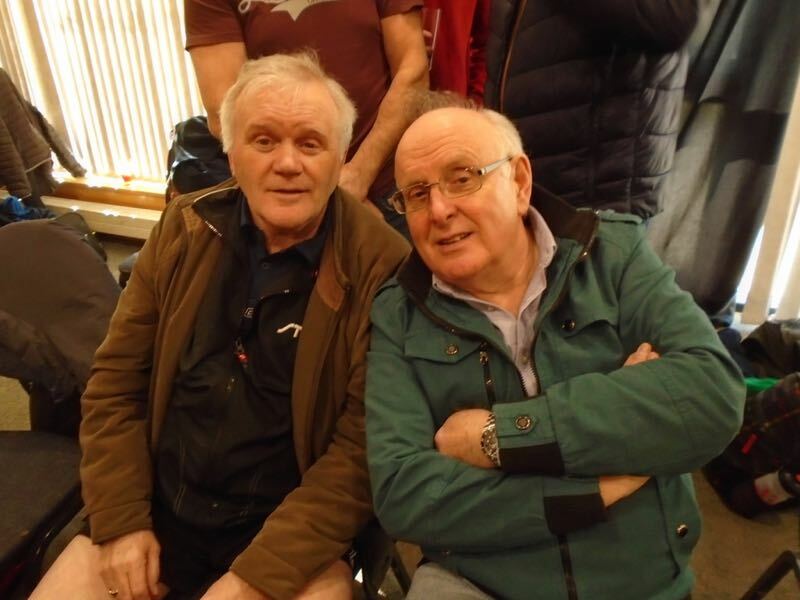 Brian kept Leinster in the game beating Willie. 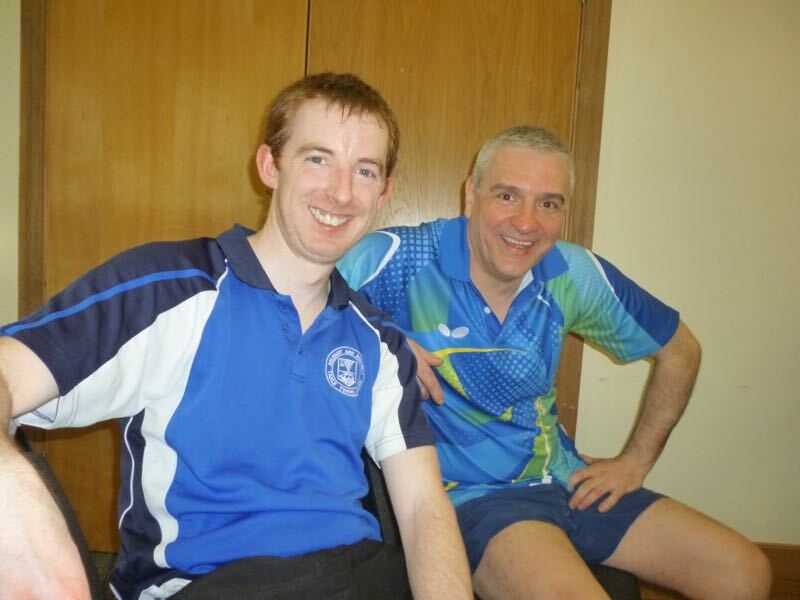 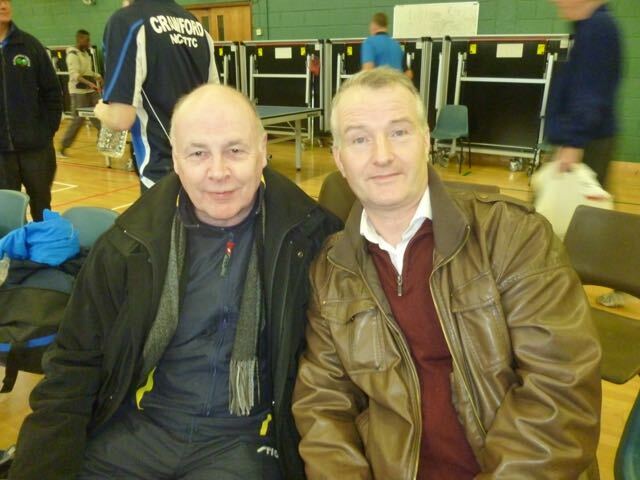 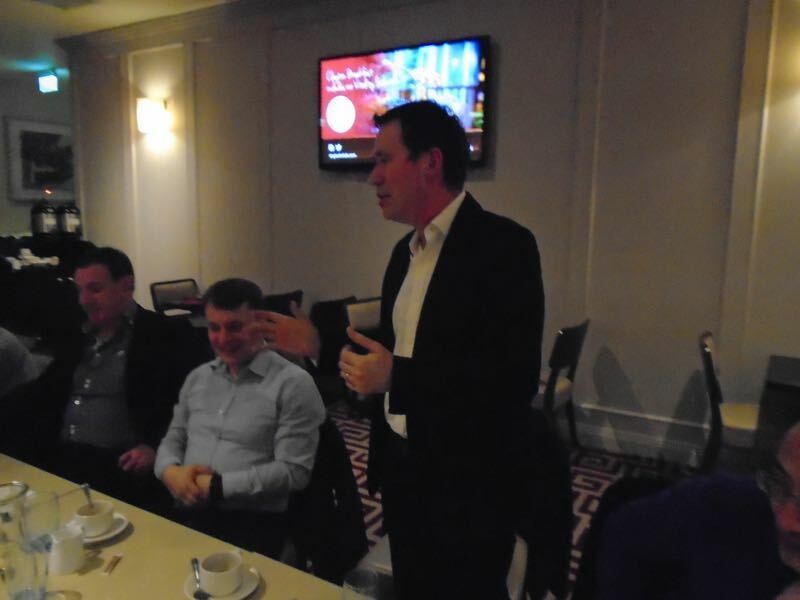 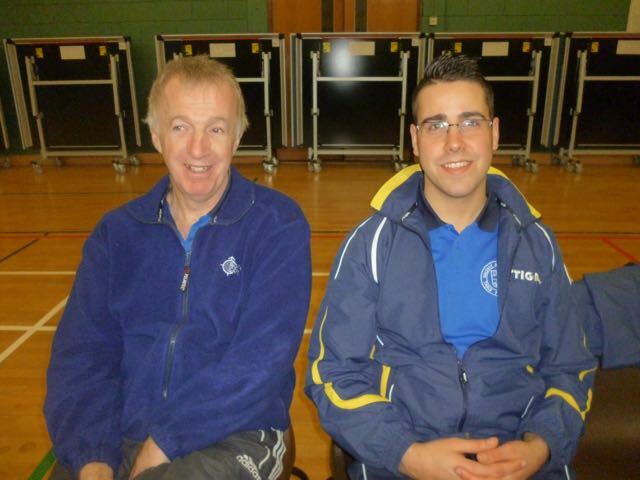 Unfortunately for Stephen, Philip’s confidence was at a high and he beat him in 4 sets, which gave Belfast the match. 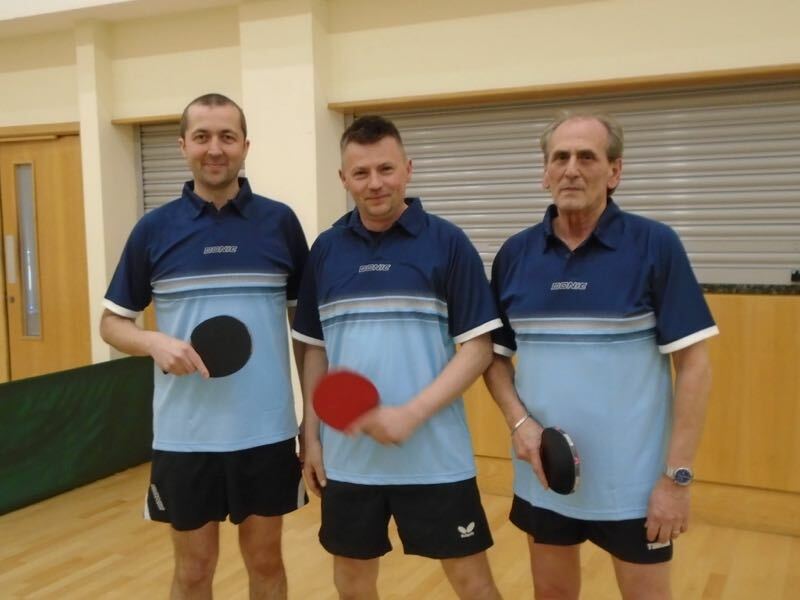 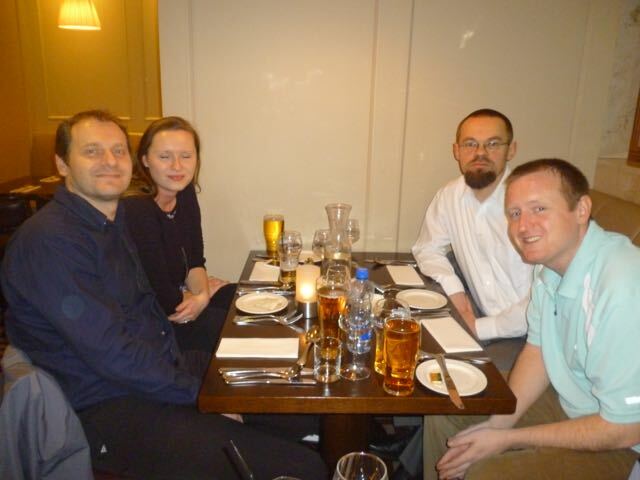 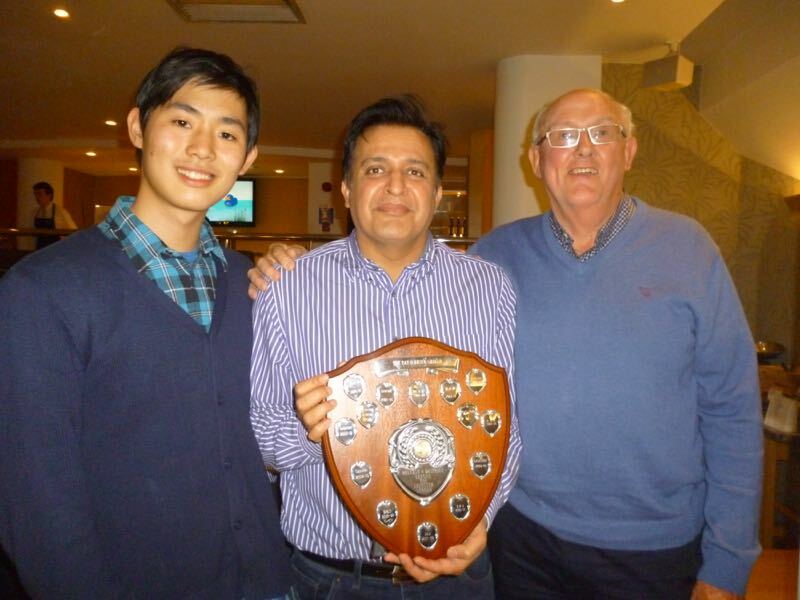 The last two games were played and Marius and Brian both won in straight sets. 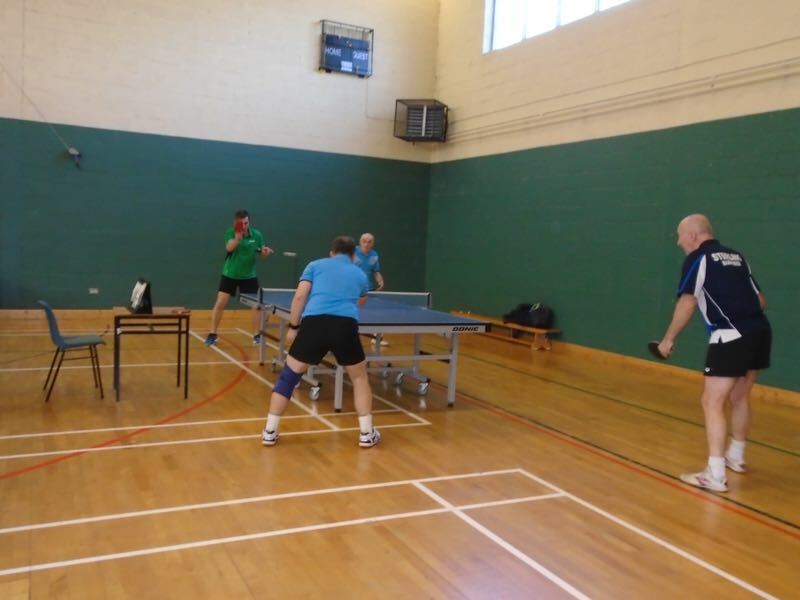 Belfast got off to the better start with Adrian Aetris beating Greg in the 4th set. 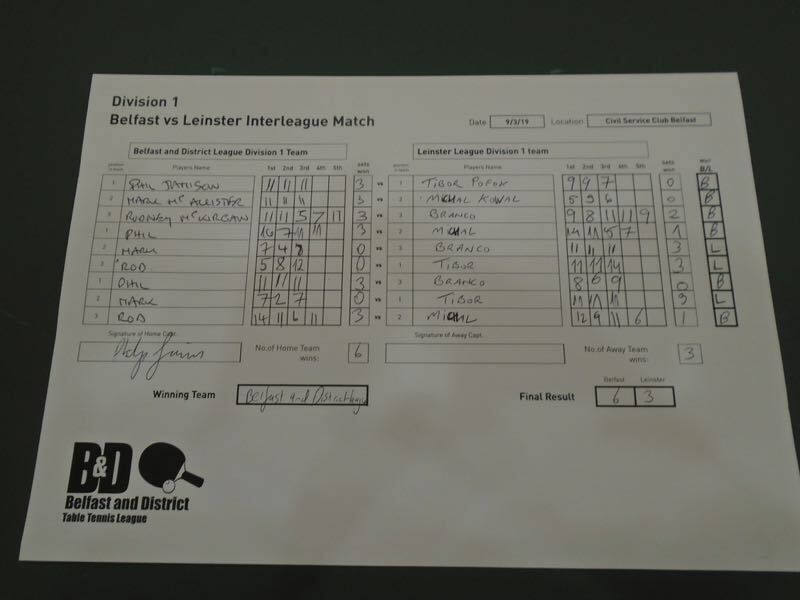 We didn’t fare much better in the next one either with Yingjie losing to Alec Butarsk in straights giving Belfast a 2-0 lead. 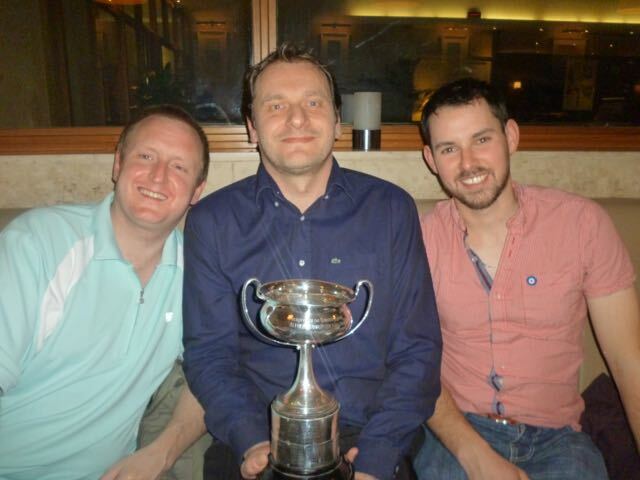 The ever reliable Barney didn’t let us down and beat Syd Beasant in straights. 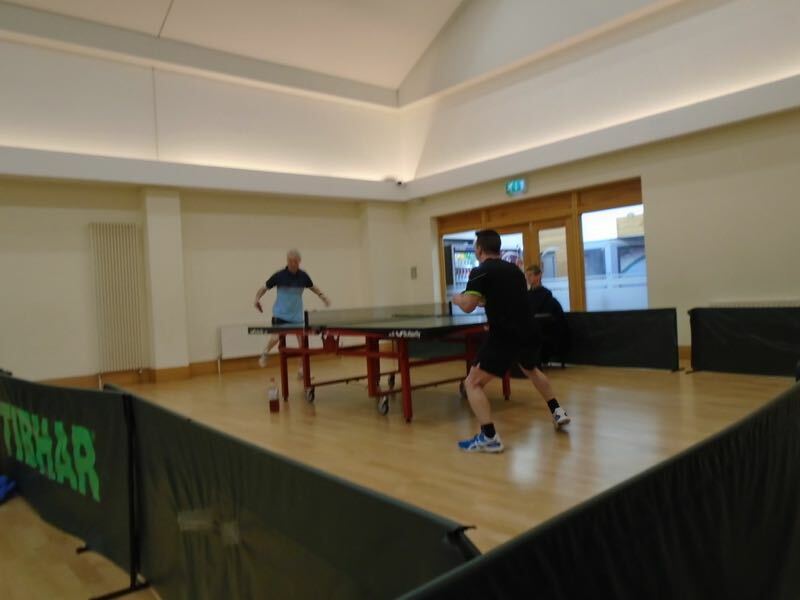 Greg had a close one against Alec but lost. 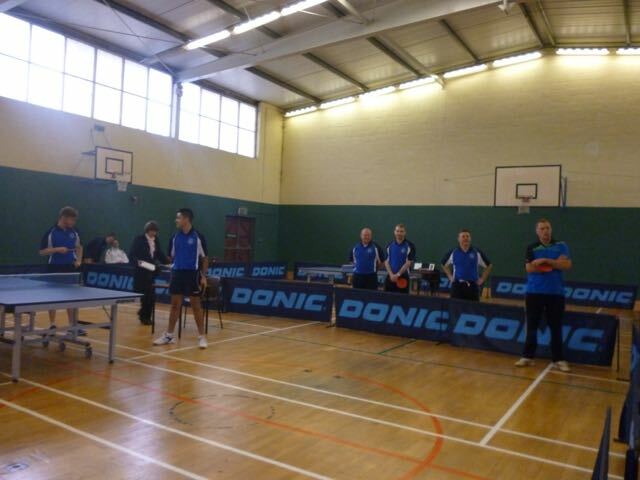 Barney again kept us in the match with an easy win over Adrian to make it 3-2 to Belfast. 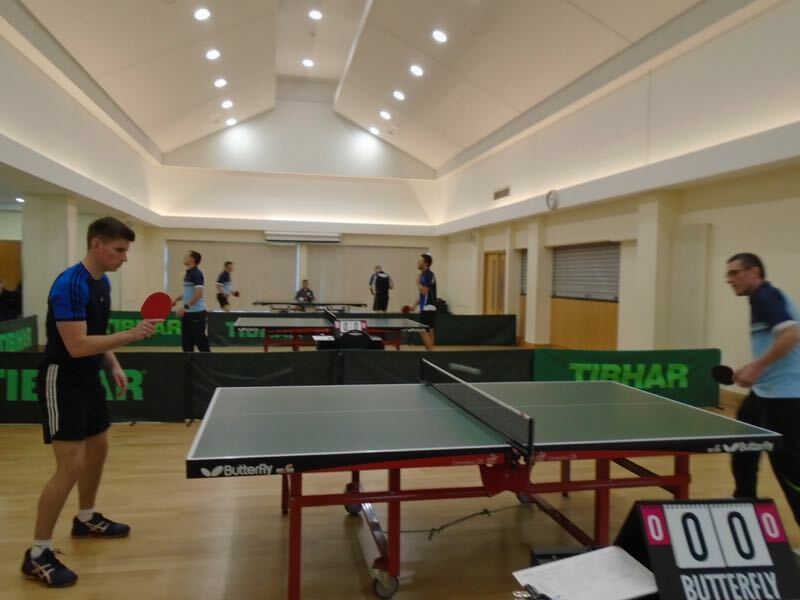 I thought we were in trouble again when Yingjie lost the first set to Syd but he played well to win the next three making it 3-3. 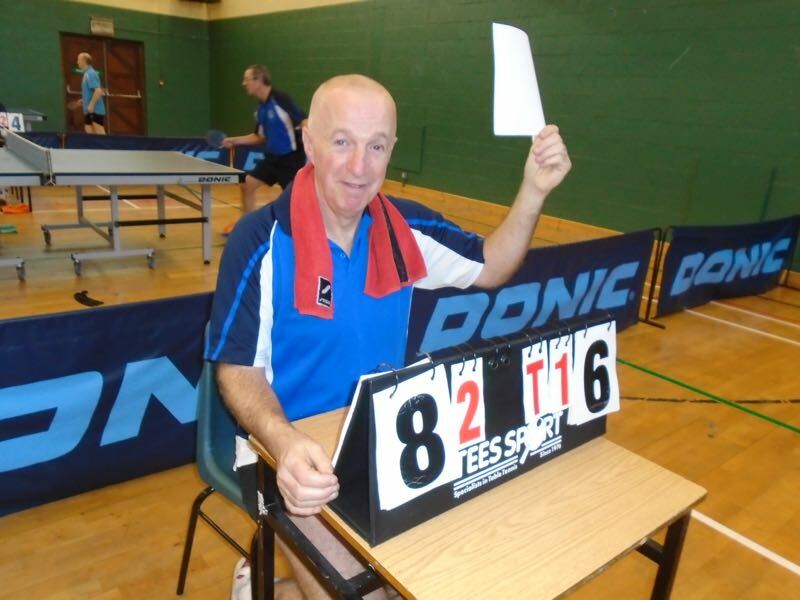 Alec had a great straight sets win over Barney with a first set score of 17/15 to give Belfast the lead once again. 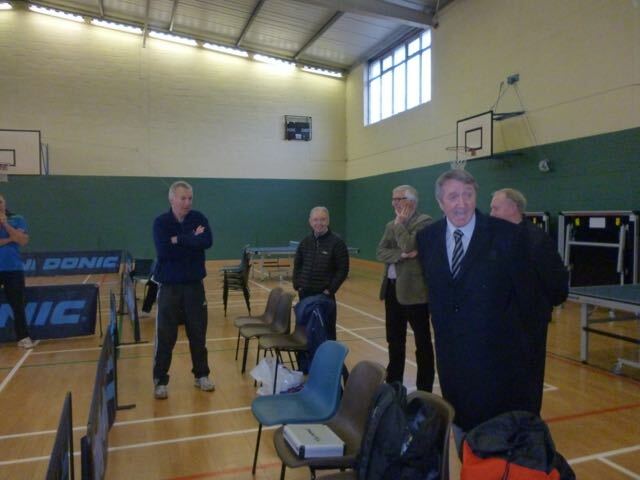 The next match was crucial. 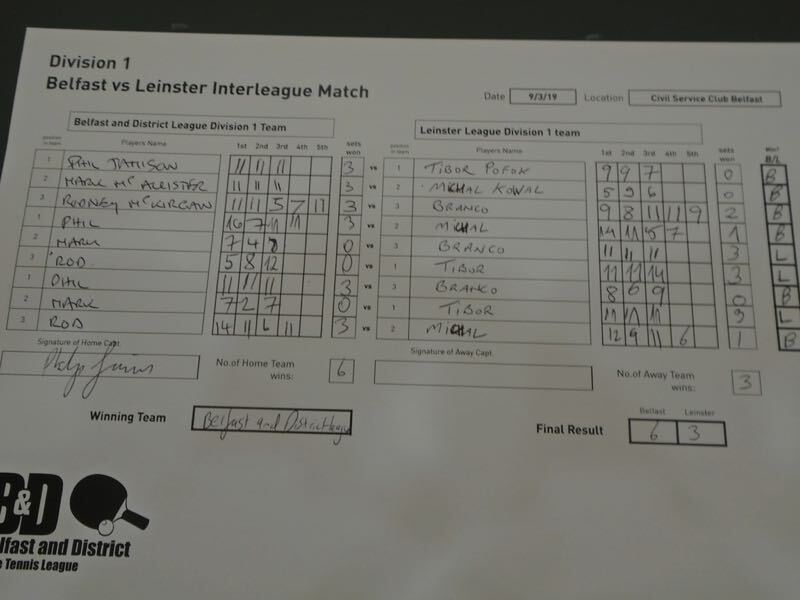 Leinster couldn’t afford to lose it. 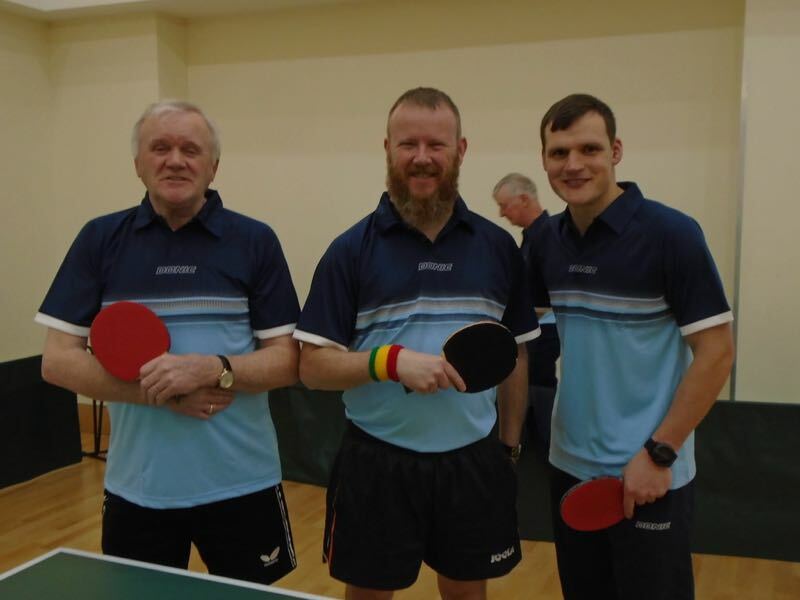 Syd won the first 2 sets easy but Greg came good and won the next three making it 4-4. 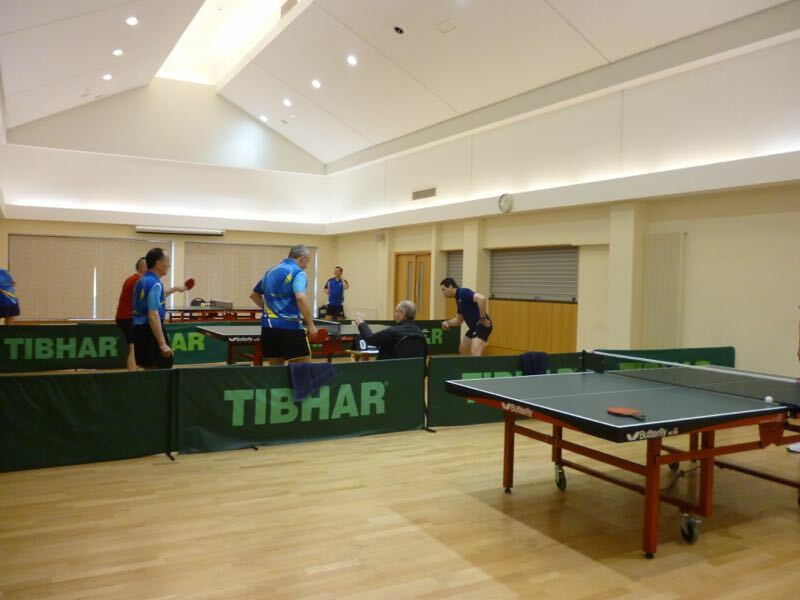 So it was all down to the last game between Adrian and Yingjie. 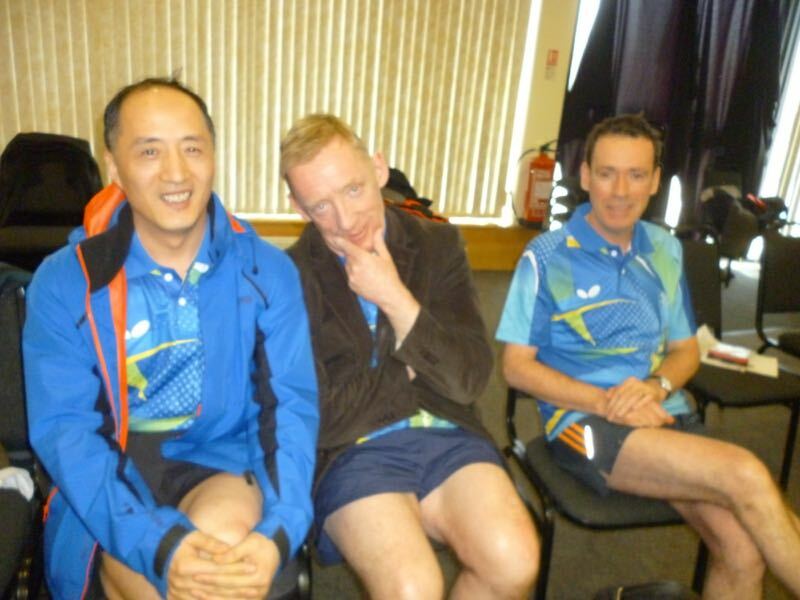 Adrian started well winning the first set 11/6 but well done to Yingjie for coping with the pressure and winning the next three sets giving Leinster the win. 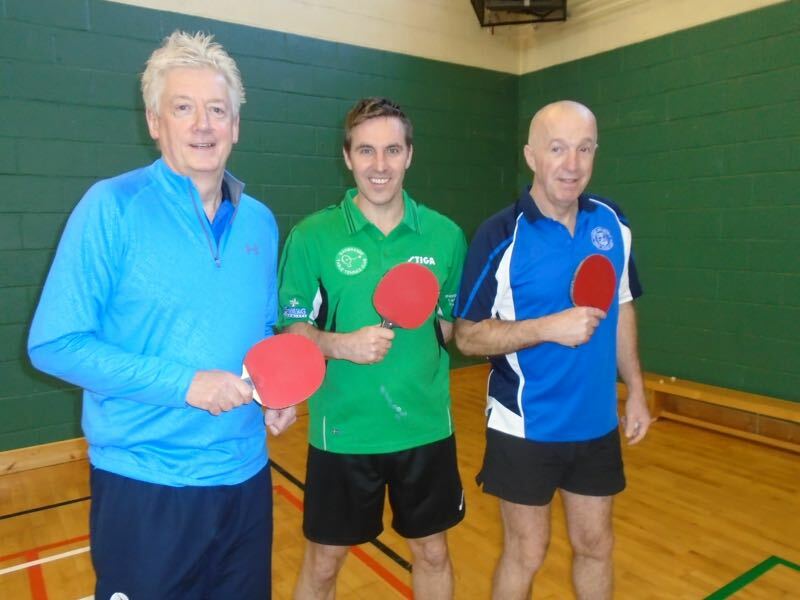 As in last year’s division 3 match this was another nail biter. 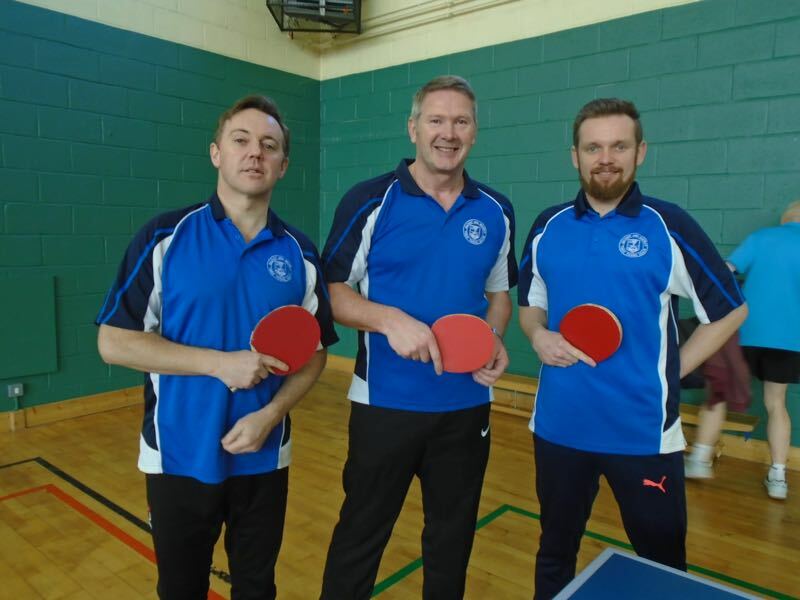 John Smith got Leinster off to a great start with an easy win over Ivor Kirk but Belfast fought back straight away with Yuyo Go beating John Mc Cormack in a close three setter. 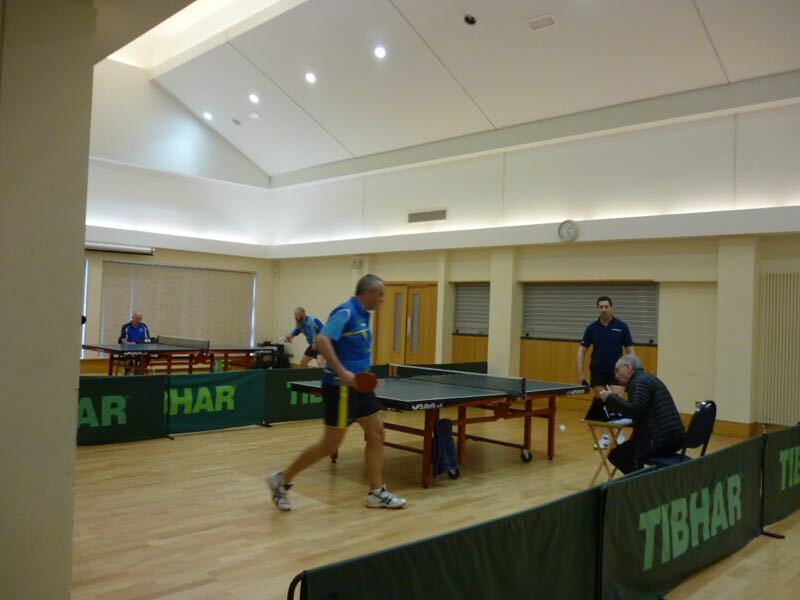 The next was just too close to call but Ranjit Singh pipped it over Aengus 17/15 in the 5th. 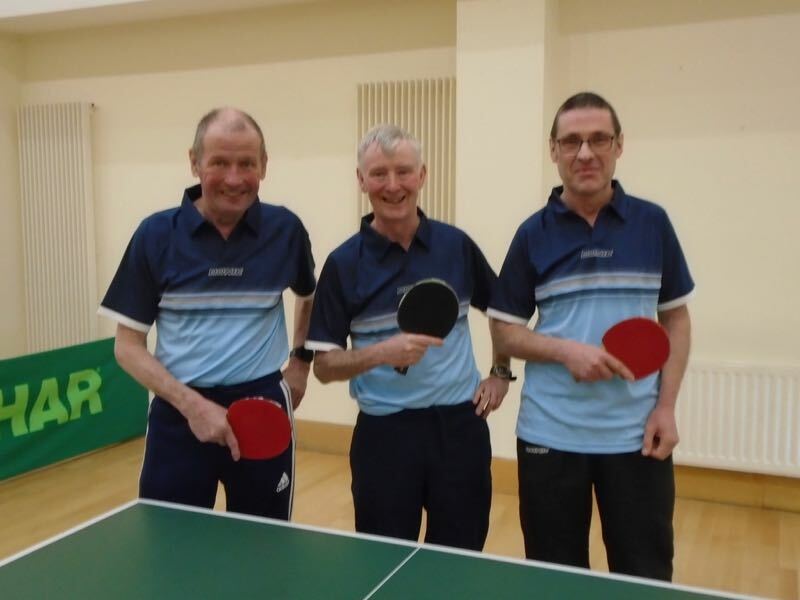 Yuyo was playing so well we knew the next game was going to be a tough one but John (S) also played really well and won it 11/13 in the 4th to make it 2-2. 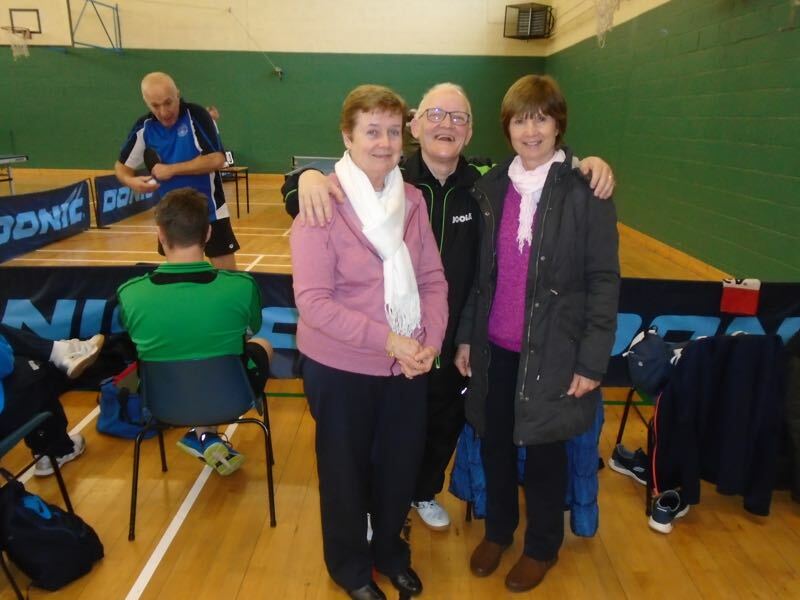 Aengus was once again involved in a 5 setter and once again he was on the wrong side losing 11/8 in the 5th. 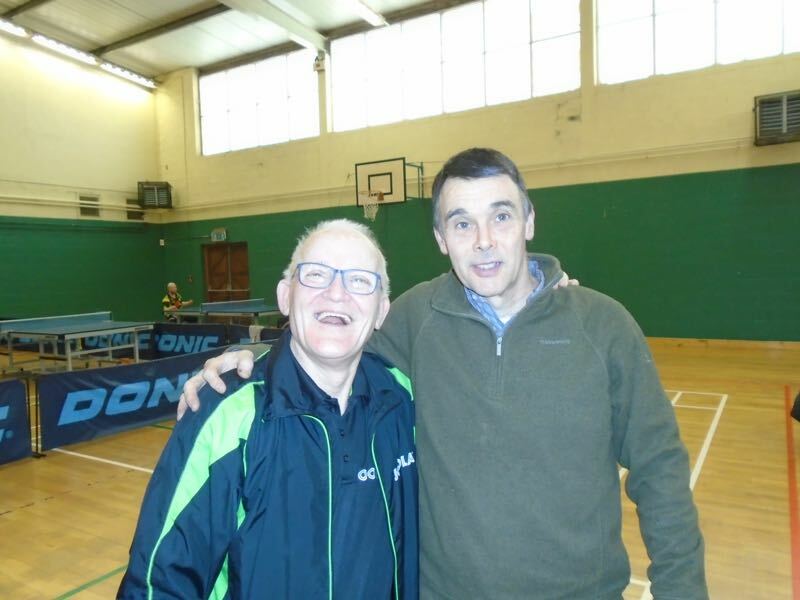 John Mc had a straight sets win over Ranjit to make it 3-3. 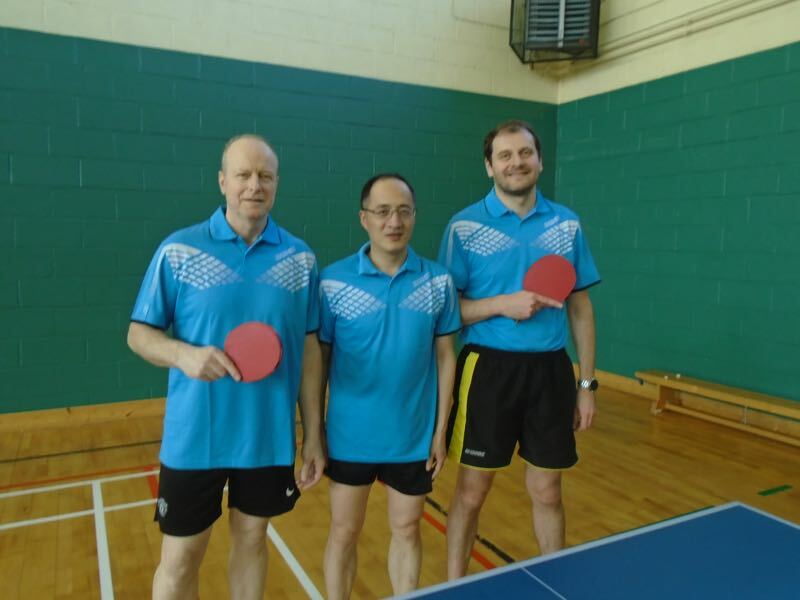 Yuyo beat Aengus in straights and John (S) also won in straights against Ranjit, the score in the 2nd set in that game being 18/16. 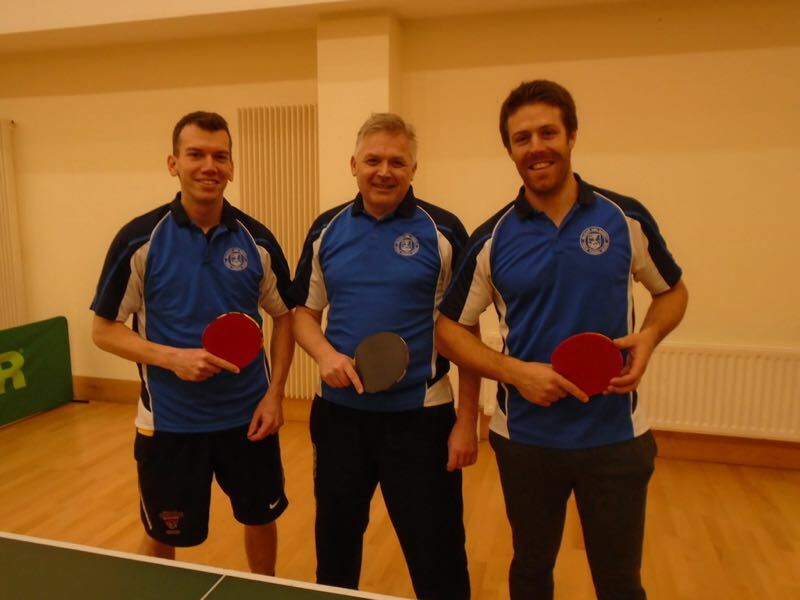 It was now 4-4. 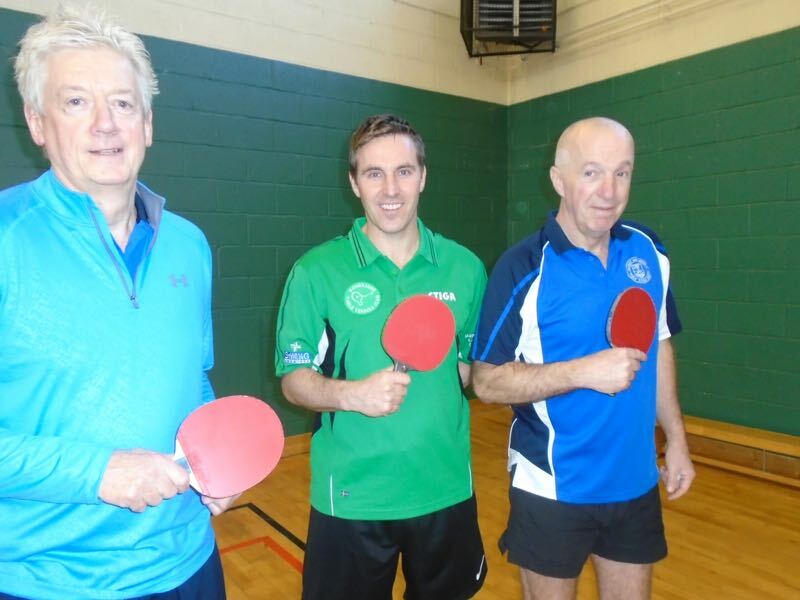 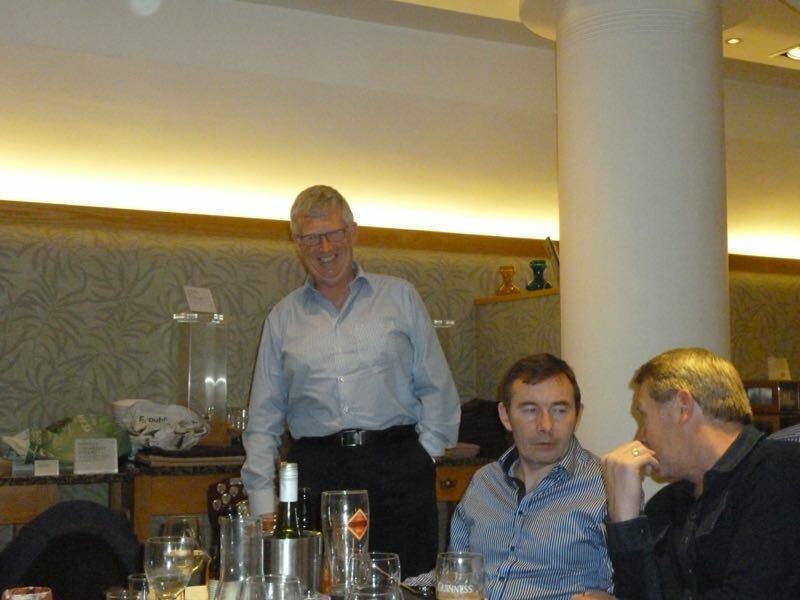 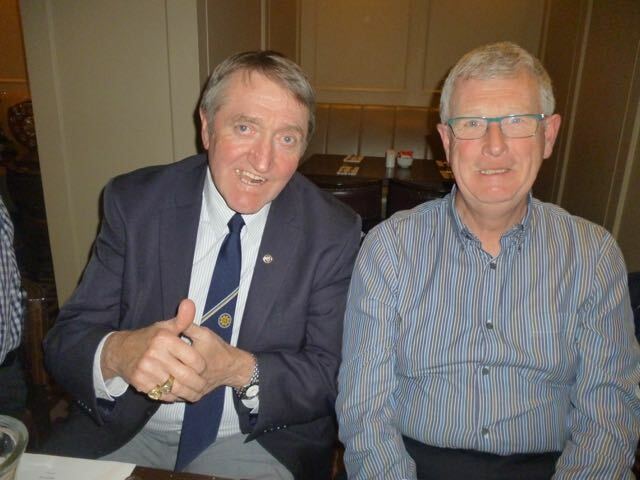 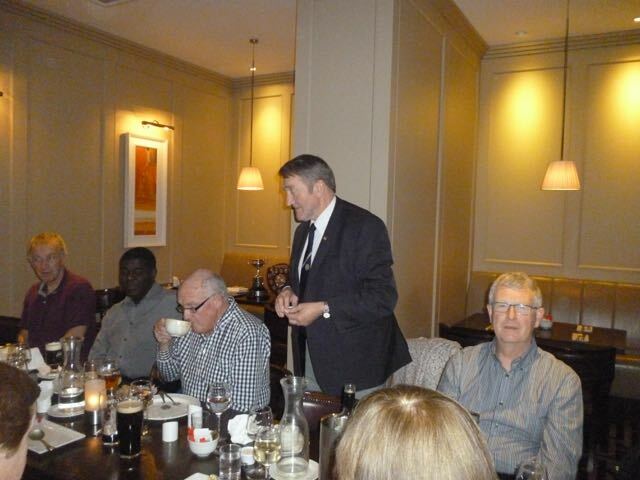 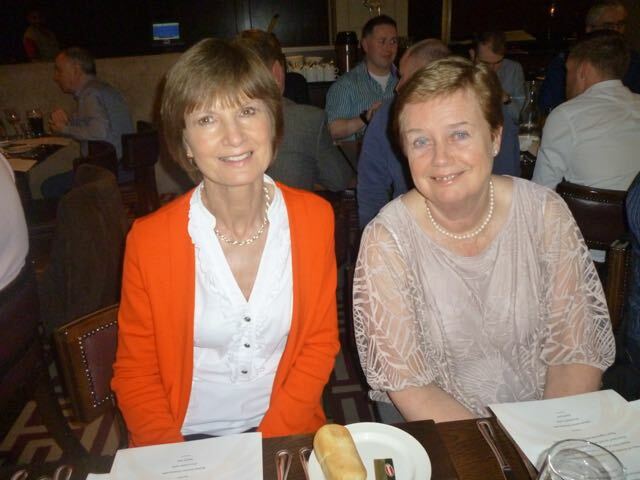 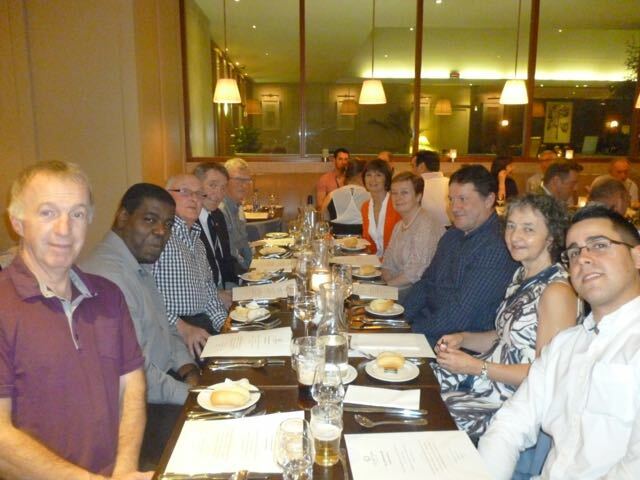 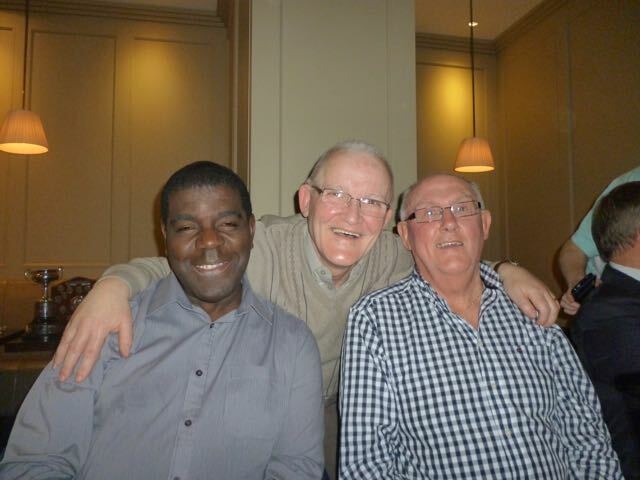 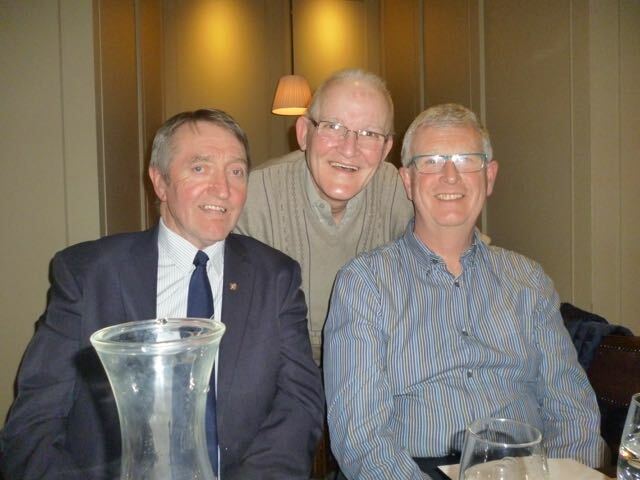 So like division 2 it was all down to the final game so no pressure on Ivor or John Mc. 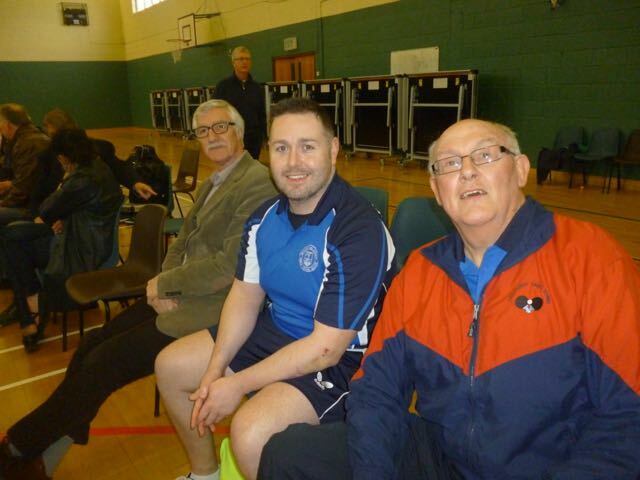 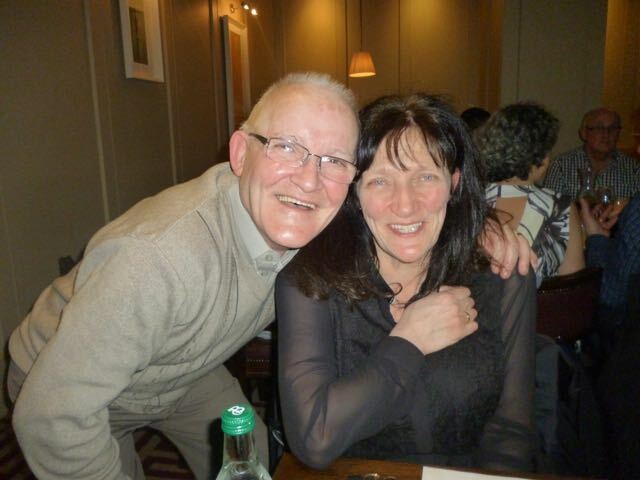 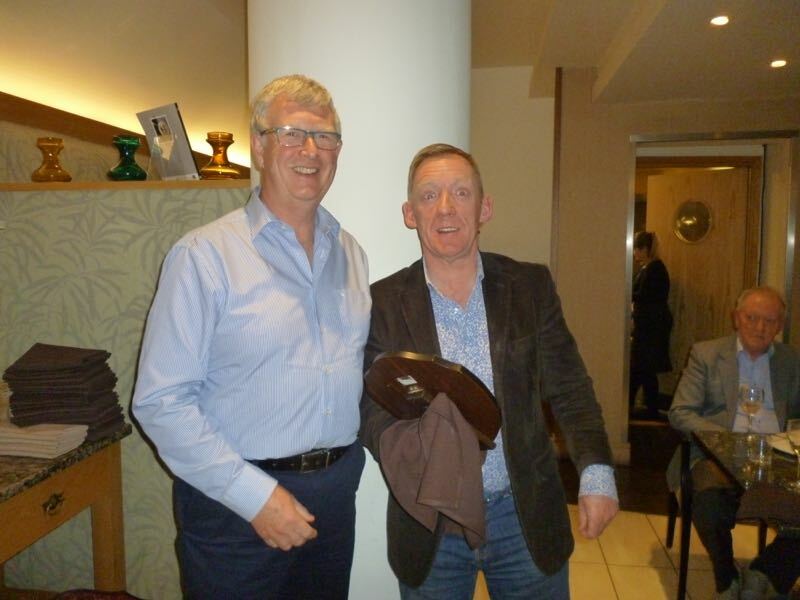 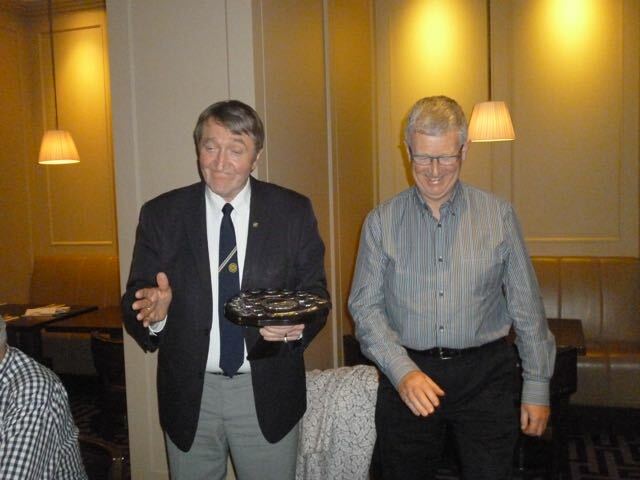 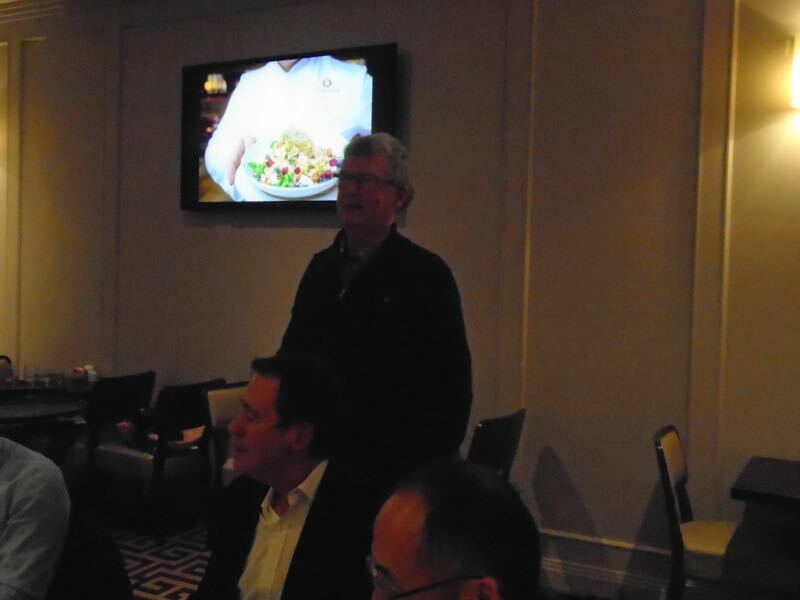 John won the first 12/10 but unfortunately for Leinster Ivor won the next three to give Belfast the match. 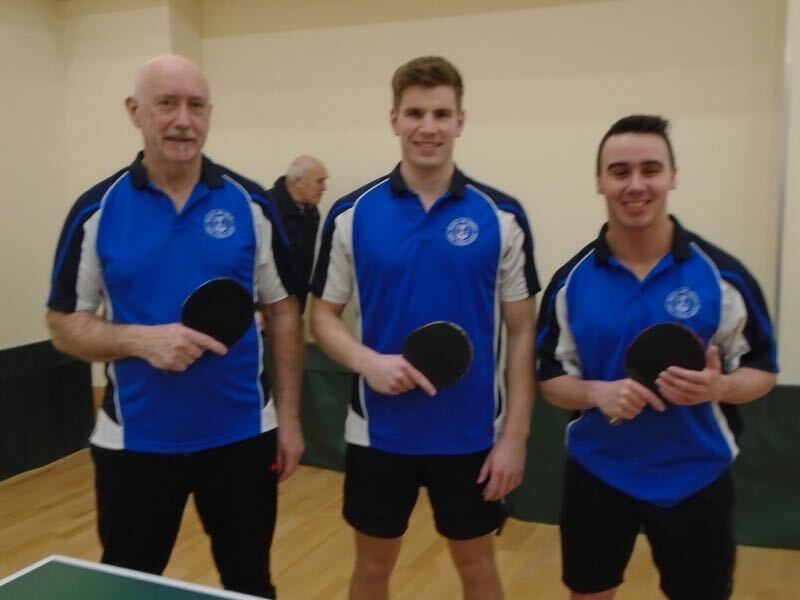 The player of the day was a difficult decision as three players stood out for their outstanding play- Philip Wallace, Alec Butarsk and John Smith. 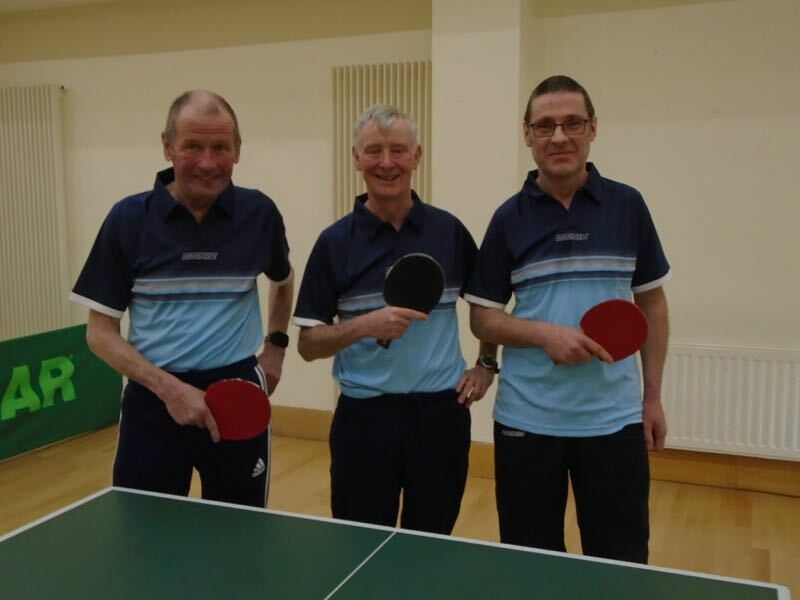 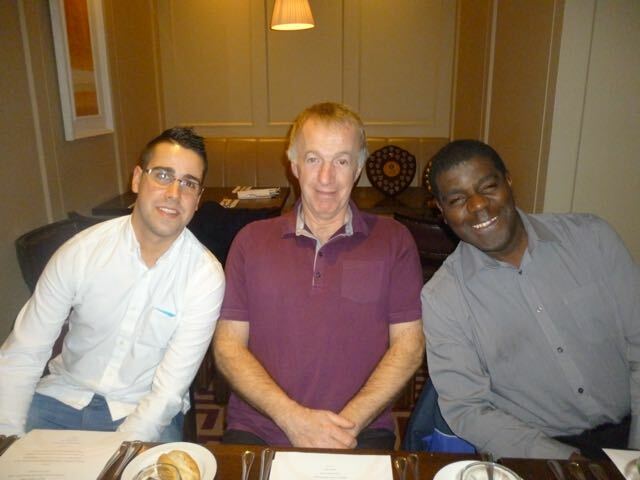 Philip Wallace was chosen mainly for his come-back against both Brian and Marius having been 2 nil down in both matches. 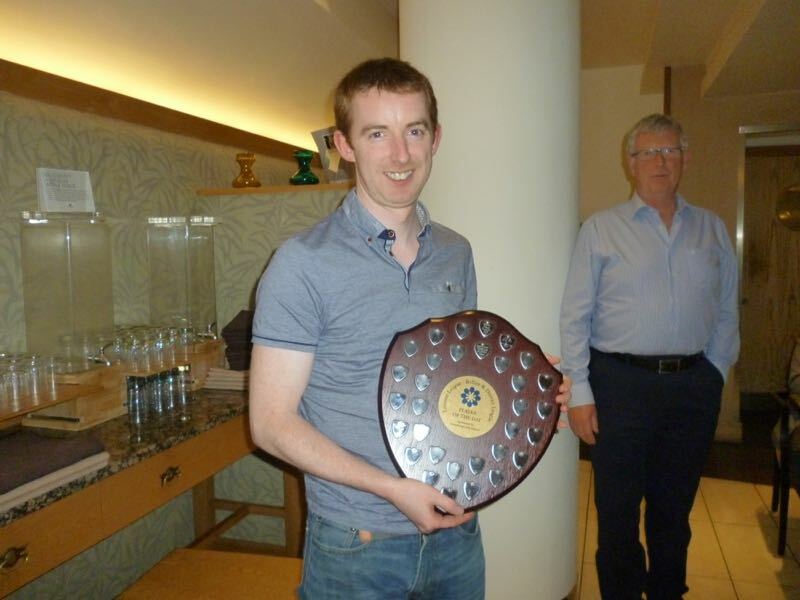 He was presented with the Pat O’Brien individual trophy. 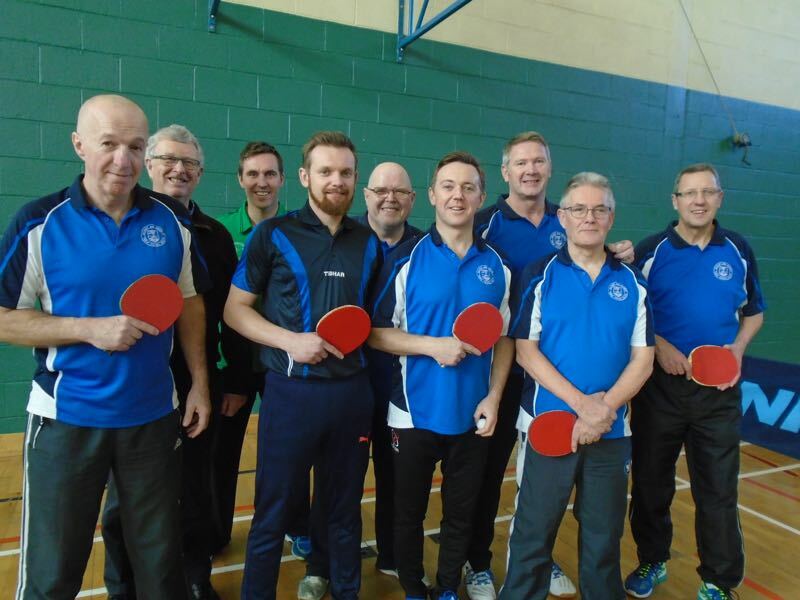 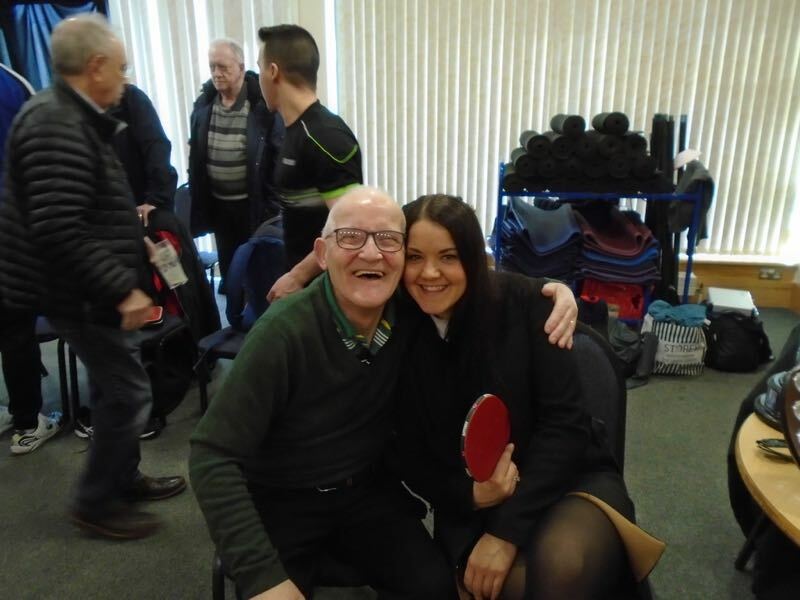 Well done to all the players for giving us such an enjoyable day of table tennis and many thanks to Derek and the Belfast team for their hospitality. 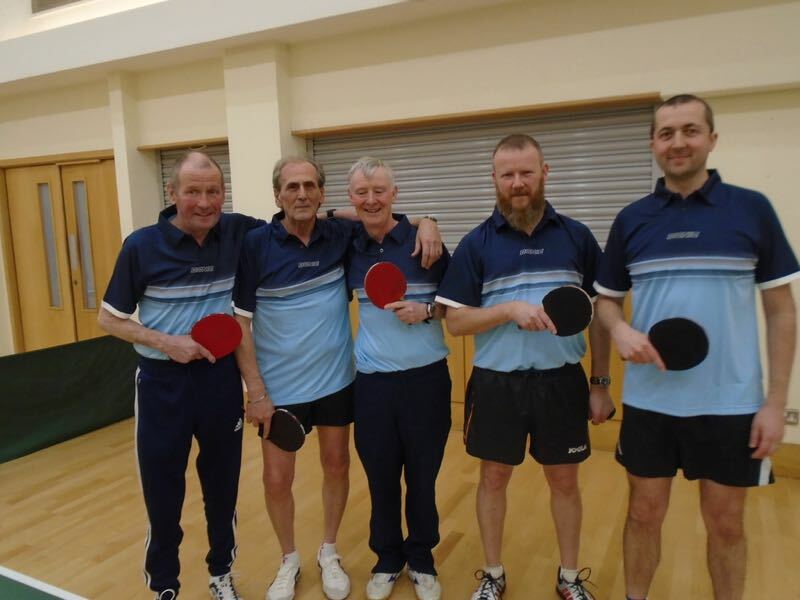 The Belfast v Leinster League match will take place on 25th March, in Belfast. 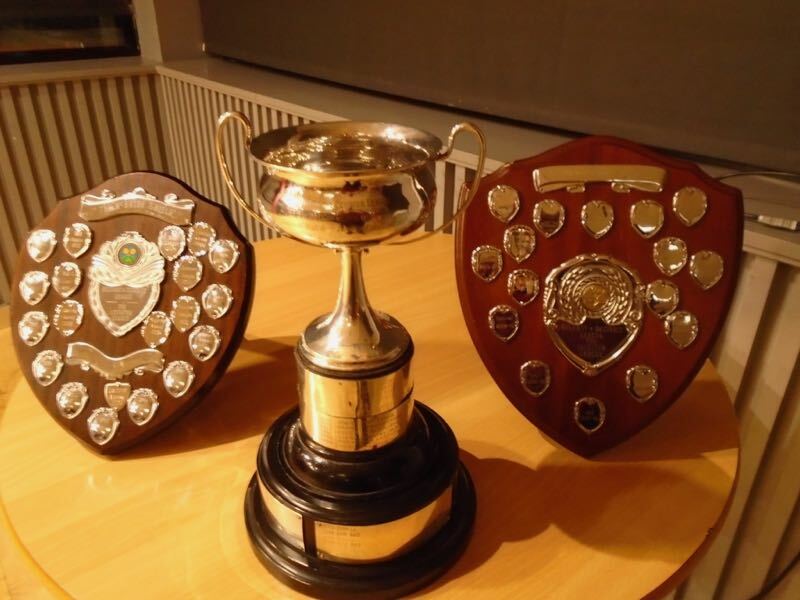 The line-up of teams will be announced closer to the event. 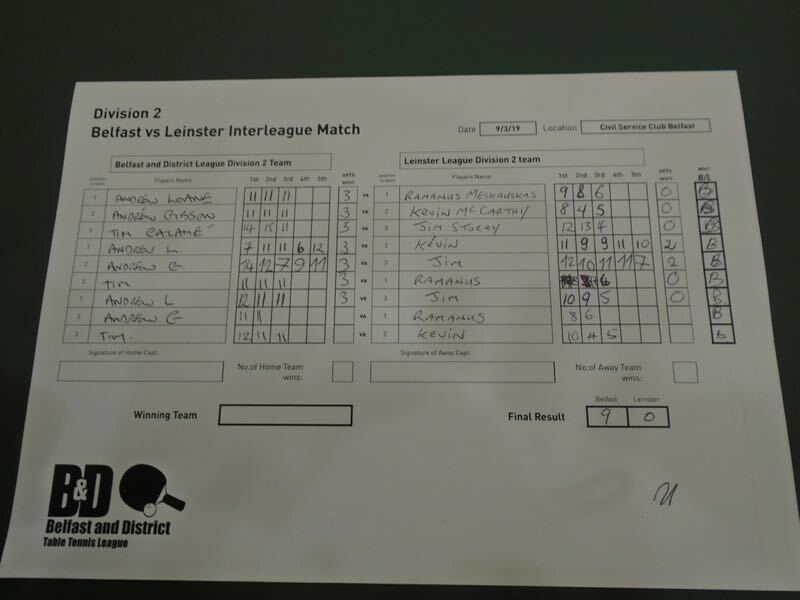 The last time it Belfast hosted the match in 2015, it was a very close match, with Leinster winning the Division 1 match 6-3, and narrowly losing the Division 2 and 3 matches 5-4. 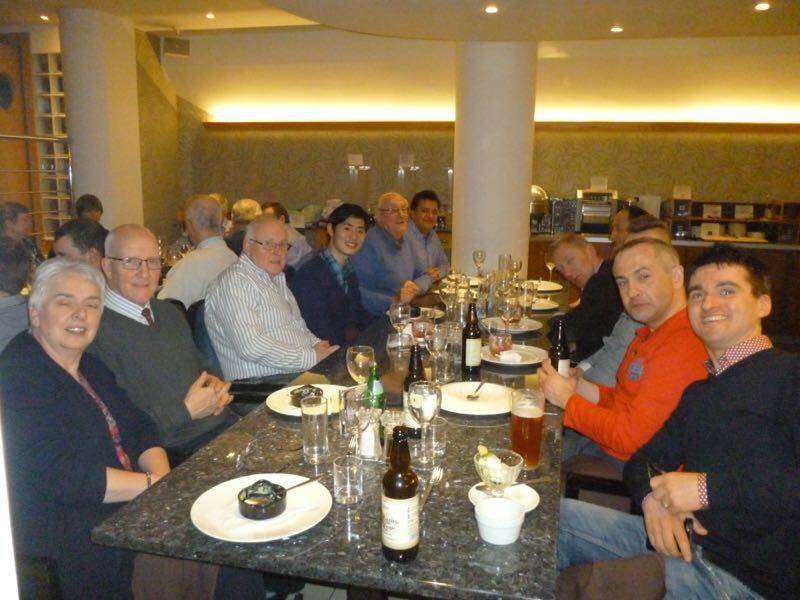 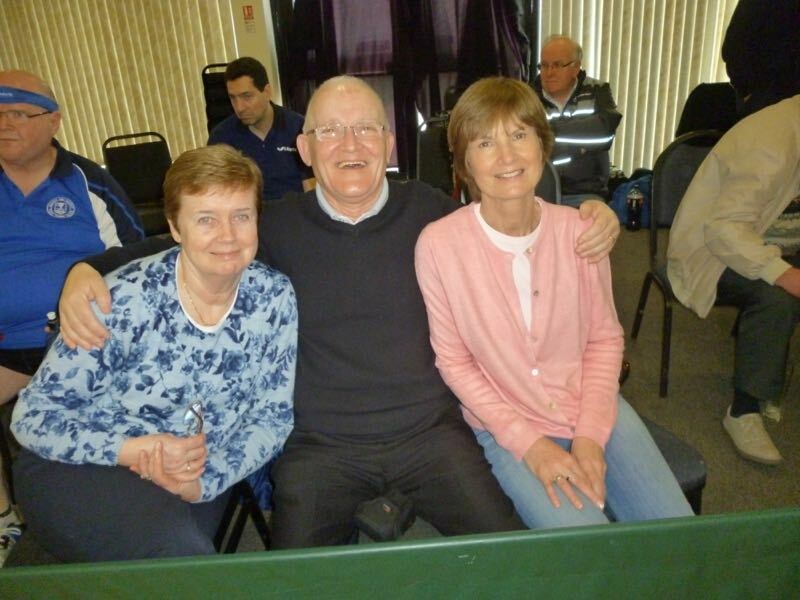 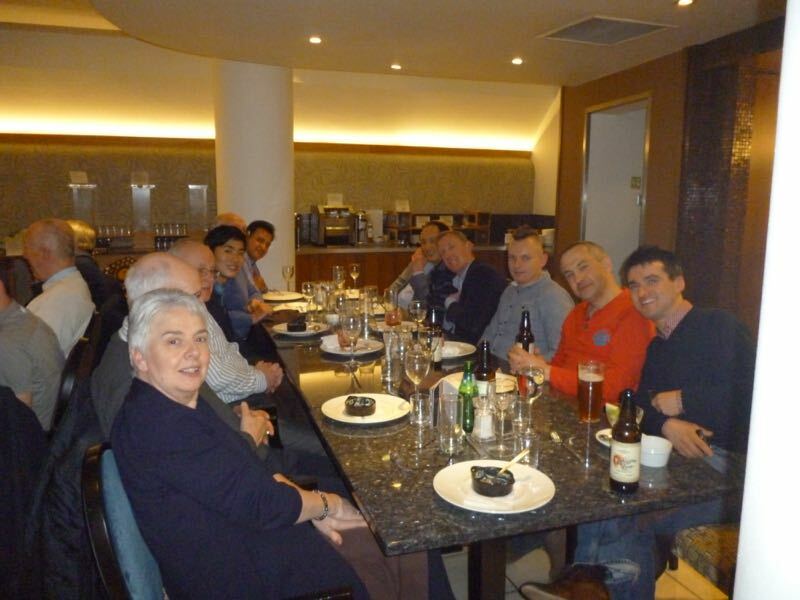 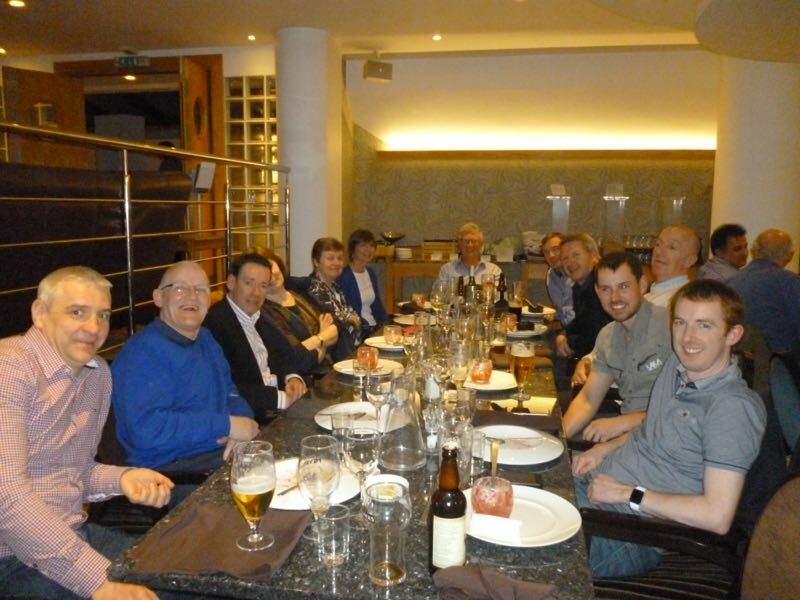 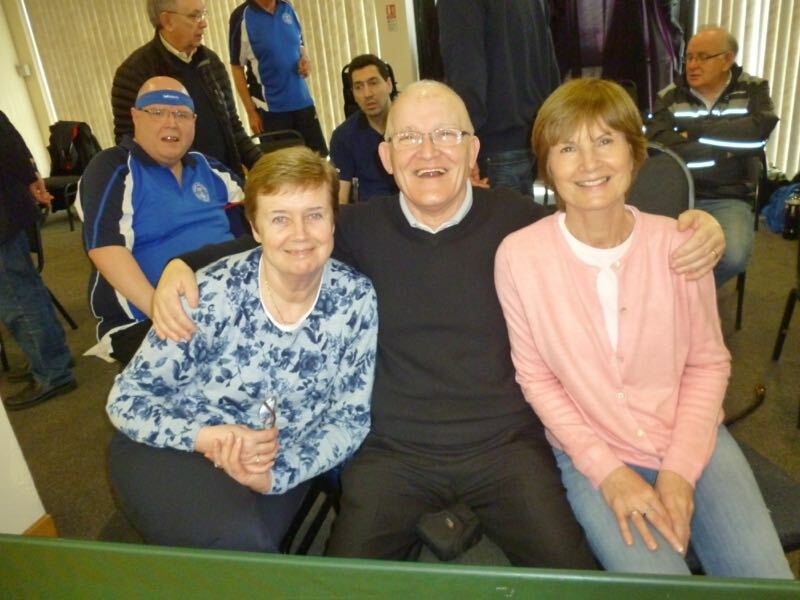 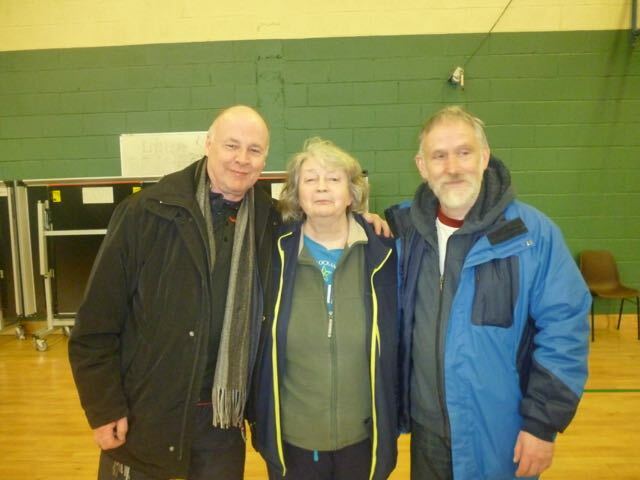 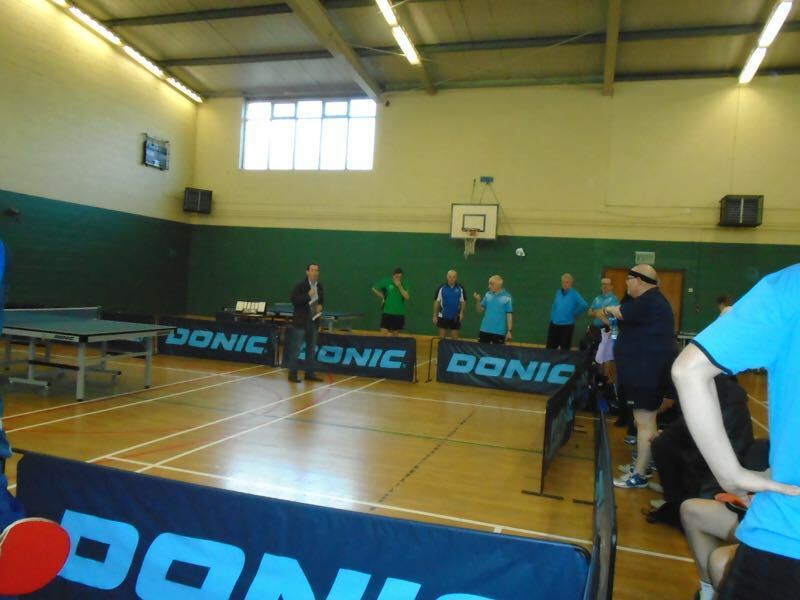 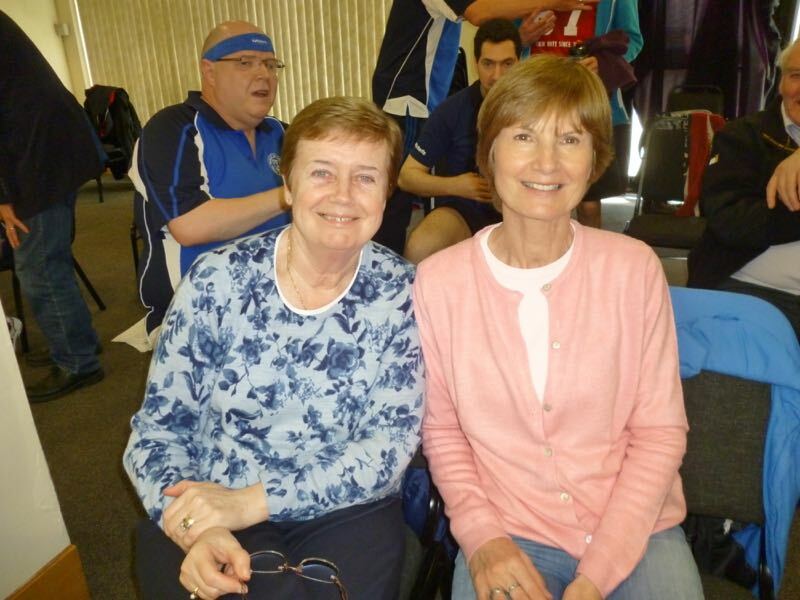 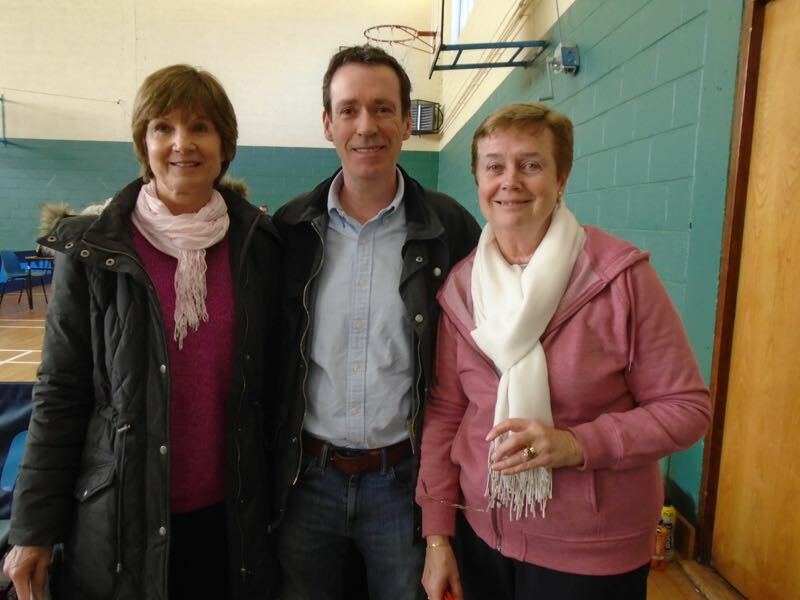 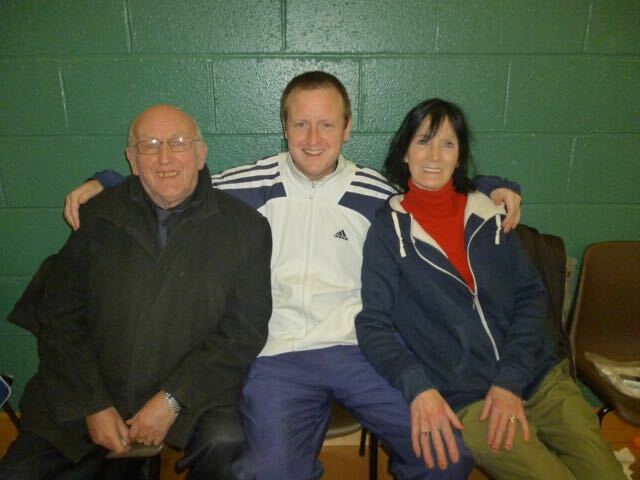 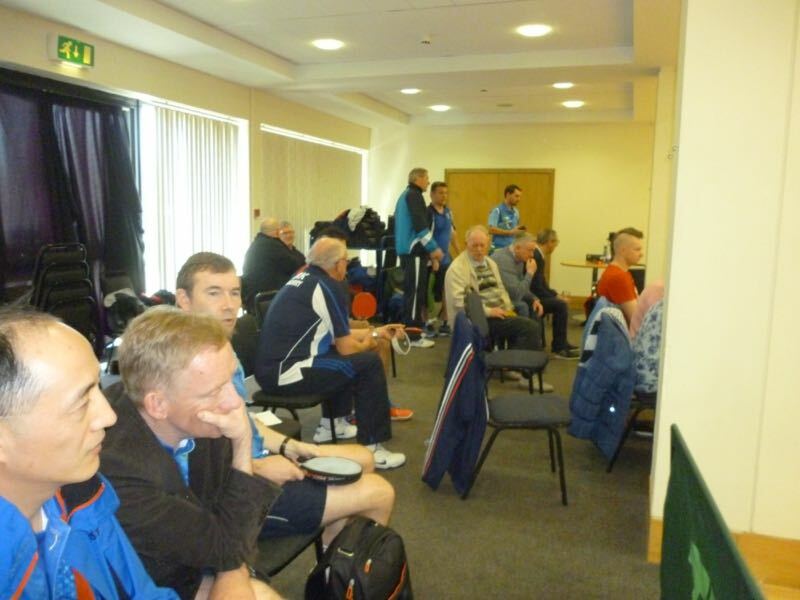 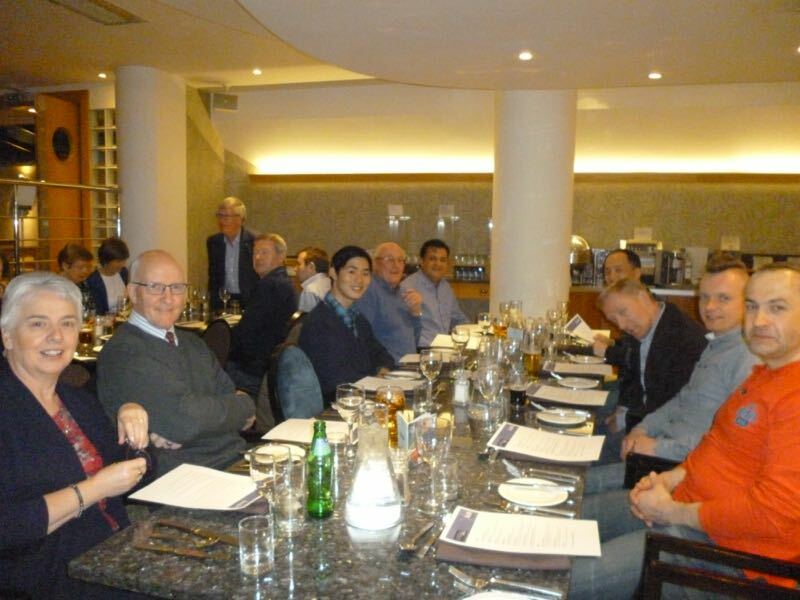 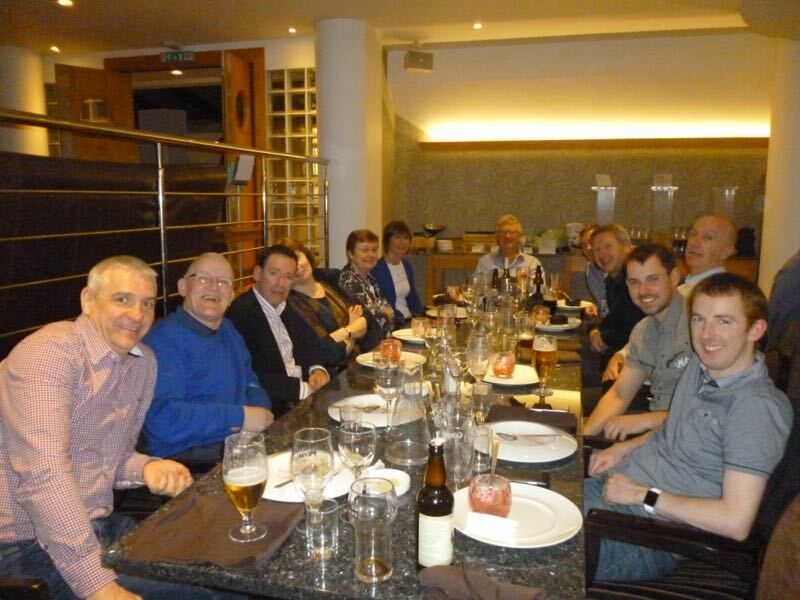 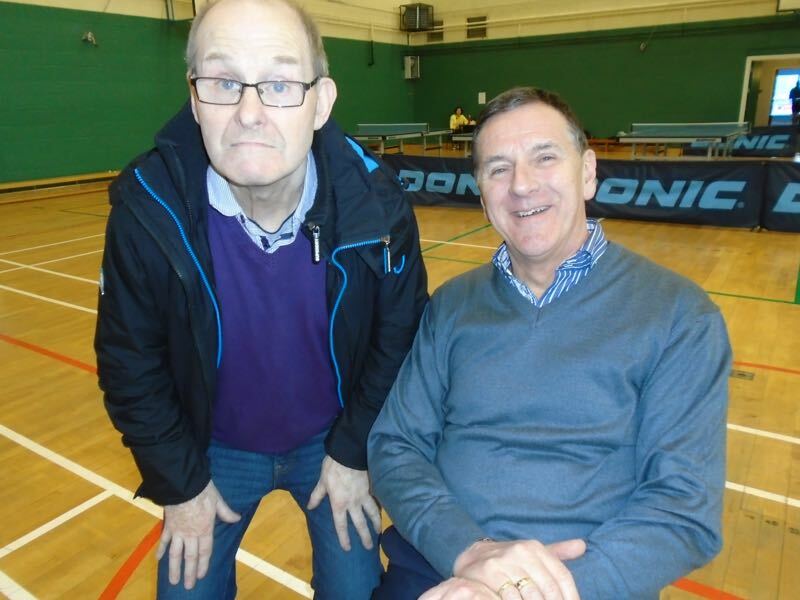 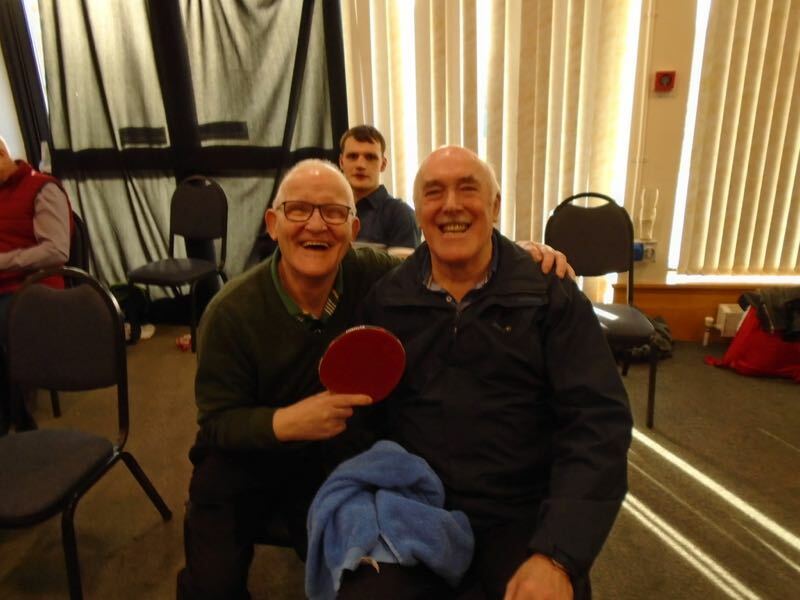 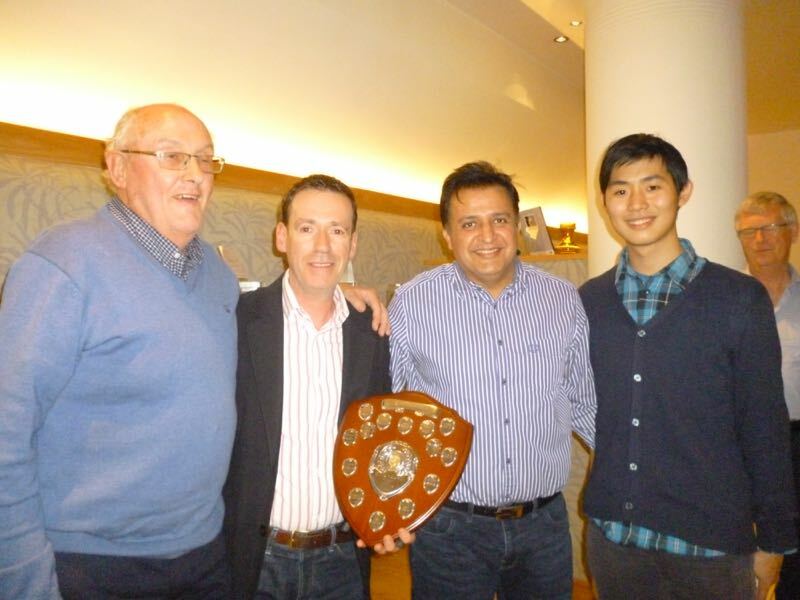 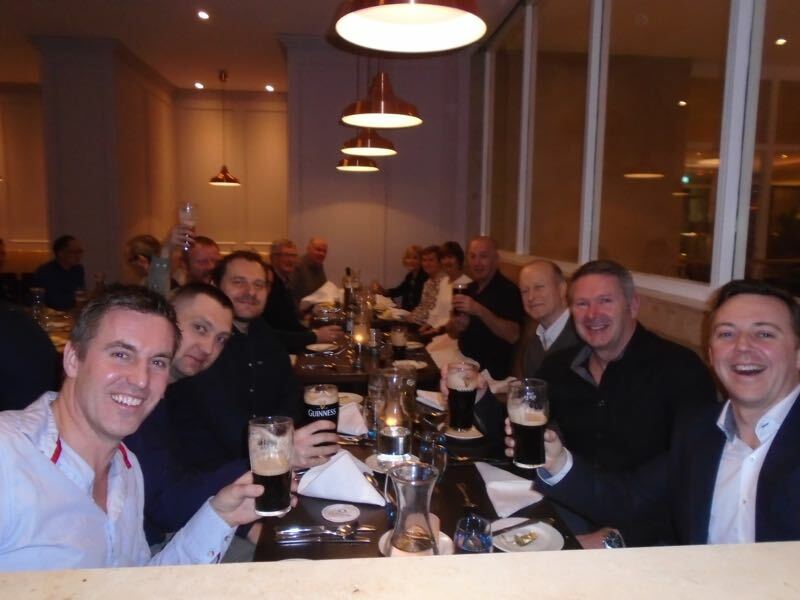 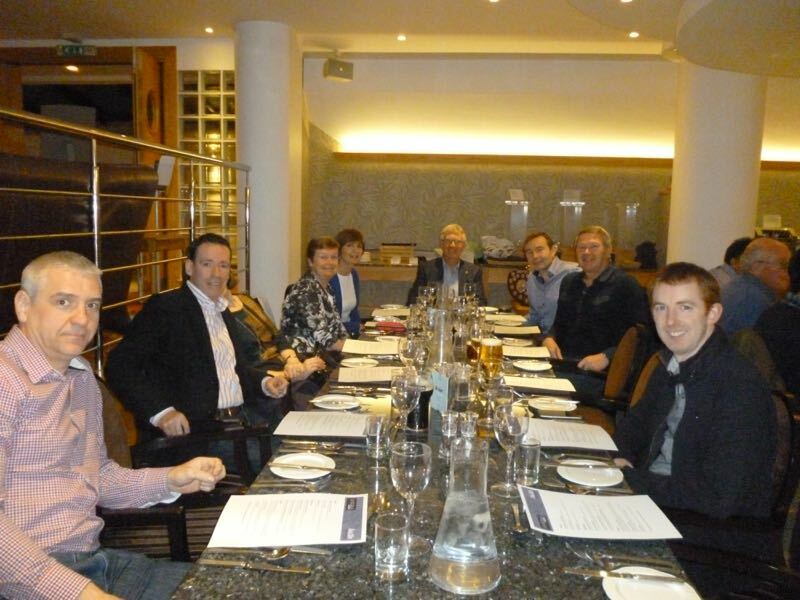 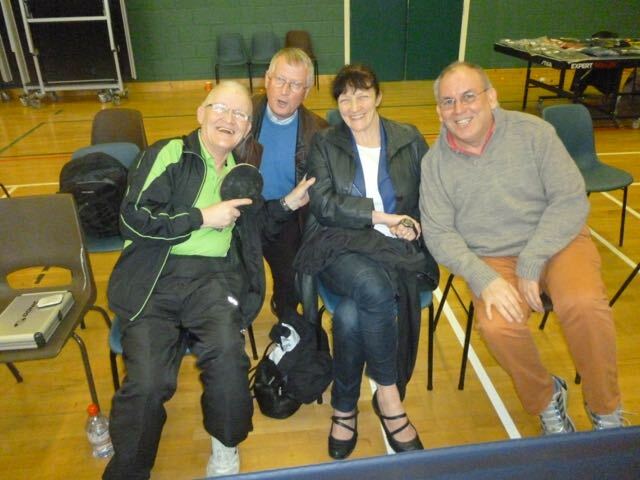 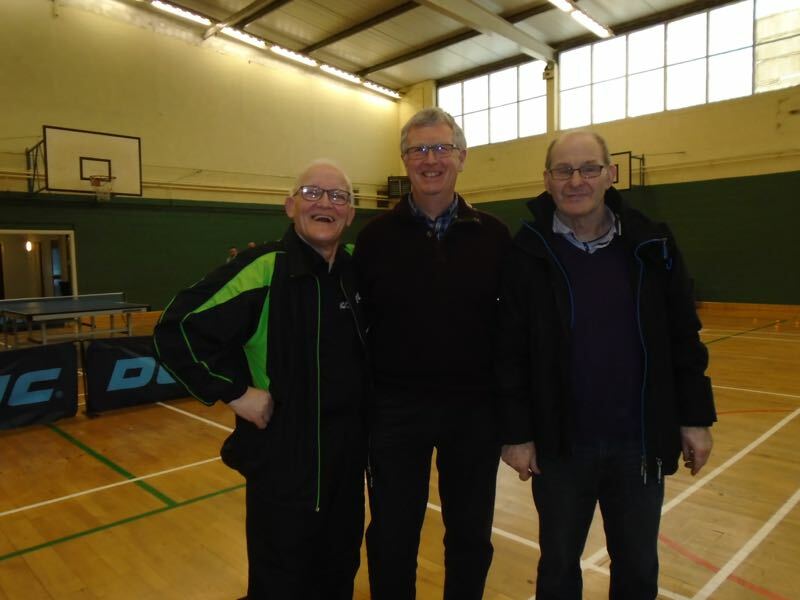 Photos from the Leinster League v Belfast & District League match took place in PingZone Table Tennis Club on Saturday 27th February 2016.